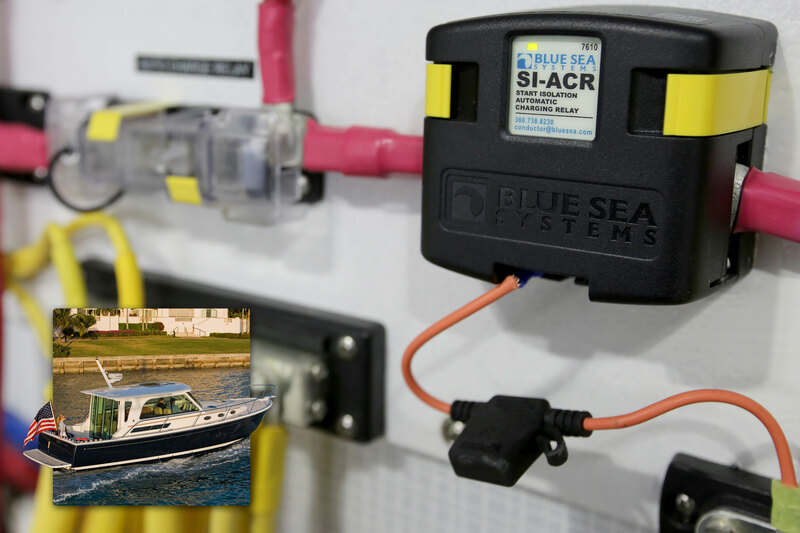 Blue Sea Systems is specified and installed as original equipment aboard the world’s leading brands of boats, vehicles, and renewable energy platforms. 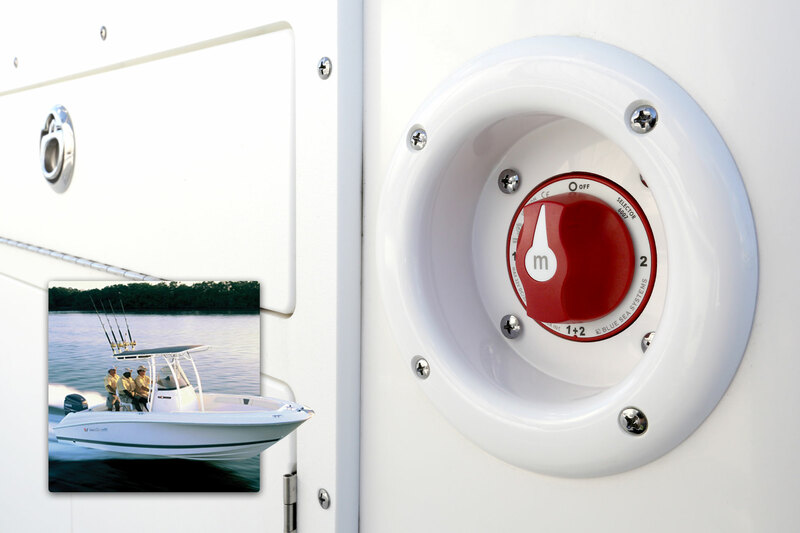 AB Inflatables uses the m-Series Selector Battery Switch on the Oceanus 28VST. 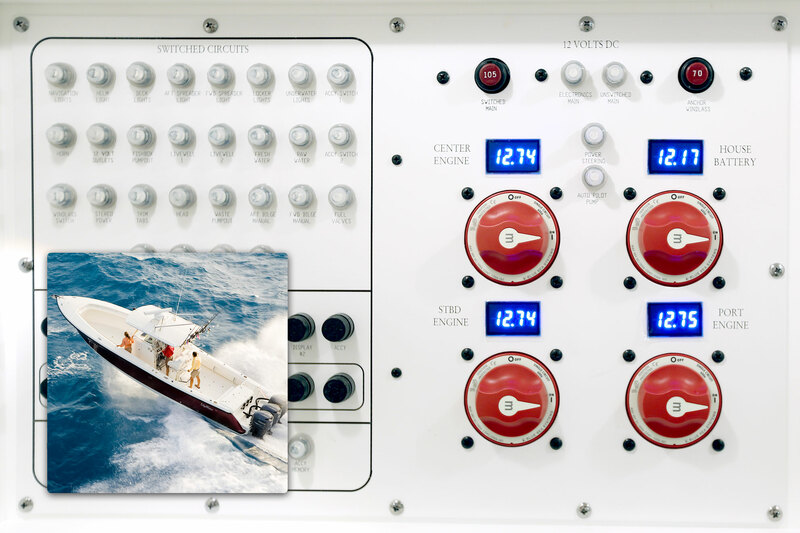 The Albury Brothers use waterproof WeatherDeck® Fuse Panels on the Albury 23 center console. 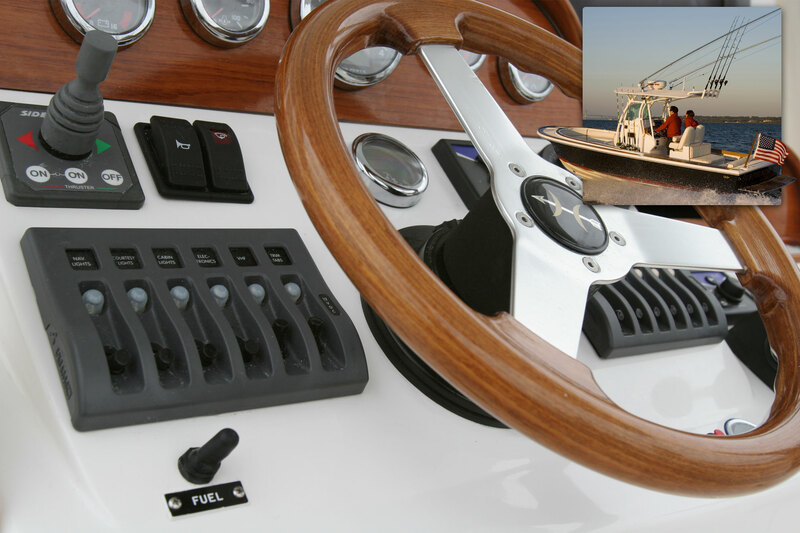 American Tug uses Custom 360 Panels aboard their trawlers, including the 435 Limited. 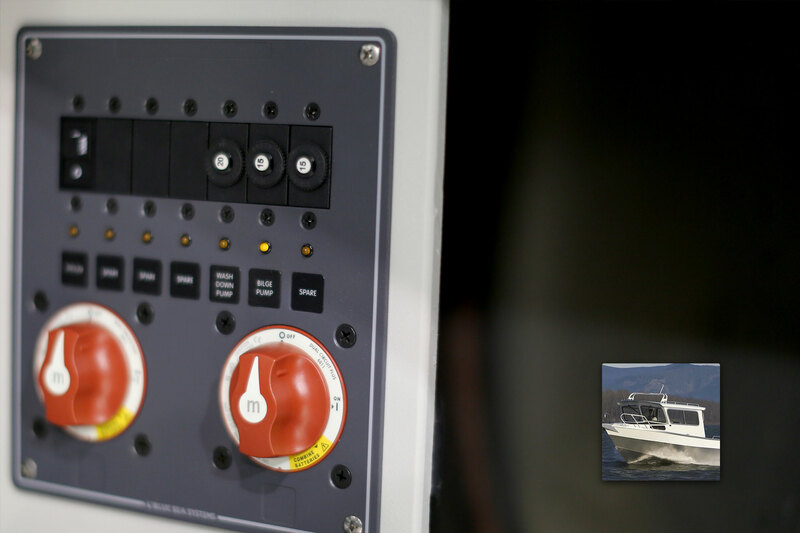 Arima Boats installs the 8372 Contura Switch Water Resistant Panel aboard its boats, including the Sea Chaser 19. 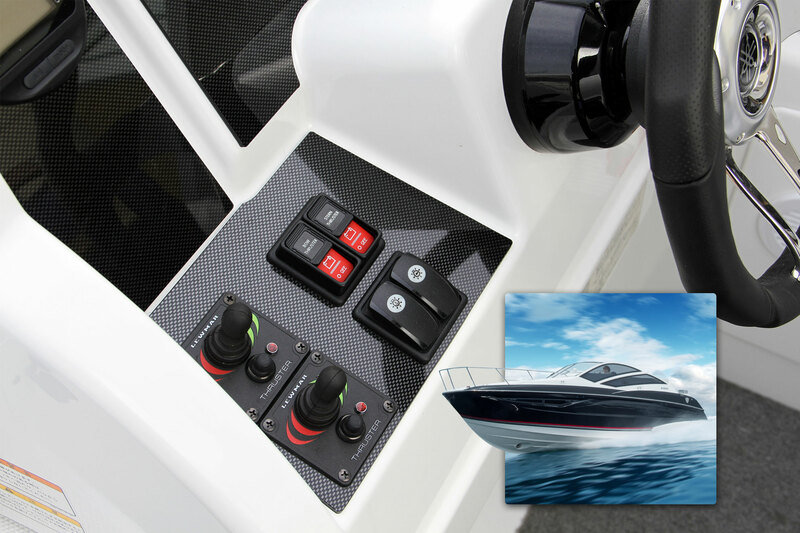 ArrowCat uses Custom 360 Panels aboard their catamarans, including the 32RS. 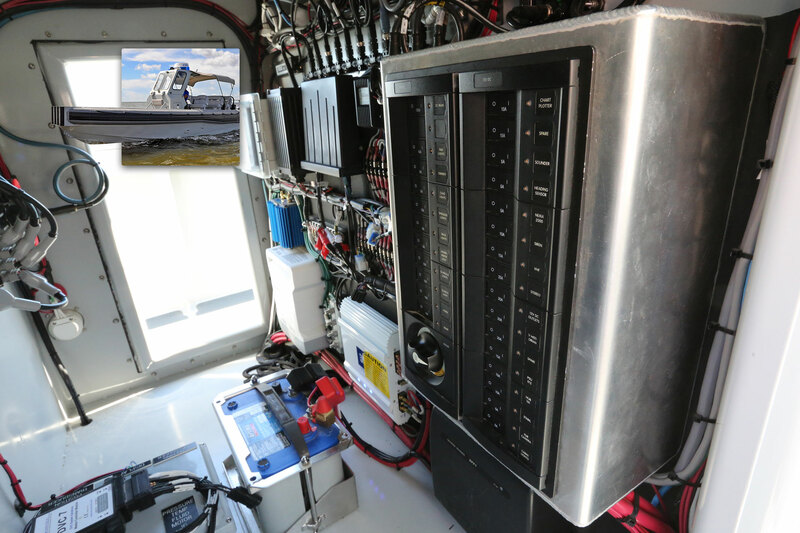 Aspen Power Catamarans uses several Blue Sea Systems Traditional Metal and WeatherDeck® Fuse Panels at the helm of the C100 Escape. 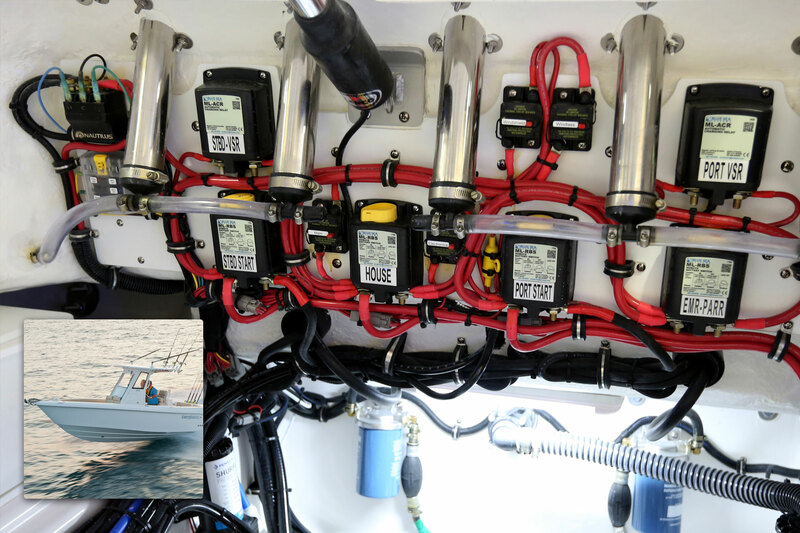 Aspen Power Catamarans specifies several Blue Sea Systems products aboard the C100 Escape including battery switches, ACRs, and fuse blocks. 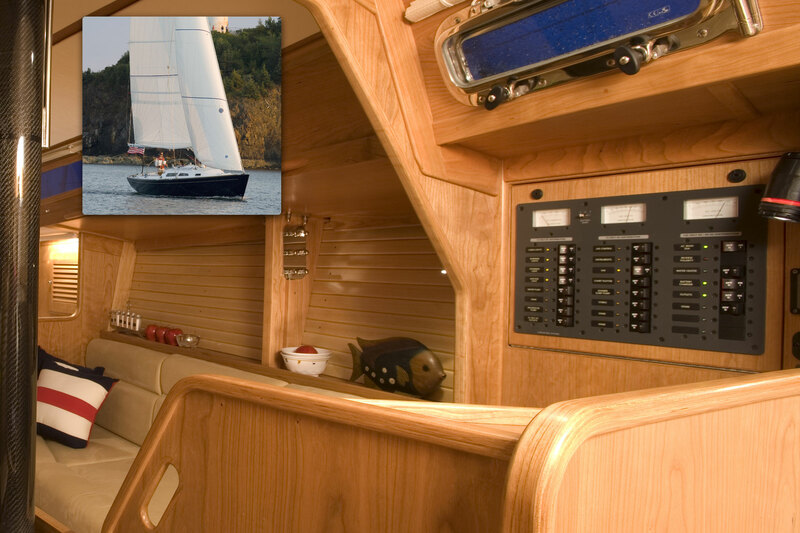 Blue Sea Systems Custom 360 Panels are aboard every Back Cove Yacht including the Back Cove 34. 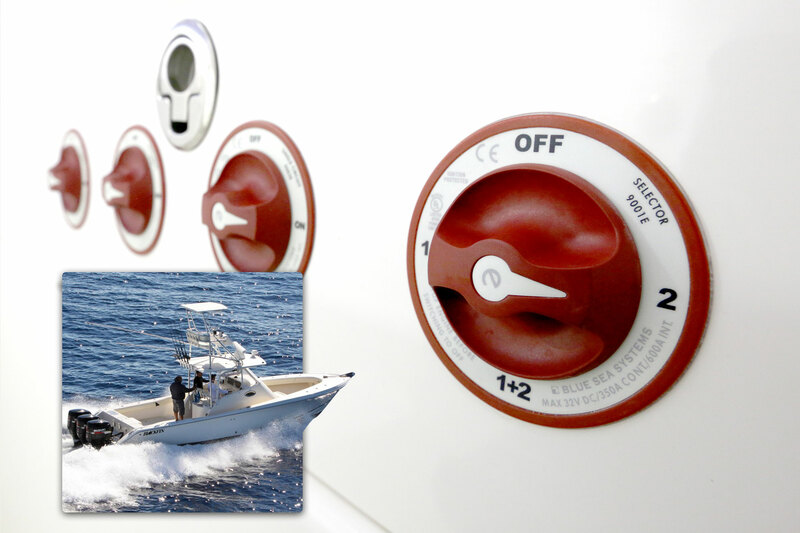 The ST Blade Fuse Block is one of several Blue Sea Systems circuit protection devices aboard the Back Cove 37. 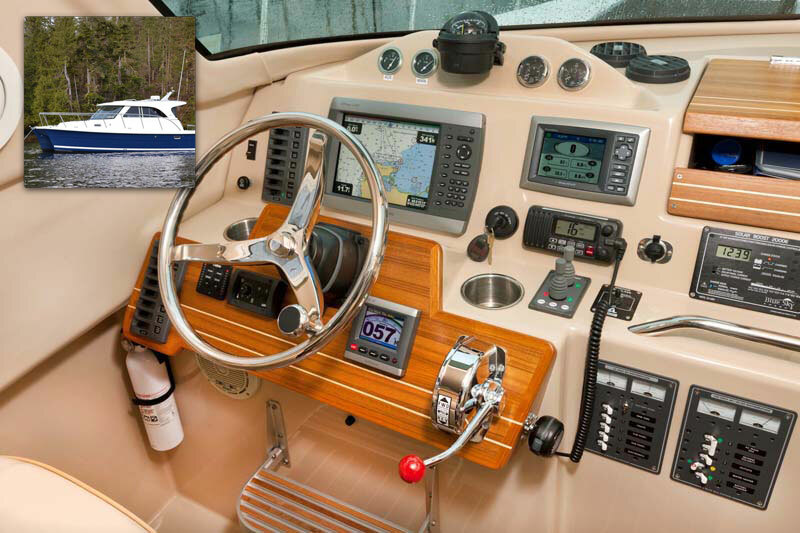 Blue Sea Systems Contura Switch Water Resistant Panels complement the dash of the Back Cove 33. 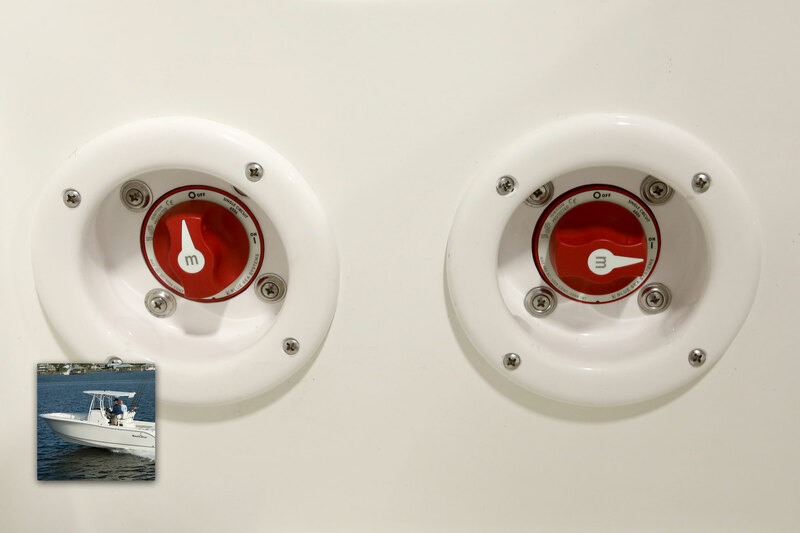 Back Cove Yachts installs the SI-ACR as original equipment in the engine room aboard their yachts, including the Back Cove 37. 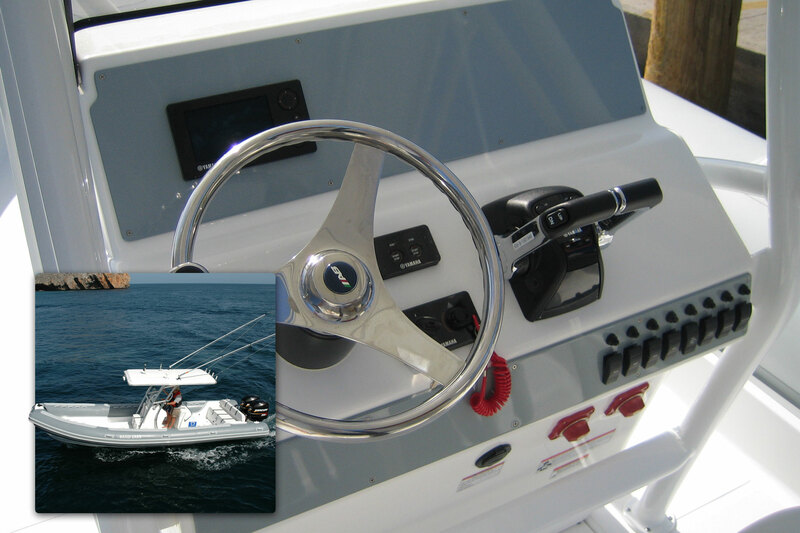 Back Cove Yachts installs the SI-ACR as original equipment aboard their yachts, including the Back Cove 33. 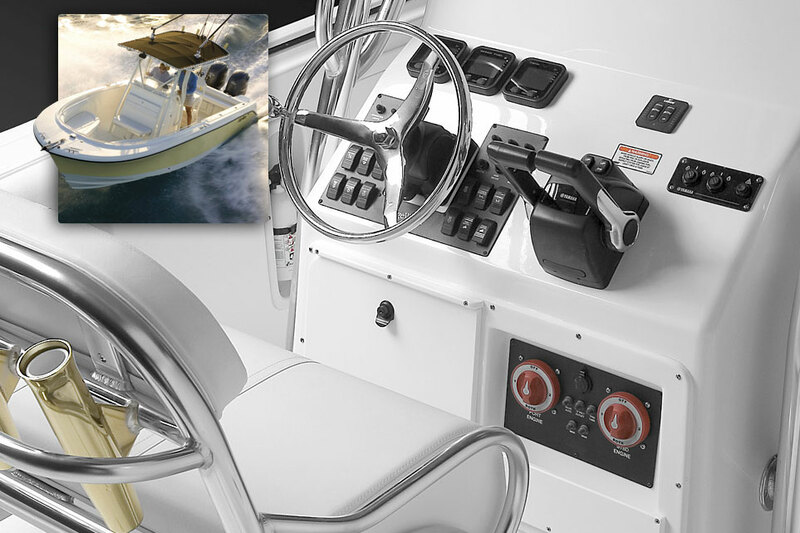 Bahamas Boat Works specifies e-Series Battery Switches aboard their center consoles, including the Bahama 41. 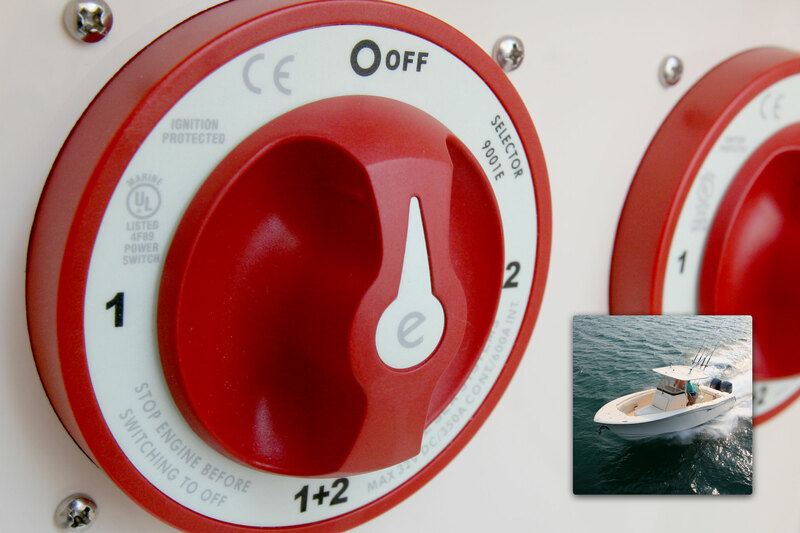 Bavaria Yachts incorporates the Blue Sea Systems ML-Series Remote Battery Switches with remote control into their yachts, including the Sport 44HT. 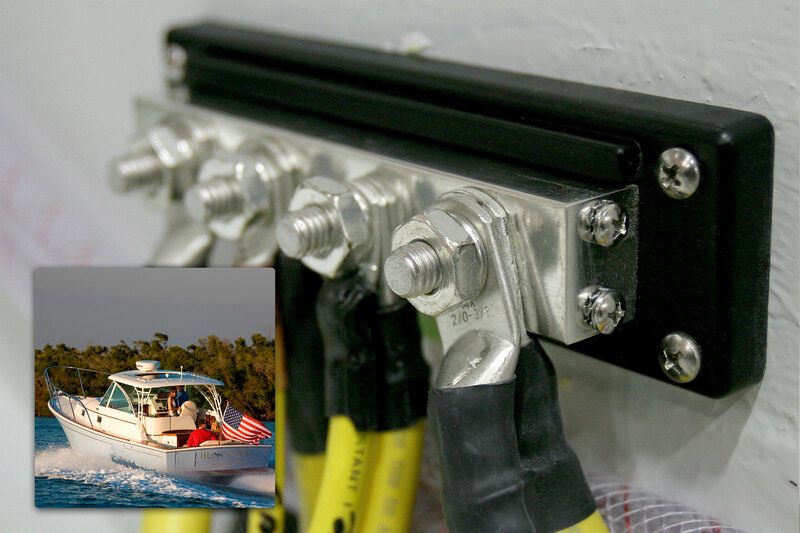 Bennington Boats installs the 9001e e-Series Battery Switch aboard the 2275RLCP pontoon boat. 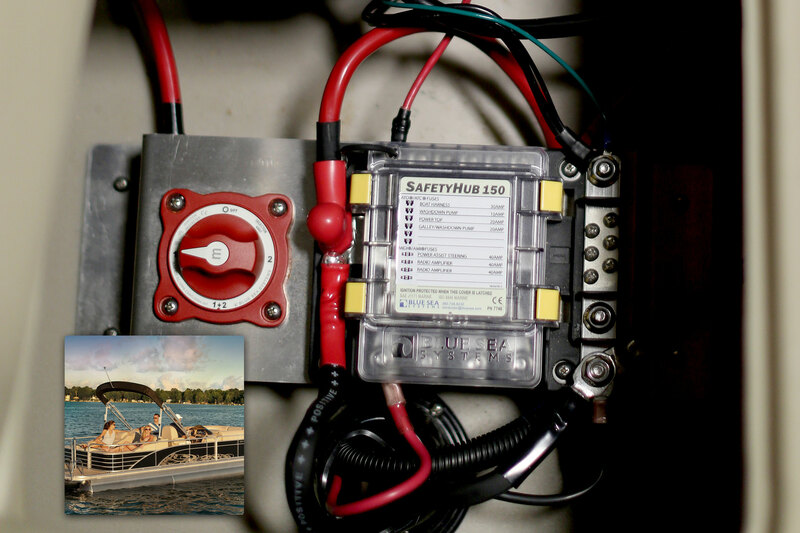 Bennington Boats uses the SafetyHub 150 and m-Series Battery Switch aboard the 2375GCW pontoon boat. 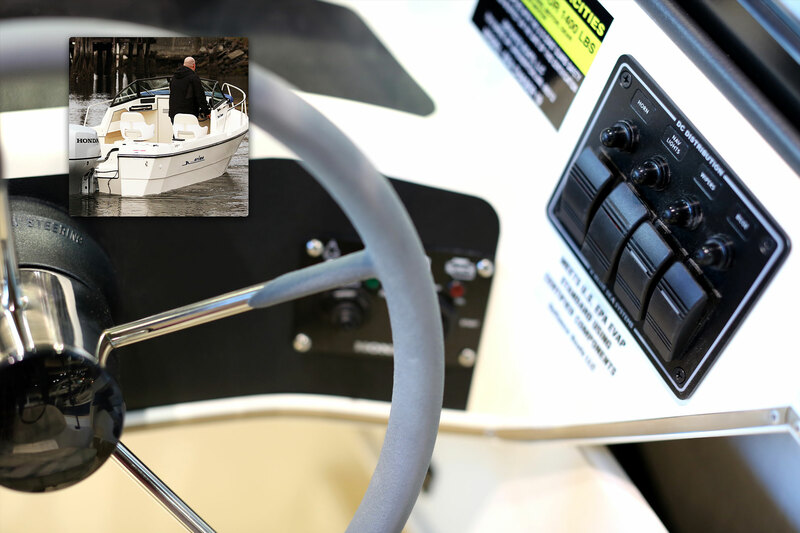 Bennington Boats uses the 6007 m-Series Battery Switch aboard the 2275GCW pontoon boat. 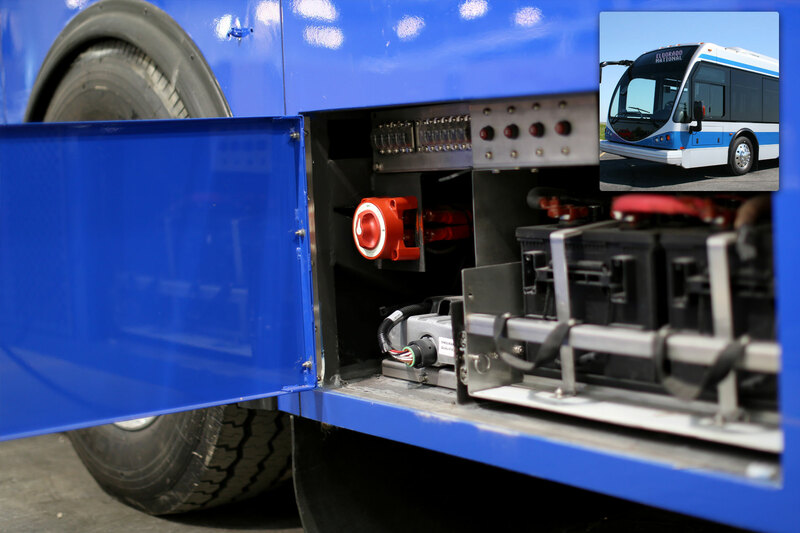 Bespoke Coachworks build custom passenger vans using primarily Blue Sea Systems products to manage the often complex electrical systems required by their discerning customers. 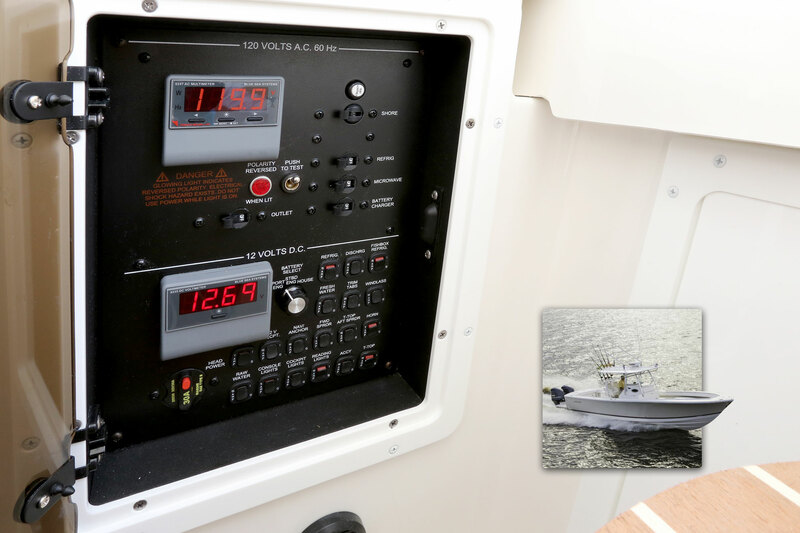 Blackfin uses the Blue Sea Systems 8402 Traditional Metal Panel with 8248 Digital DC Multimeter aboard the 34FA Fish Around for power distribution. 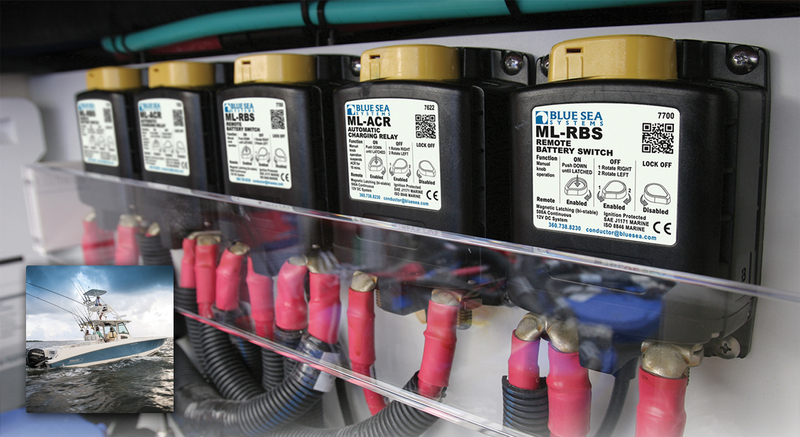 Blackfin uses a bank of Blue Sea Systems 9001e Battery Switches aboard the 34FA Fish Around for battery management. 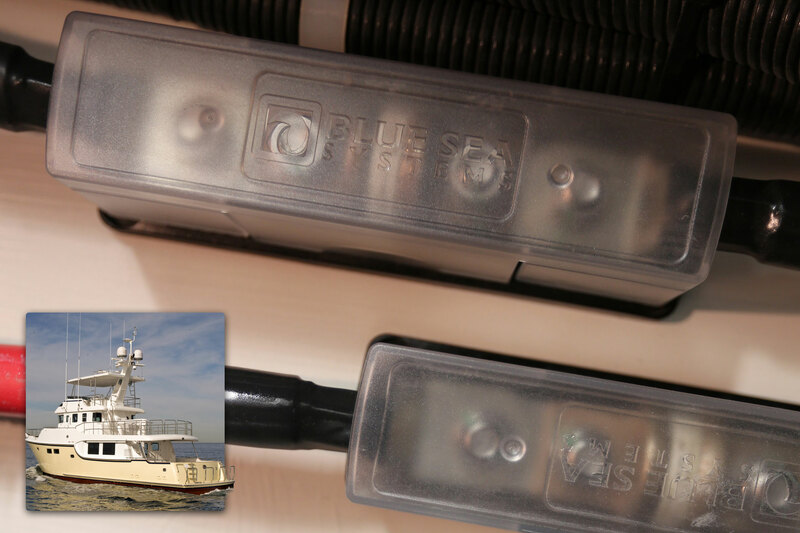 Blackwater Boats uses a bank of Blue Sea Systems e-Series Battery Switches, including the 5511e, aboard the 36SF. 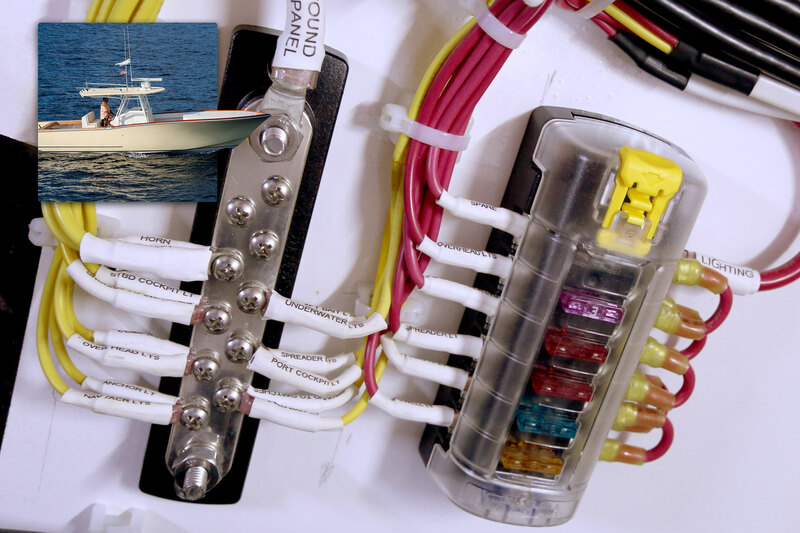 Bluewater Boats installs the 6006 m-Series Battery Switch and 5006 Maxi Fuse Block in the center console of their 180 Inshore boat. 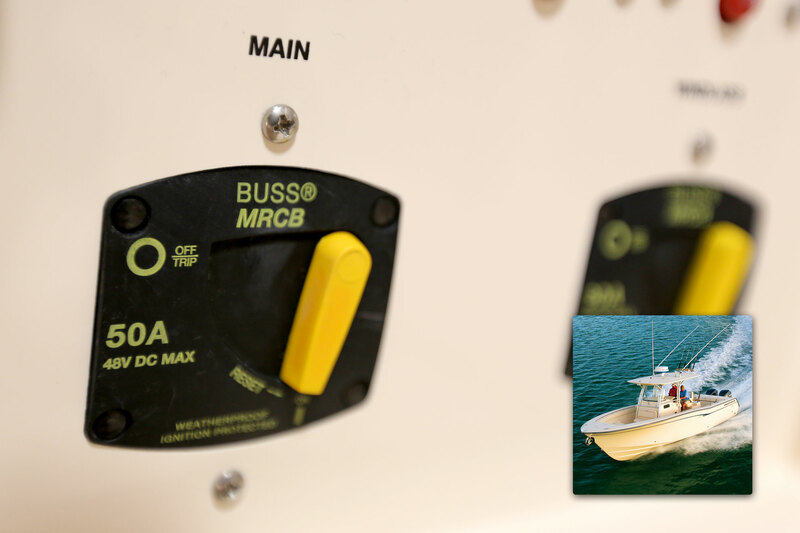 Bonadeo Boatworks relies on Blue Sea Systems 100A DualBus BusBars for their complex electrical system aboard the 34CC. 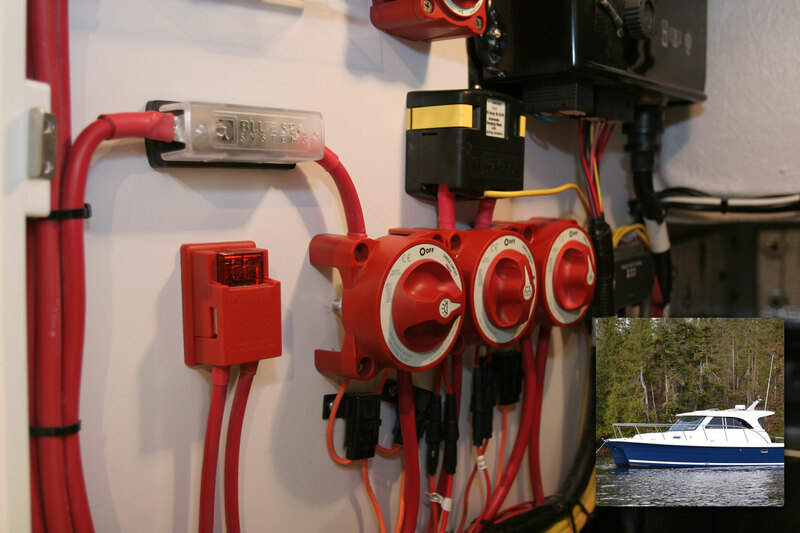 Bonadeo Boatworks uses Blue Sea Systems meters, including the 8028 DC Micro Voltmeter, aboard the 34CC. 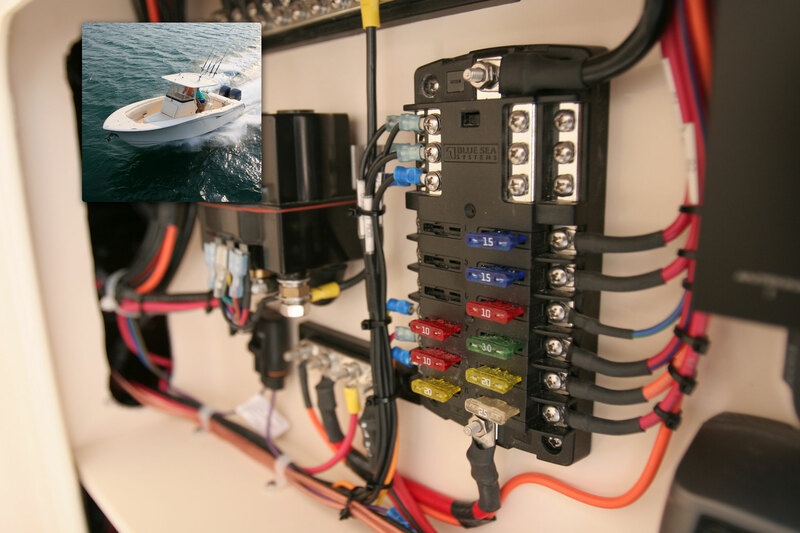 Bonadeo Boatworks relies on Blue Sea Systems products for their complex electrical system, including aboard the 34CC. 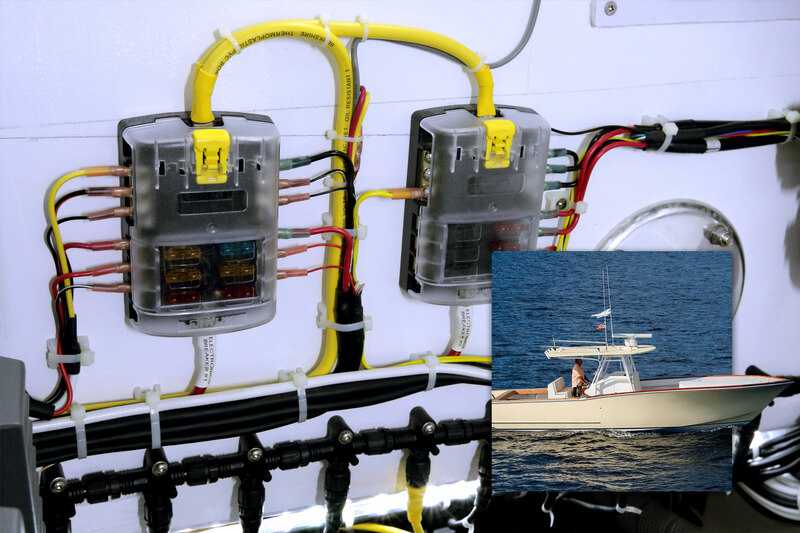 Bonadeo Boatworks relies on Blue Sea Systems 150A Common BusBars for their complex electrical system aboard the 34CC. 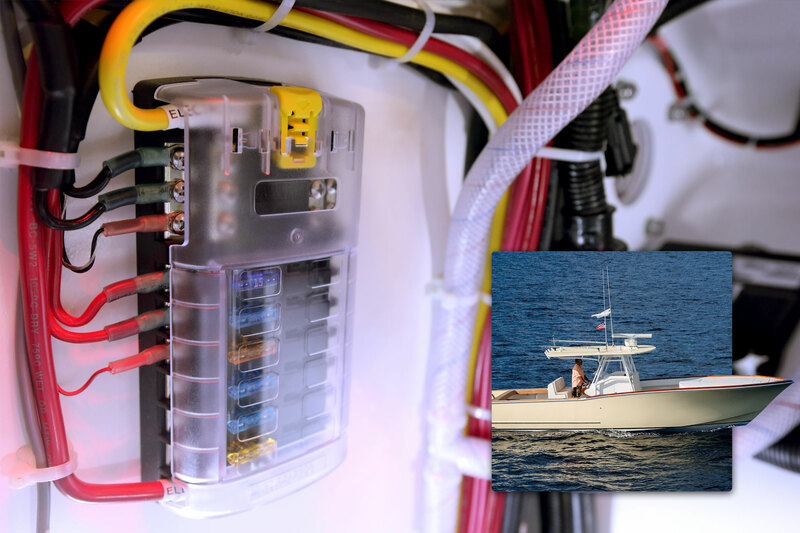 Bonadeo Boatworks uses Blue Sea Systems 5025 ST Blade Fuse Block in their complex electrical system aboard the 34CC. 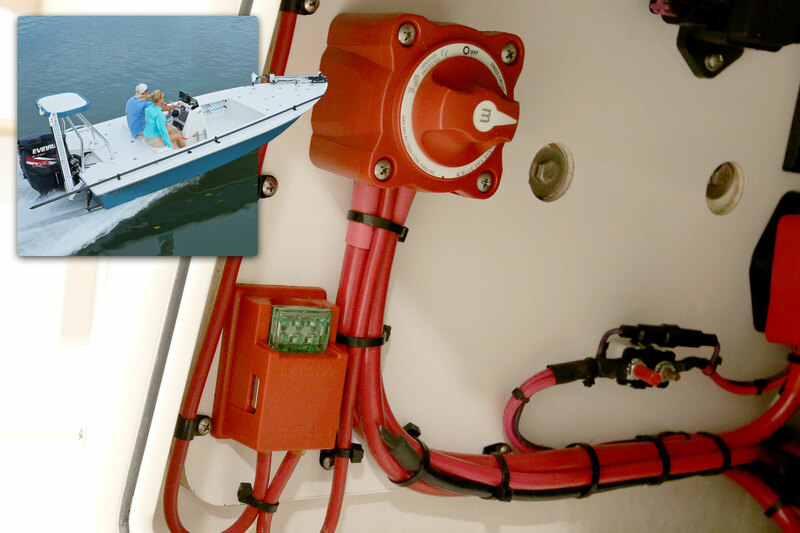 Bonadeo Boatworks uses Blue Sea Systems 5026 ST Blade Fuse Block in their complex electrical system aboard the 34CC. 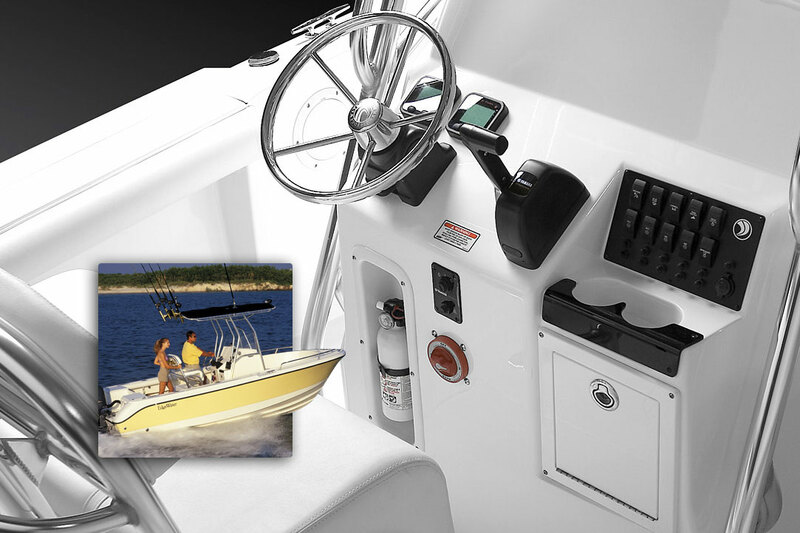 Boston Whaler uses three 6006 m-Series Battery Switches aboard the 345 Conquest. 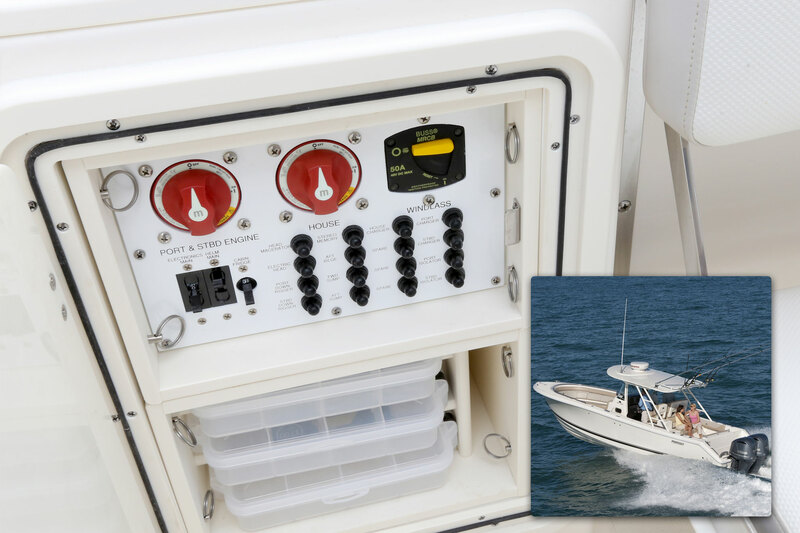 Boston Whaler uses Blue Sea Systems ML-ACRs and Remote Battery Switches on their 370 Outrage with three outboards and three battery banks. 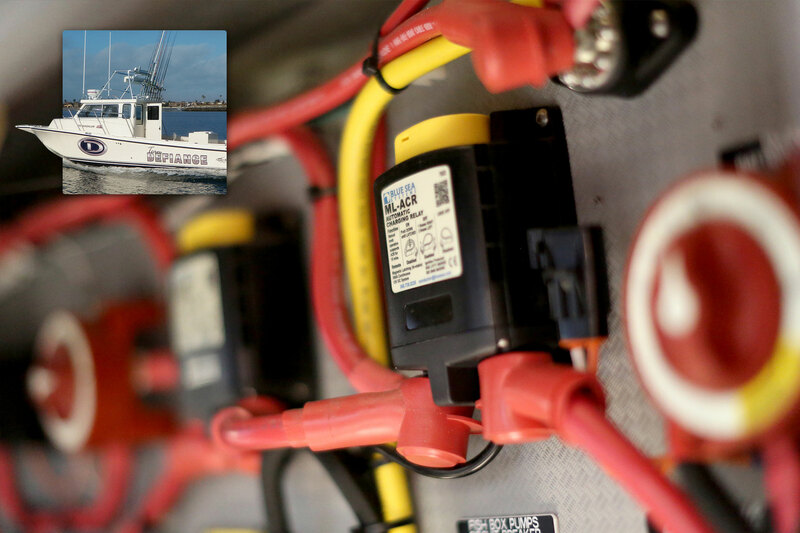 Boston Whaler uses the 7649 Mini Add-A-Battery kit (6011 and 7601) aboard the 240 Dauntless to manage the boat’s two battery bank electrical system. 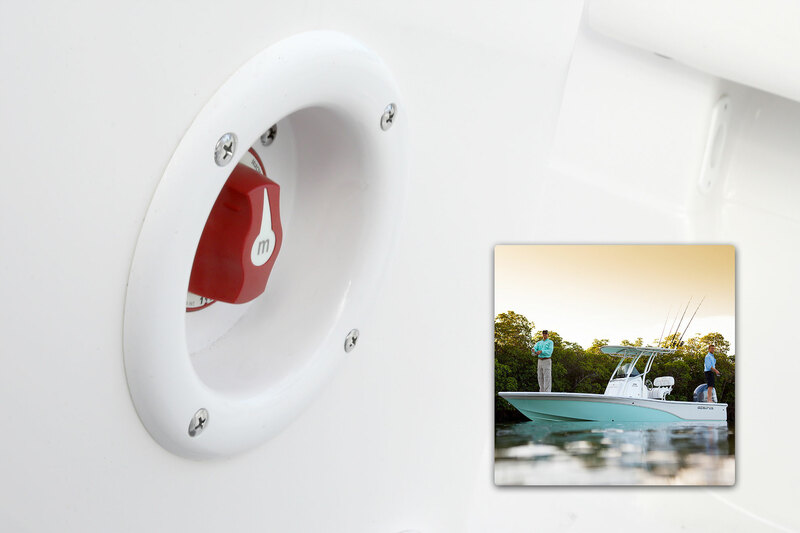 Boston Whaler uses two 6011 m-Series Dual Circuit Plus™ Battery Switches aboard the 285 Conquest. 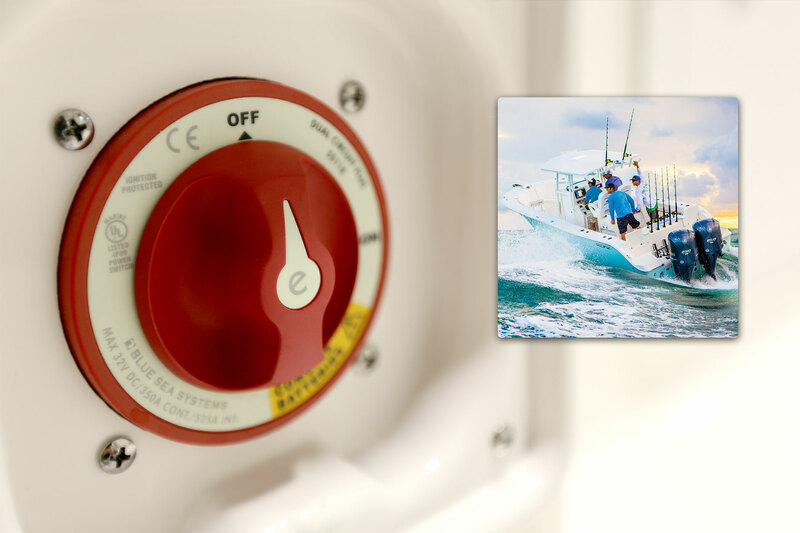 Boston Whaler uses two 6011 m-Series Dual Circuit Plus™ Battery Switches aboard the 315 Conquest. 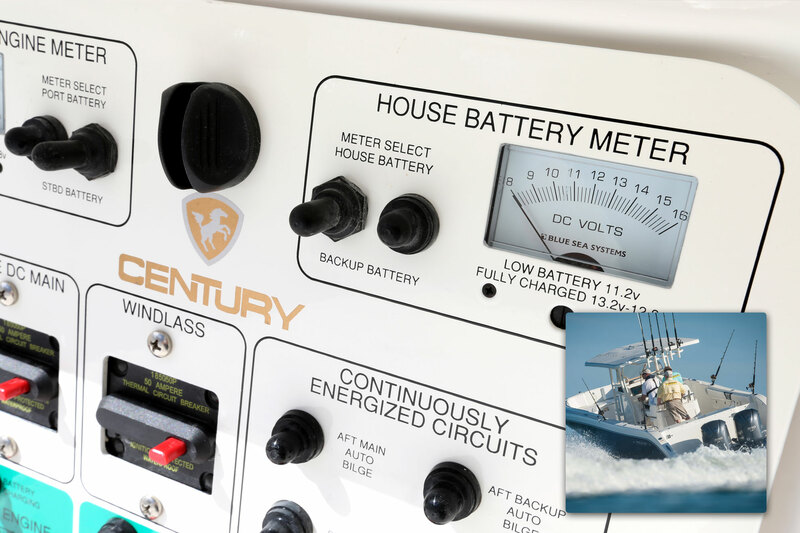 Century Boats uses Blue Sea Systems analog meters as original equipment aboard their boats, including the 3200CC. 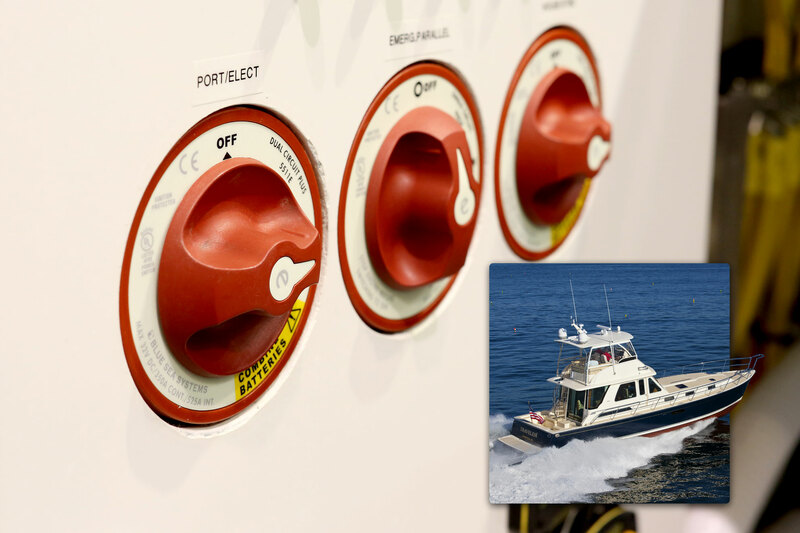 Cobalt Boats uses the 5511e Dual Circuit Plus™ Battery Switch to manage two battery banks aboard the 26SD. 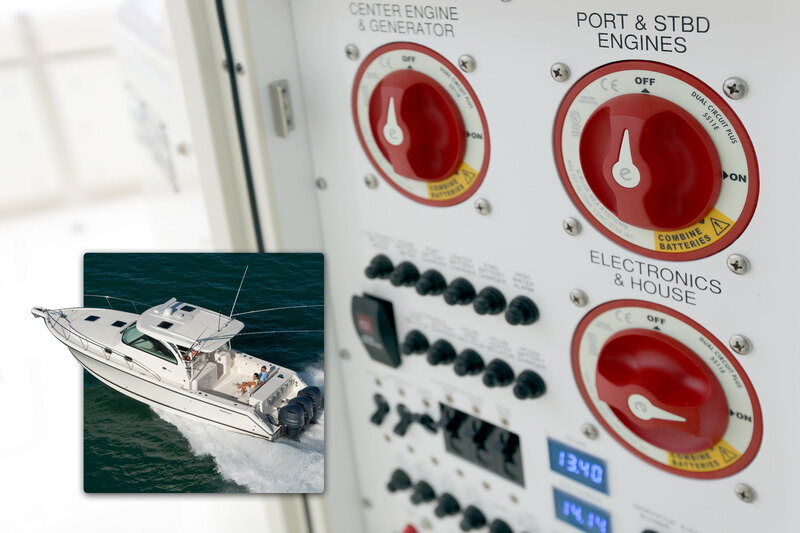 Cobalt Boats uses the 5511e Dual Circuit Plus™ Battery Switch to manage two battery banks aboard the A25. 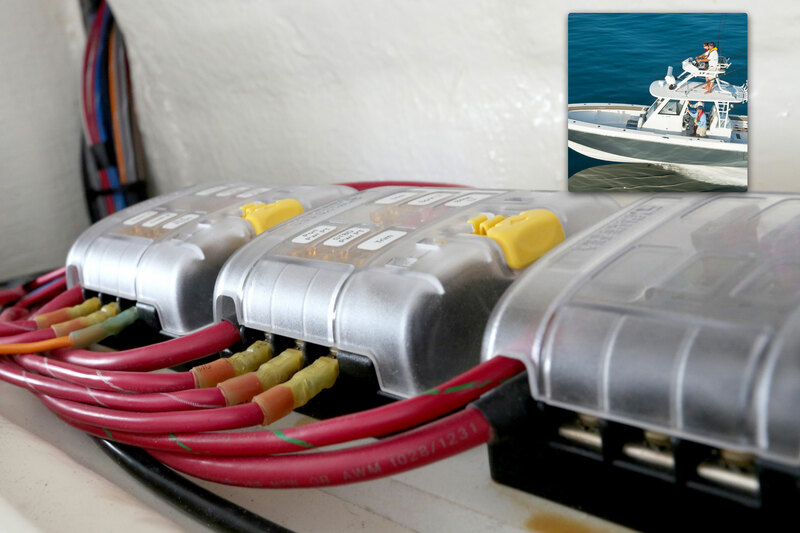 Contender Boats uses a bank of Blue Sea Systems 6007 m-Series Battery Switches for battery management aboard the 39ST. 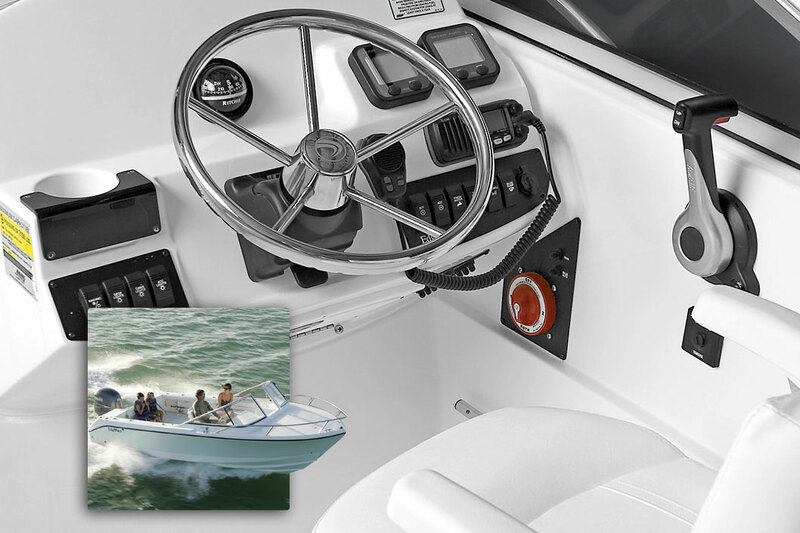 Contender Boats uses a bank of three 6007 m-Series Selector Battery Switches aboard the 28S. 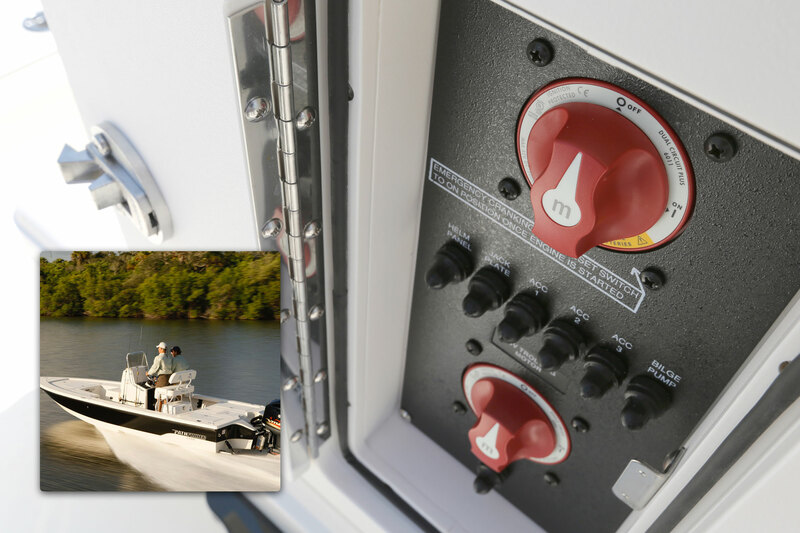 Contender Boats uses a bank of four 6007 m-Series Selector Battery Switches aboard the 39LS. 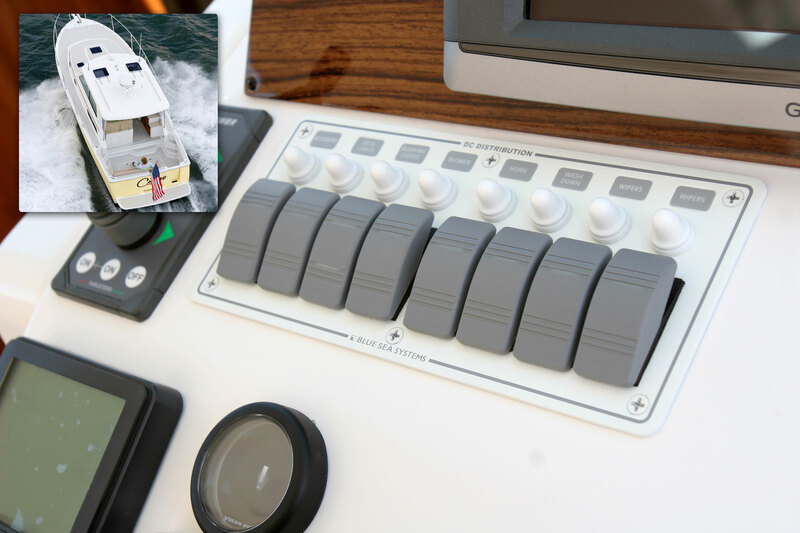 Cutwater Boats uses Blue Sea Systems Contura Switch Panels at the helm of the C30. 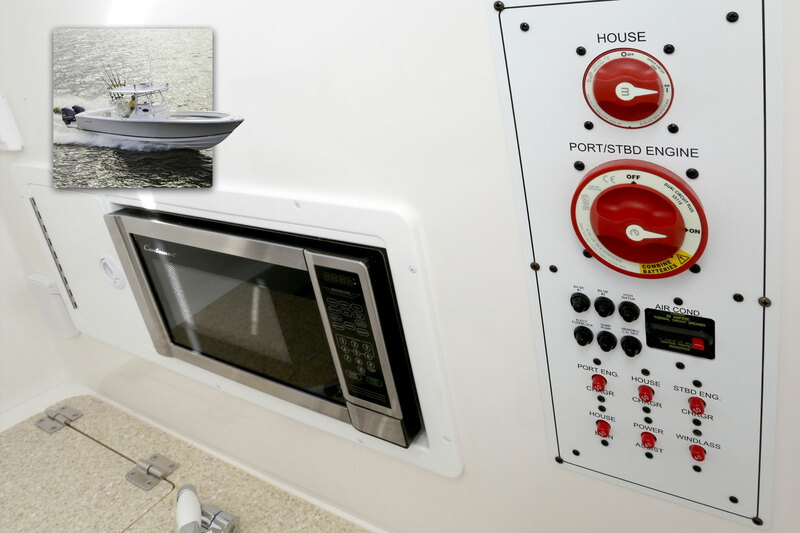 Cutwater boats installs Blue Sea Systems Contura Switch Water Resistant Panels aboard the C30 Command Bridge. 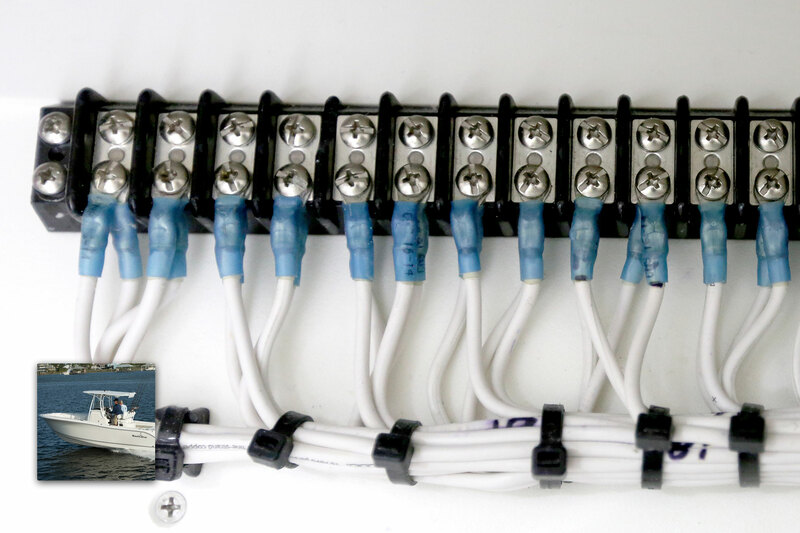 Cutwater Boats uses Blue Sea Systems products including Custom 360 Panels for AC and DC power distribution. 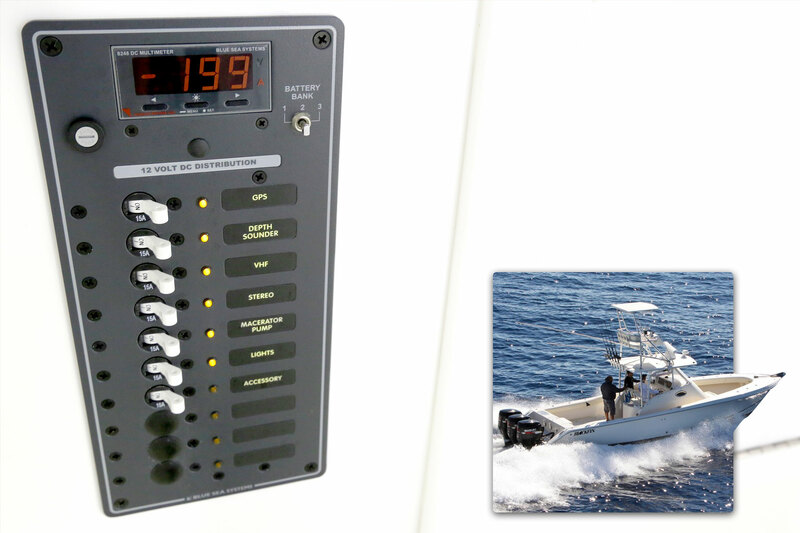 Cutwater Boats uses several Blue Sea Systems products, including e-Series Battery Switches, aboard the C28. 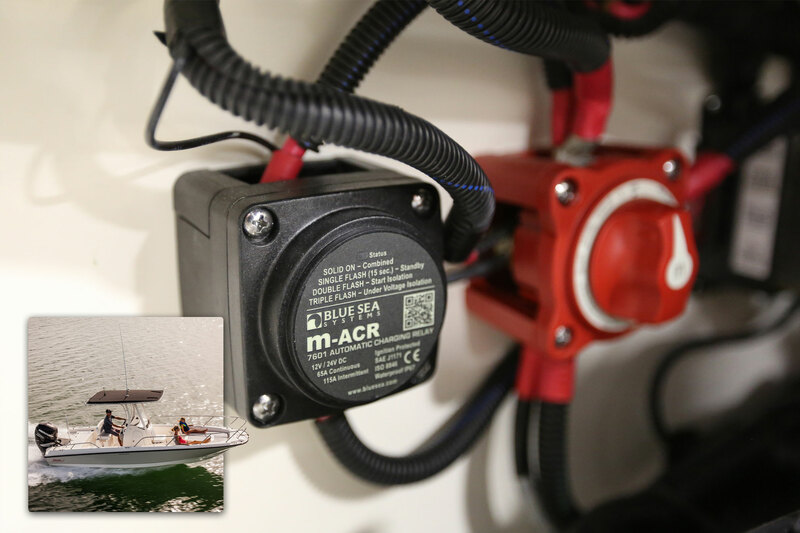 Defiance Marine uses the 7622 ML-ACR Automatic Charging Relay as a part of the battery management system aboard the Guadalupe 290. 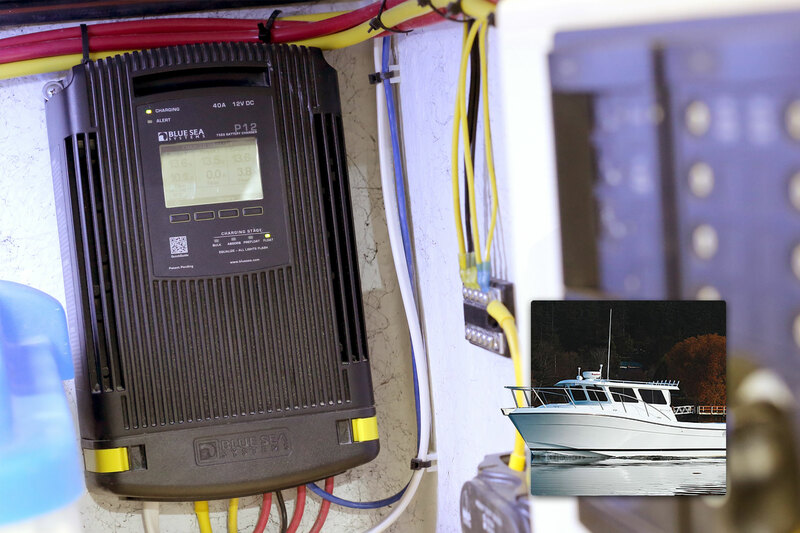 Defiance Marine mounts a Blue Sea Systems Custom 360 Panel at the helm of the Guadalupe 290 for DC monitoring and Power Distribution. 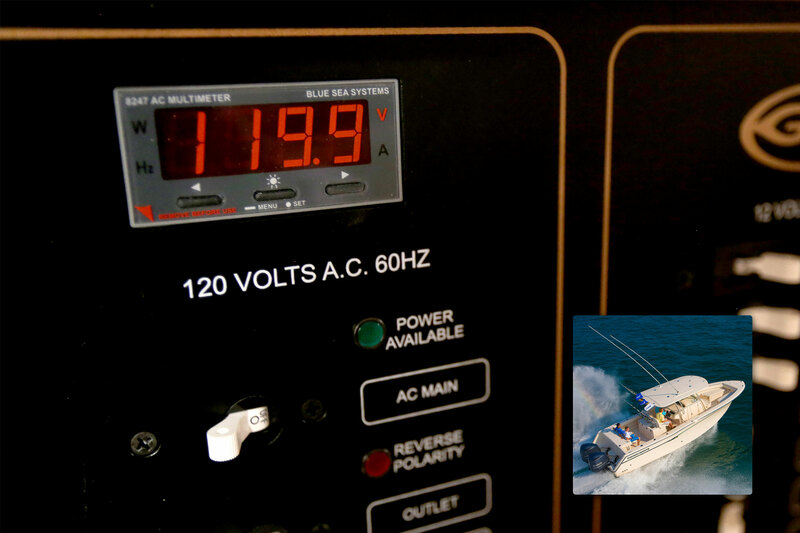 Defiance Marine uses the 2104 PowerBar as a part of their substantial electrical system aboard the Guadalupe 290. 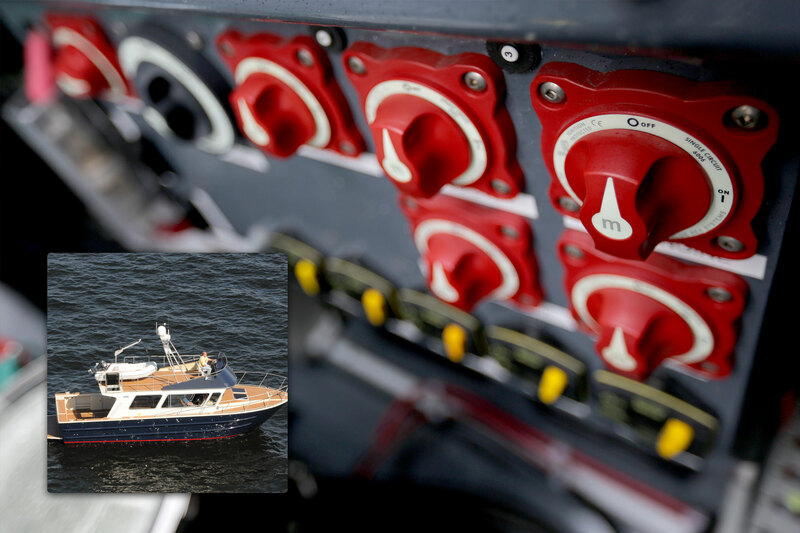 Delta Powerboats of Sweden uses Blue Sea Systems 8080 Battery Management Panel aboard their modern and elegant 26 Open. 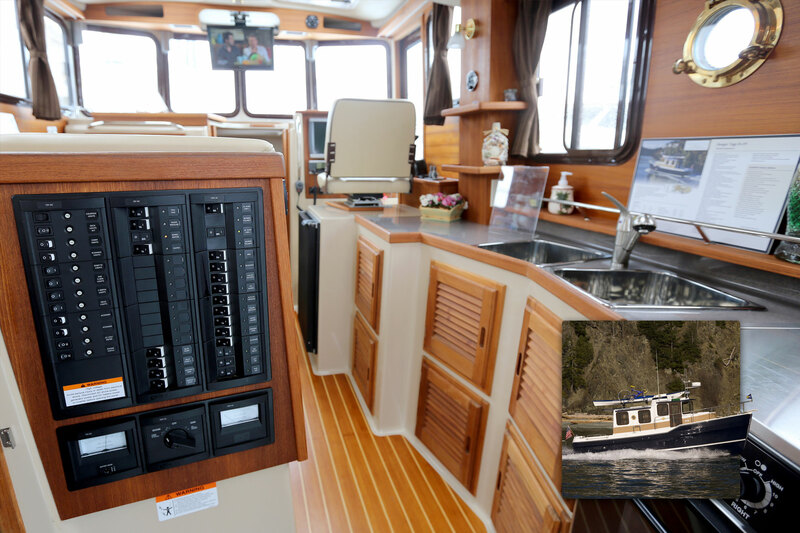 EagleCraft Boats uses AC and DC Custom 360 Panels aboard the 38 Cruiser. 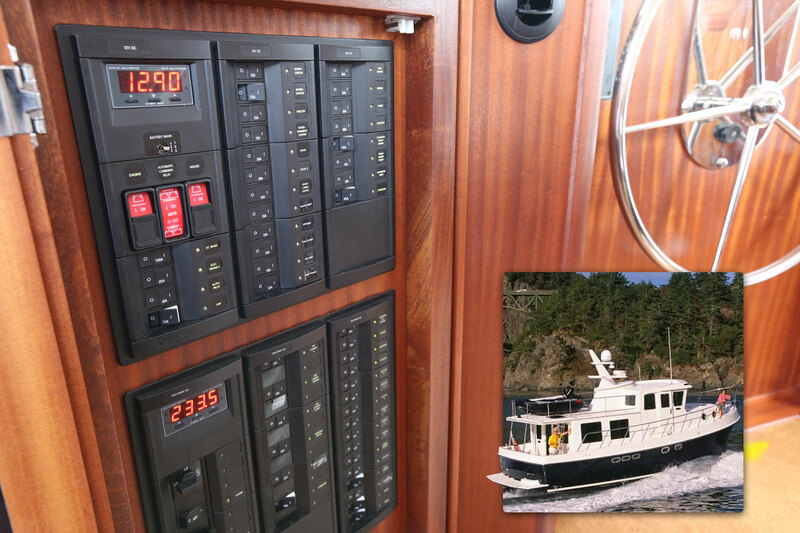 EagleCraft Boats uses a bank of battery switches, including the 6006 m-Series ON-OFF Battery Switch, for battery management aboard the 38 Cruiser. 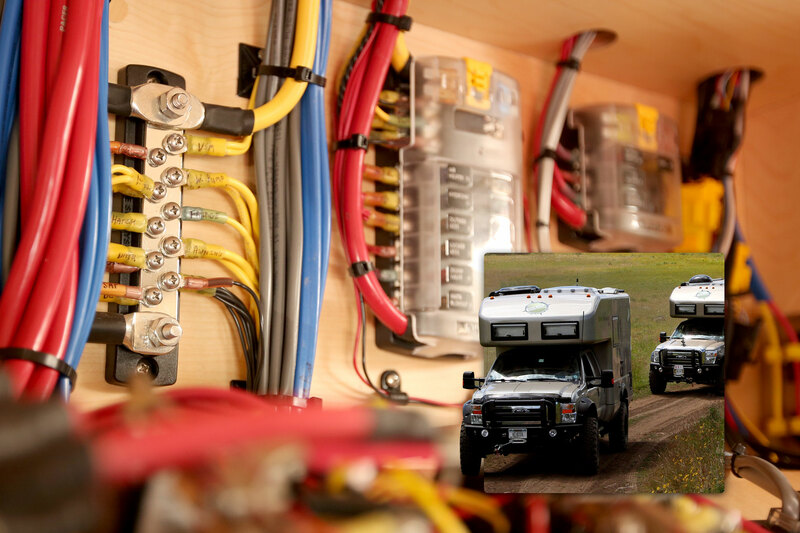 EarthRoamer builds vehicles which can go beyond where the road ends. 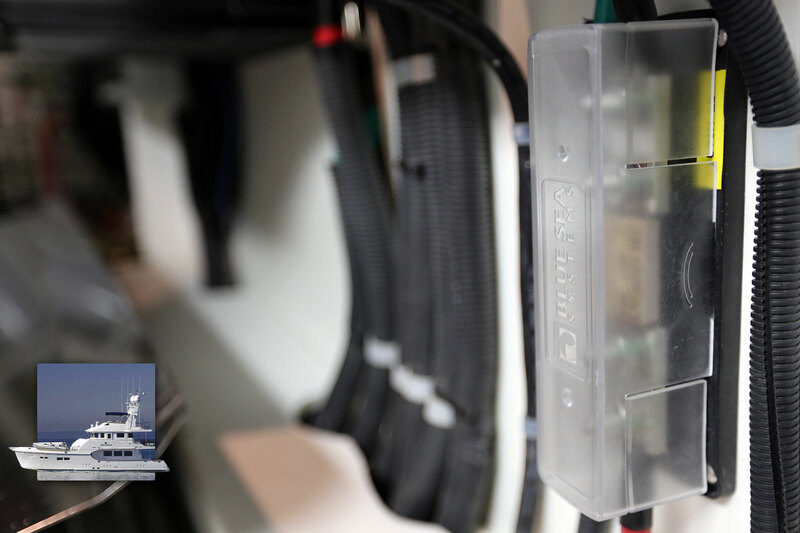 They rely on Blue Sea Systems electrical products, including the Custom 360 Panel, to keep their critical systems functioning. 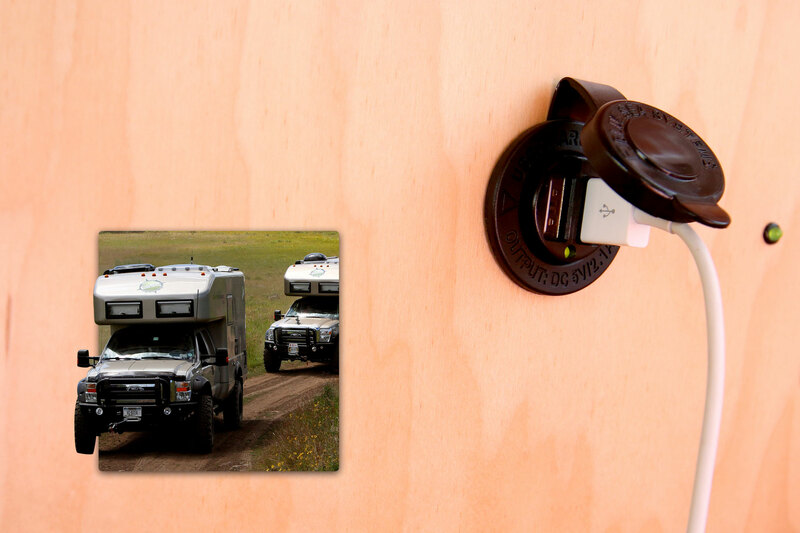 The Blue Sea Systems 2301 150A BusBar is a critical component in the EarthRoamer XV-LT electrical system. 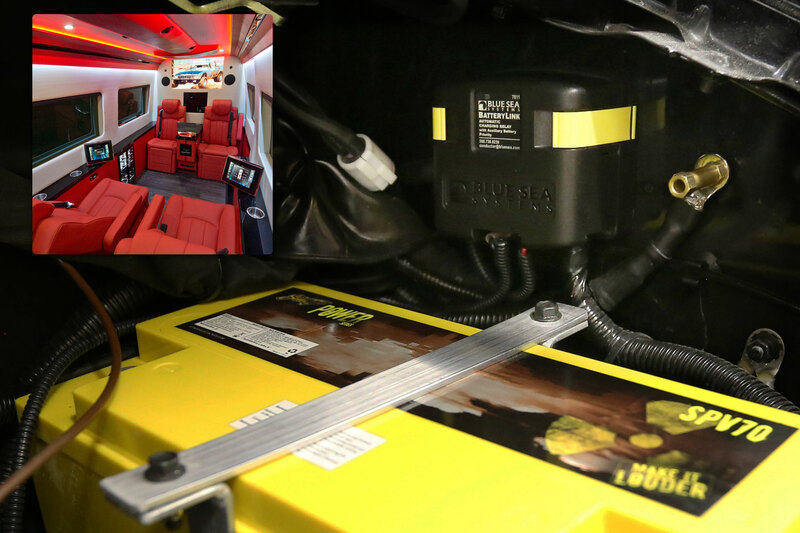 EarthRoamer uses Blue Sea Systems power conversion products, including the 1016 Dual USB Charger, aboard the XV-LT vehicle. 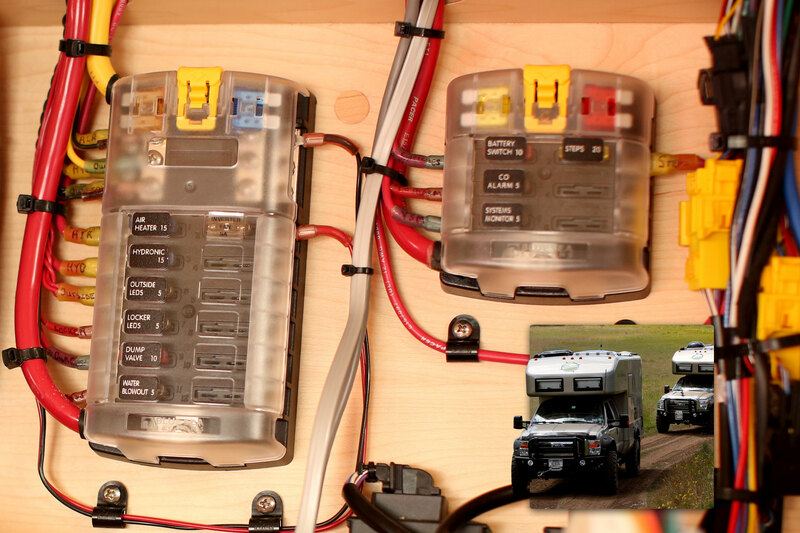 EarthRoamer expedition vehicles rely on Blue Sea Systems to protect critical circuits aboard their vehicles, including the XV-LT.
EarthRoamer uses Blue Sea Systems fuse blocks, including the 5028 and 5026 ST Blade Fuse Blocks, aboard the XV-LT vehicle. 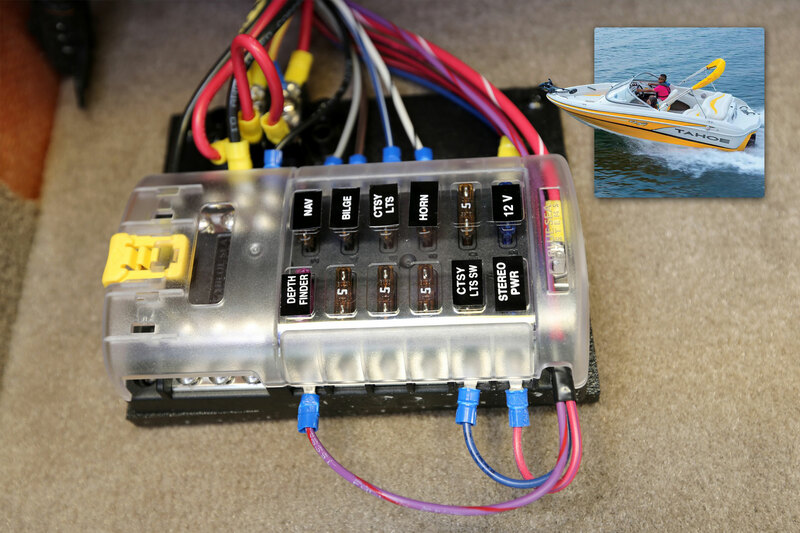 Edgewater Powerboats uses the 9001e Selector Battery Switch at the helm of the 205CC for battery management. 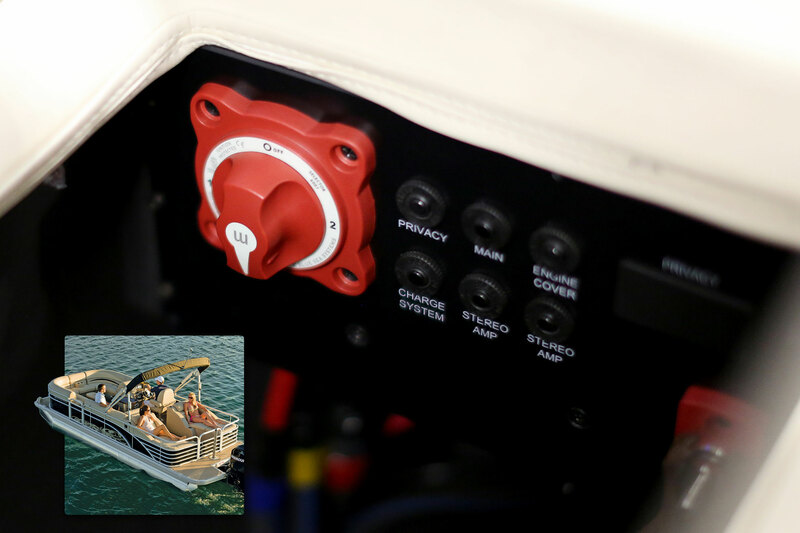 Edgewater Powerboats uses a pair of 9001e Selector Battery Switch at the helm of the 245CC for battery management. 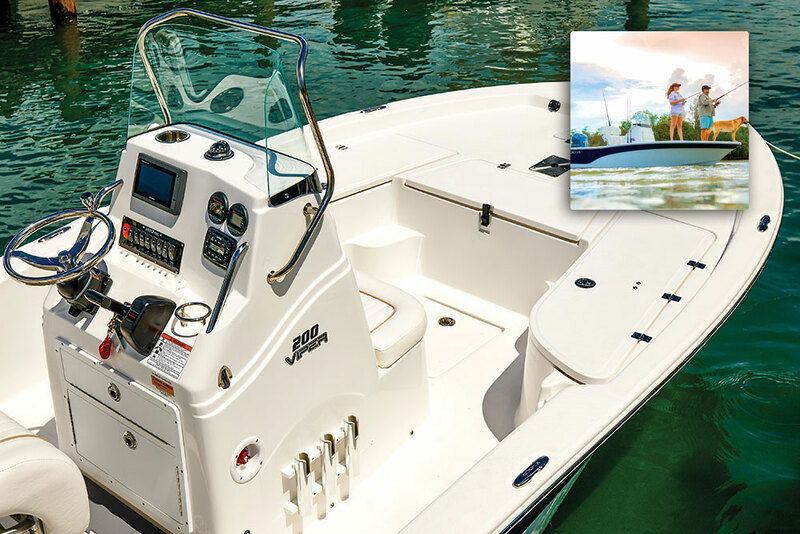 Edgewater Powerboats uses a bank of waterproof 6006 Battery Switches aboard the 335EX. 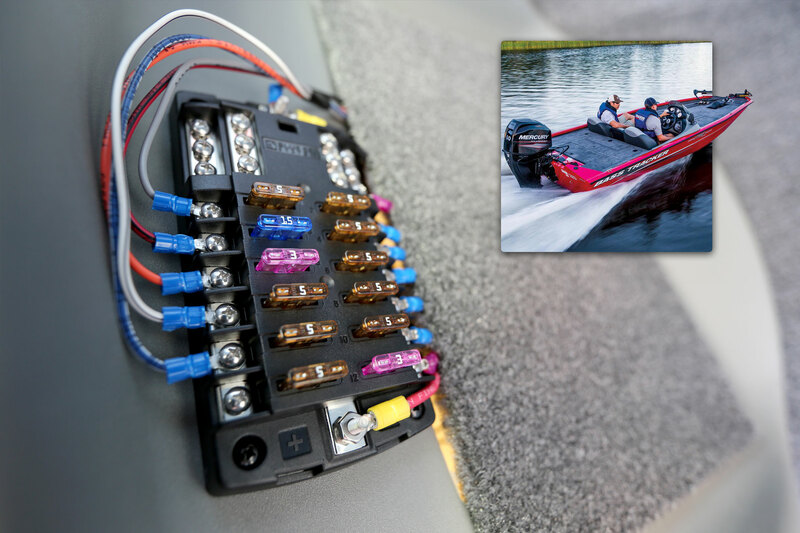 Edgewater Powerboats uses a bank of waterproof 6006 Battery Switches aboard the 388CC. 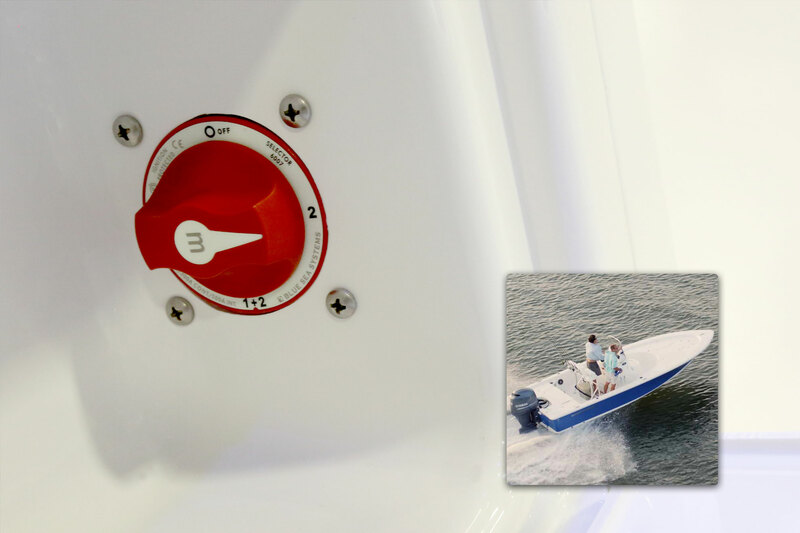 Edgewater Powerboats uses the 9001e Selector Battery Switch at the helm of the 205EX for battery management. 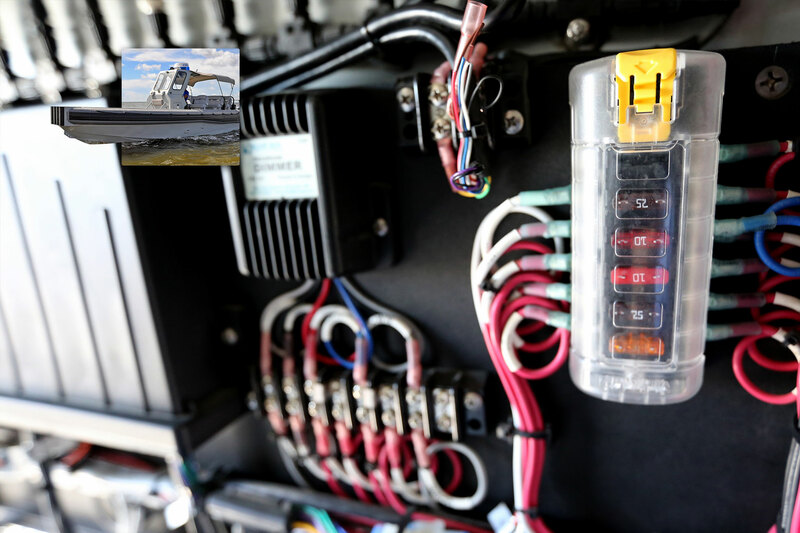 El Dorado National uses Blue Sea Systems 5510e Dual Circuit Battery Switches for emergency shut off aboard the EZ Rider II Bus used by municipalities, universities, and airports. 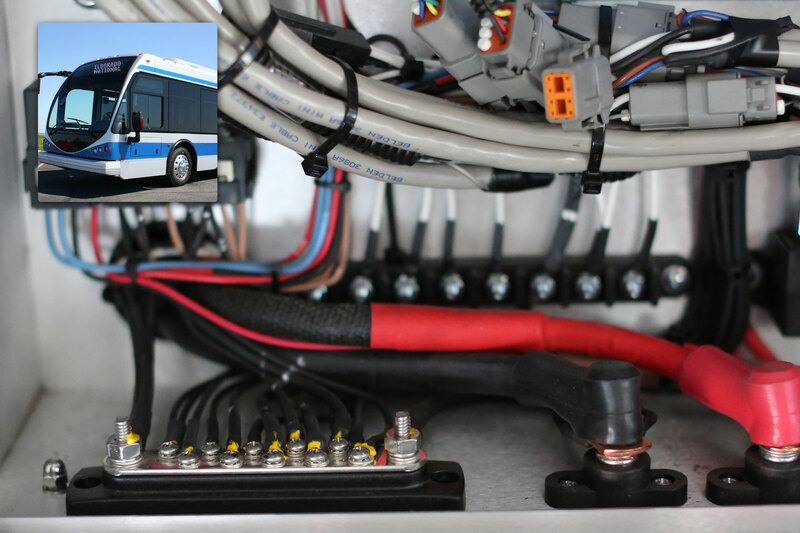 El Dorado National specifies Blue Sea Systems 5502 ClassT Fuse Blocks aboard the EZ Rider II Bus used by municipalities, universities, and airports. 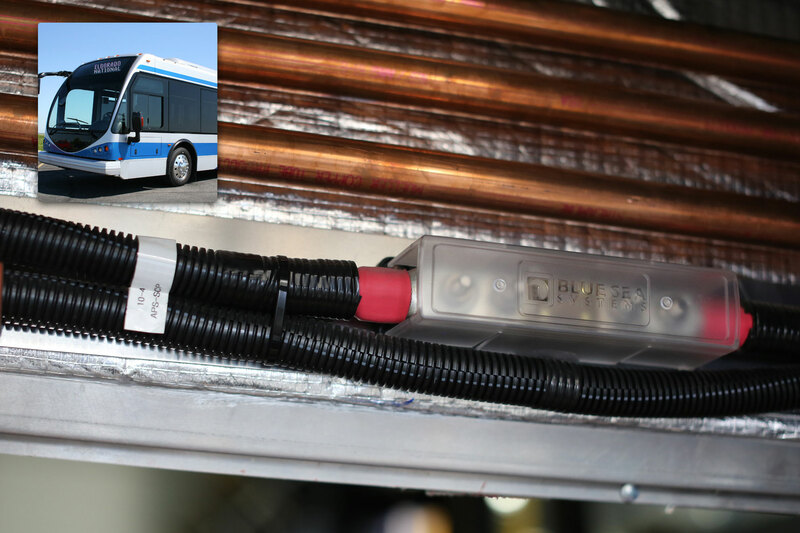 El Dorado National specifies Blue Sea Systems 2301 150A Common BusBars for emergency shut off aboard the EZ Rider II Bus used by municipalities, universities, and airports. 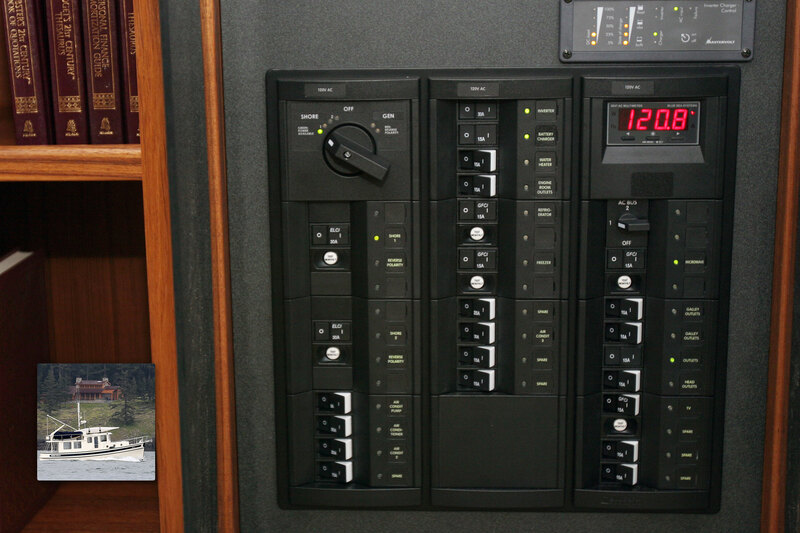 El Dorado National uses Blue Sea Systems 5510e Dual Circuit Battery Switches for emergency shut off aboard the Passport Bus used by municipalities, universities, and airports. 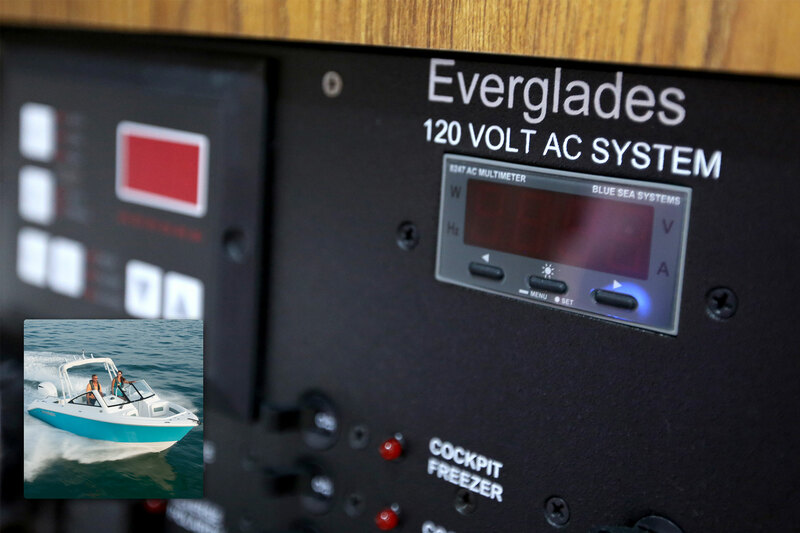 Everglades uses a combination of 7620 Automatic Charging Relays (ACR) and 7700 Remote Battery Switches (RBS) to manage the multiple Battery Bank system aboard the 255CC. 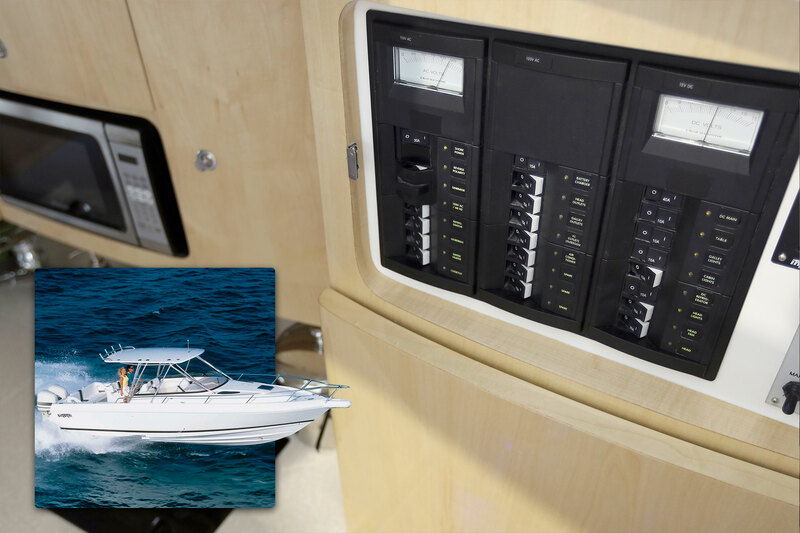 Everglades uses Blue Sea Systems 2145 Contura Switches to control the battery management system aboard the 355CC. 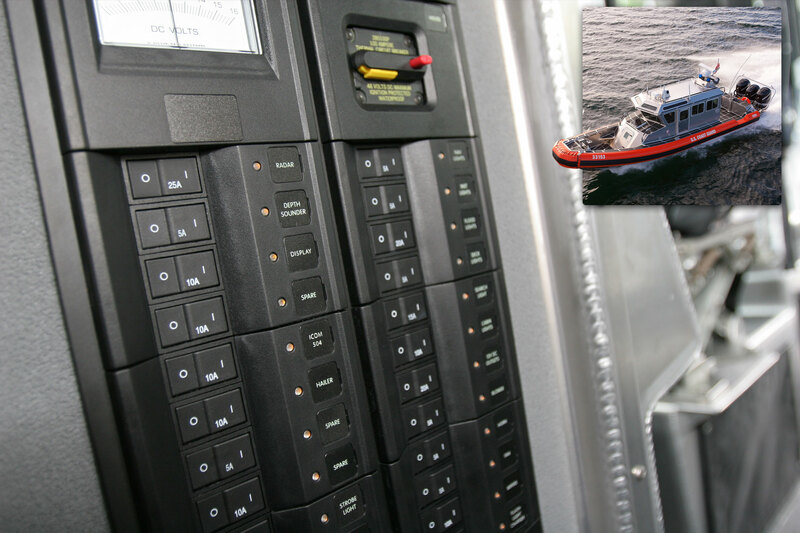 Everglades uses a combination of 7620 Automatic Charging Relays (ACR) and 7700 Remote Battery Switches (RBS) to manage the multiple Battery Bank system aboard the 355T. 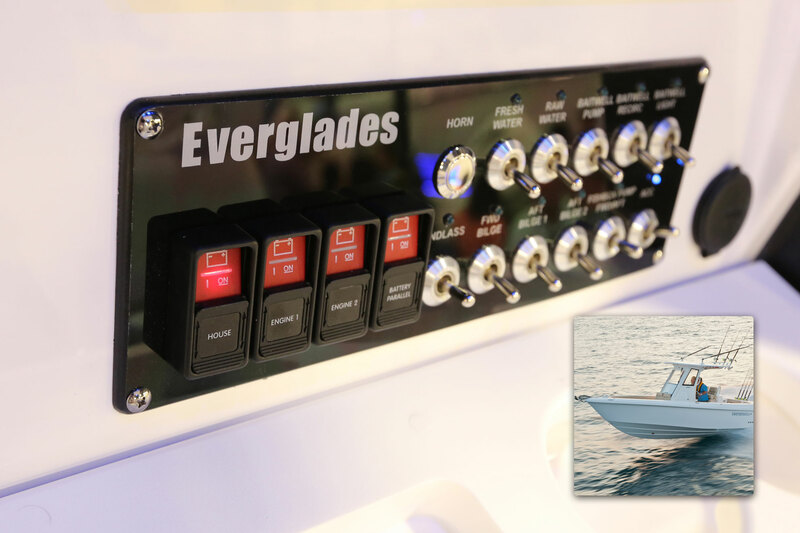 The Blue Sea Systems 5028 ST Blade Fuse Block is a critical component of the electrical system aboard the Everglades 355T. 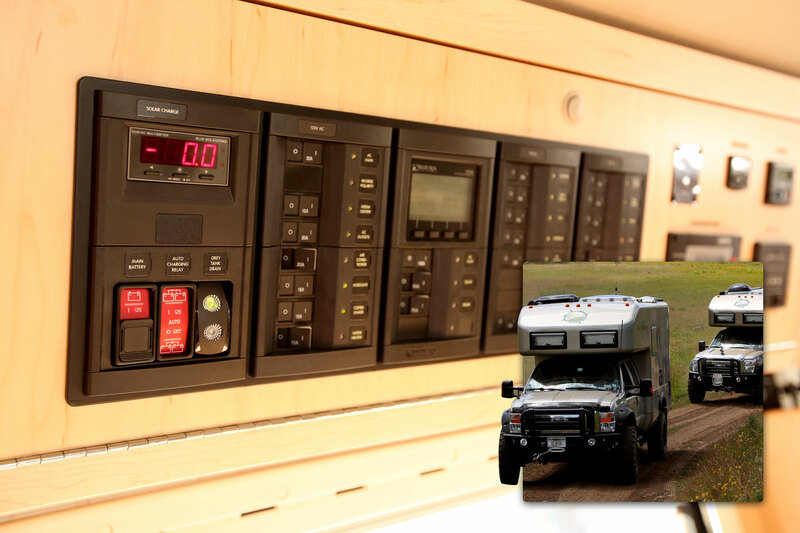 Everglades specifies the 8247 Digital Multimeter to monitor the critical AC functions aboard the 230DC. 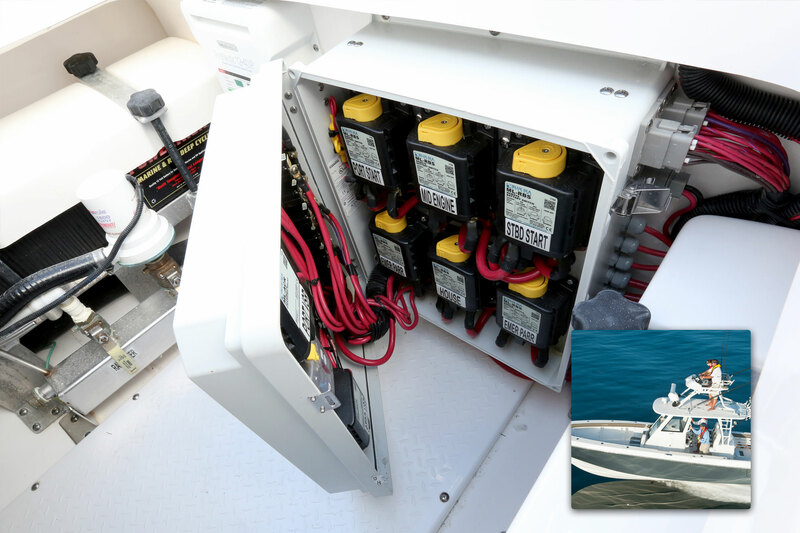 Everglades uses Blue Sea Systems 2145 Contura Switches to control the battery management system aboard the 255CC. 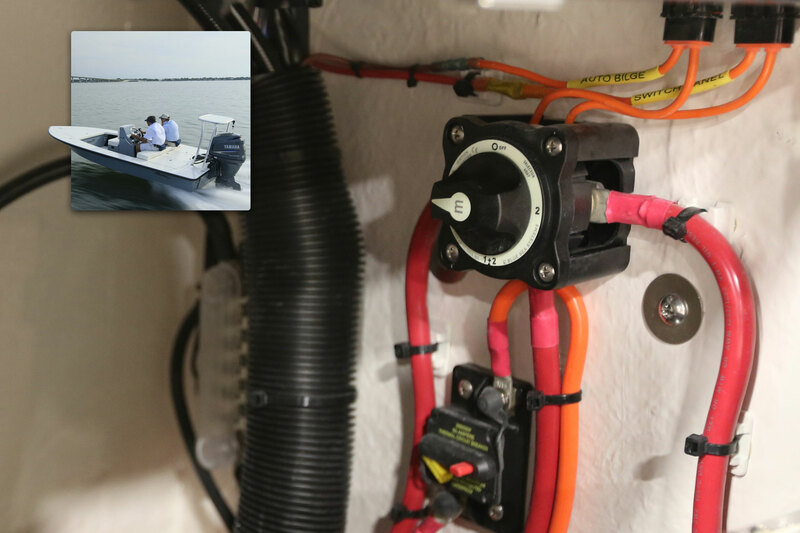 Everglades uses Blue Sea Systems 6007 Selector Battery Switch on the 230DC boat. 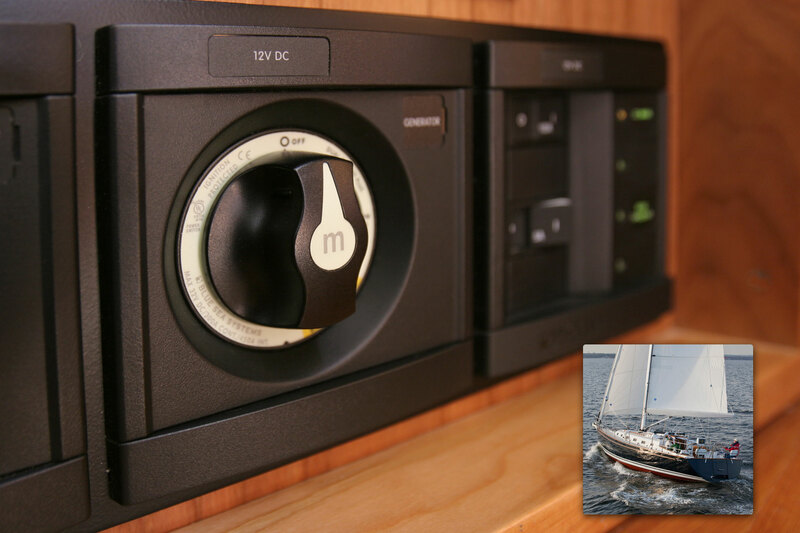 Fathom Yachts uses multiple Custom 360 Panels from Blue Sea Systems aboard their Yachts including the Element 40. 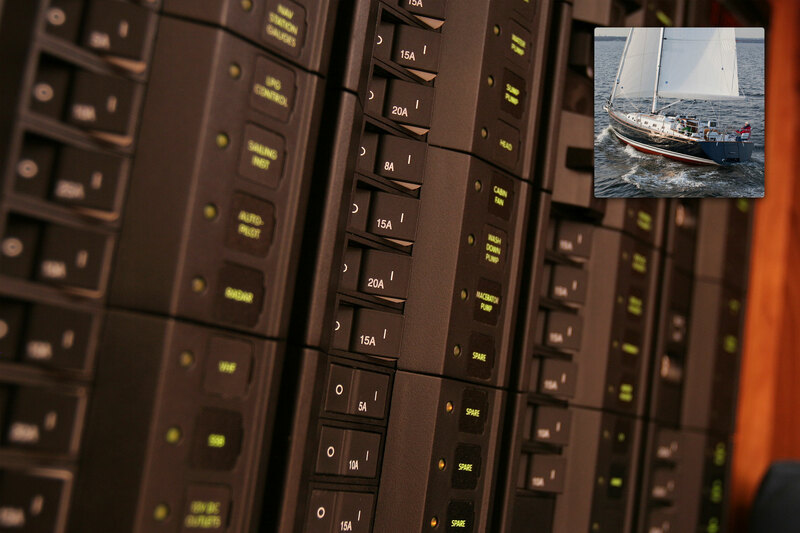 Fathom Yachts uses multiple Custom 360 Panels from Blue Sea Systems aboard their Yachts including the Expedition 40. 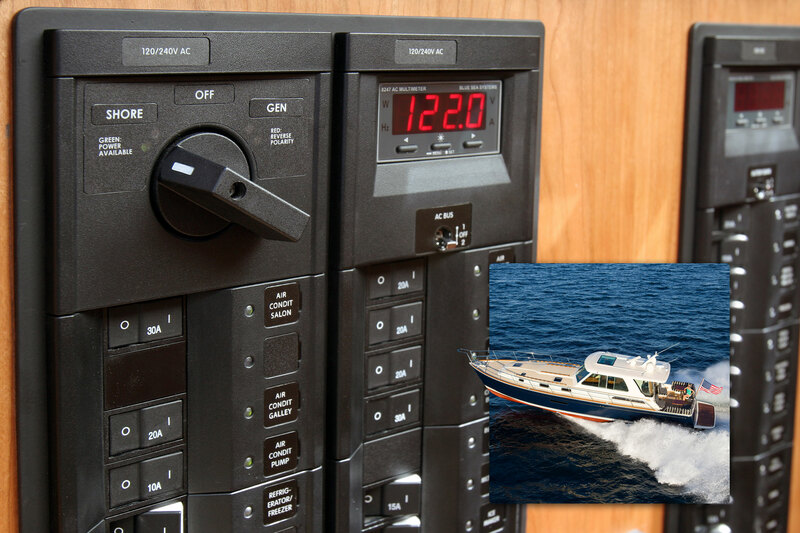 Grady White uses Blue Sea Systems 6007 m-Series Battery Switches for battery management aboard their boats, including the Canyon 376. 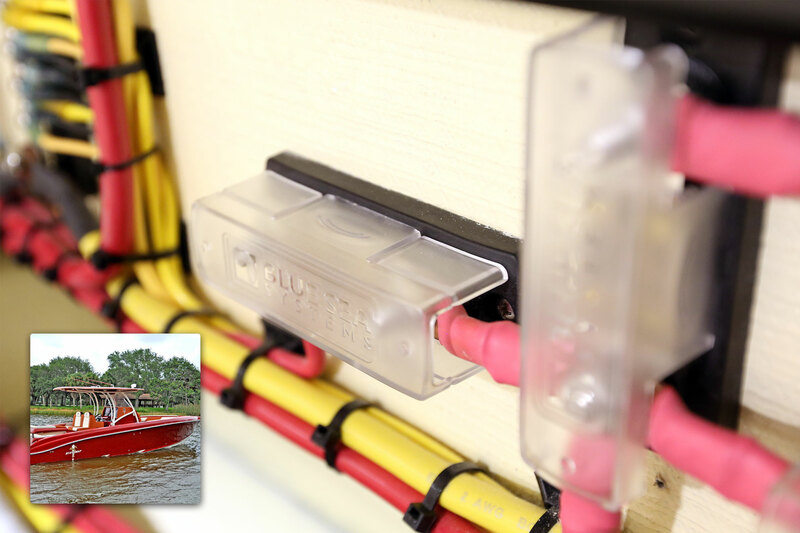 Grady White uses Blue Sea Systems 5026 ST Blade Fuse Blocks as circuit protection aboard their boats, including the Canyon 271. 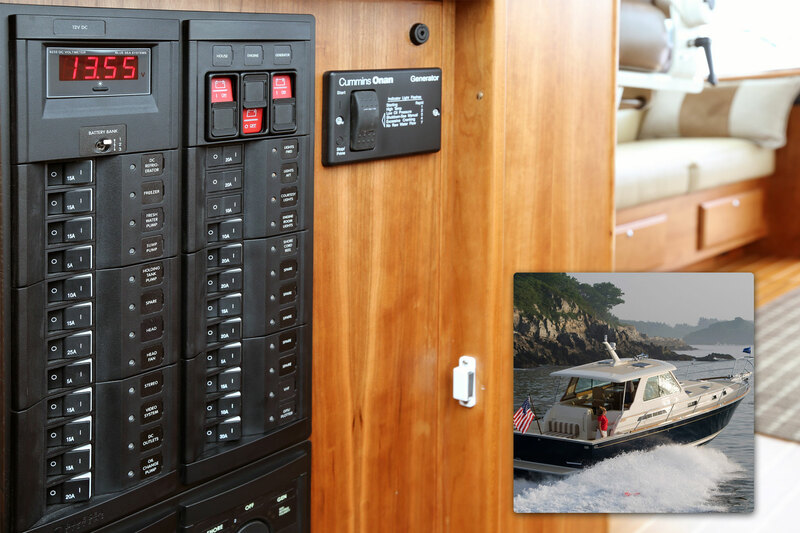 Grady White uses Blue Sea Systems 7039 187-Series Thermal Circuit Breakers aboard their boats, including the Canyon 271. 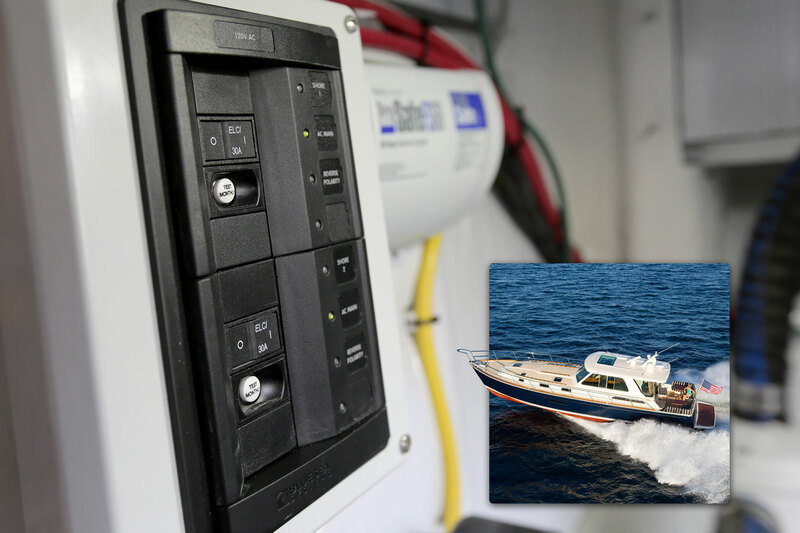 Grady White uses Blue Sea Systems 9001e e-Series Battery Switches for battery management aboard their boats, including the Canyon 271. 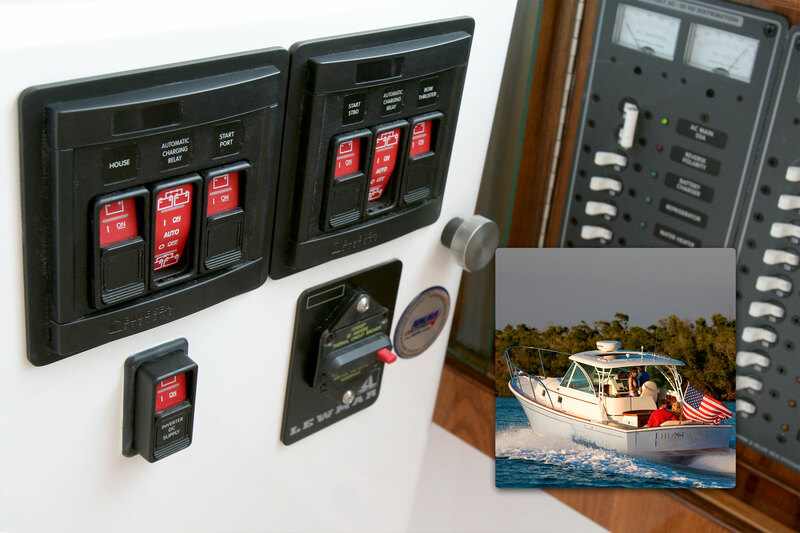 Grady White uses Blue Sea Systems 6007 m-Series Battery Switches for battery management aboard their boats, including the Canyon 306. 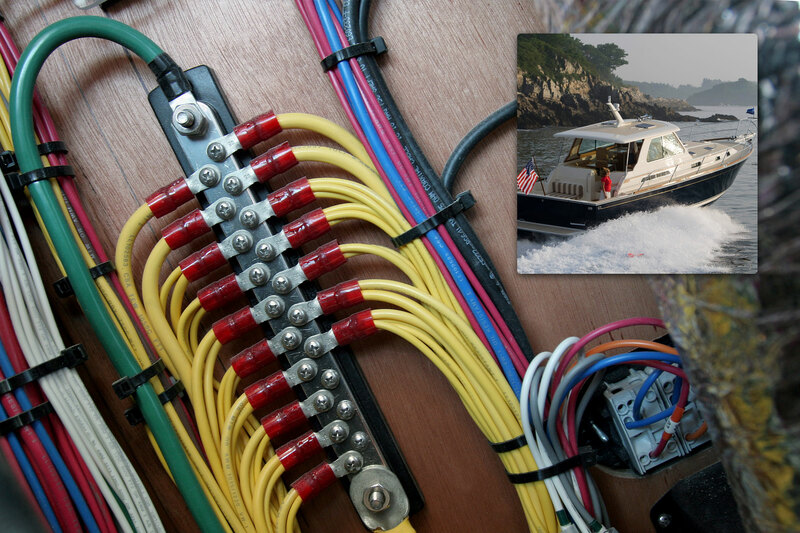 Grady White uses Blue Sea Systems 7039 187-Series Thermal Circuit Breakers aboard their boats, including the Canyon 306. 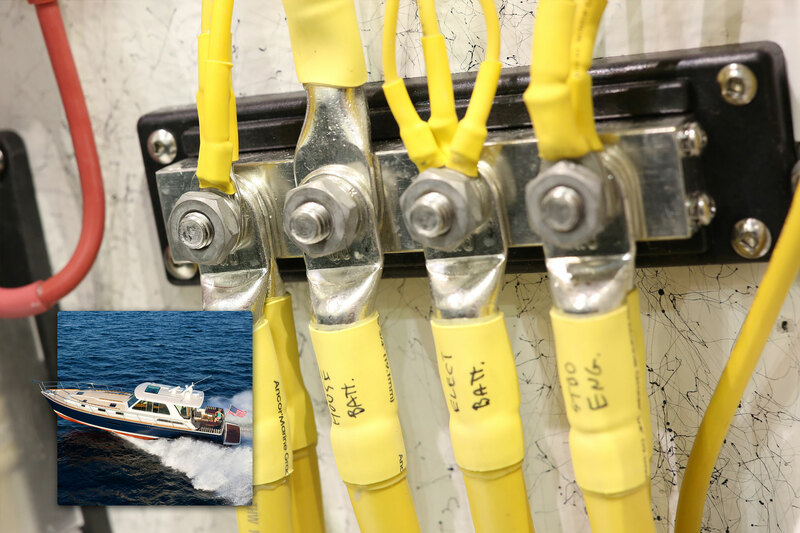 Grady White uses Blue Sea Systems 5015 AGC Fuse Block for consolidated circuit protection aboard the Canyon 336. 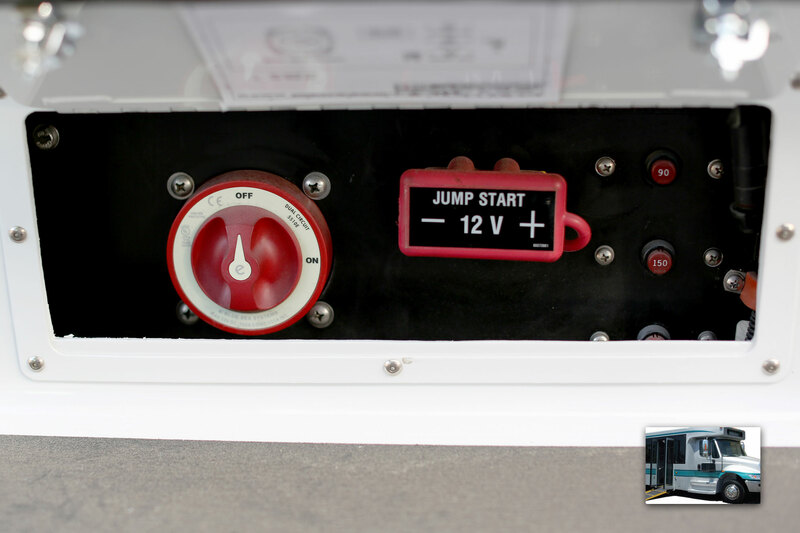 Grady White uses the 8247 Digital Multimeter in their panel to monitor critical AC functions aboard the Canyon 336. 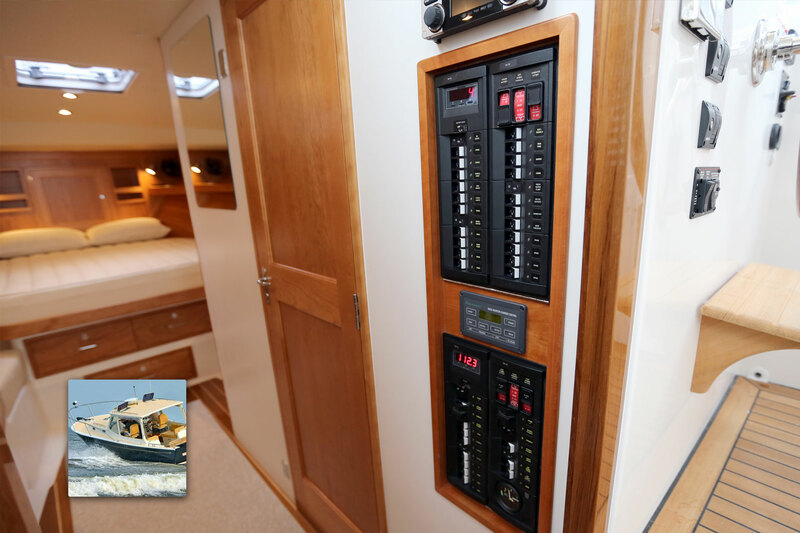 Grady White uses Blue Sea Systems battery switches, including the 9001e e-Series Battery Switches for battery management aboard the Canyon 336. 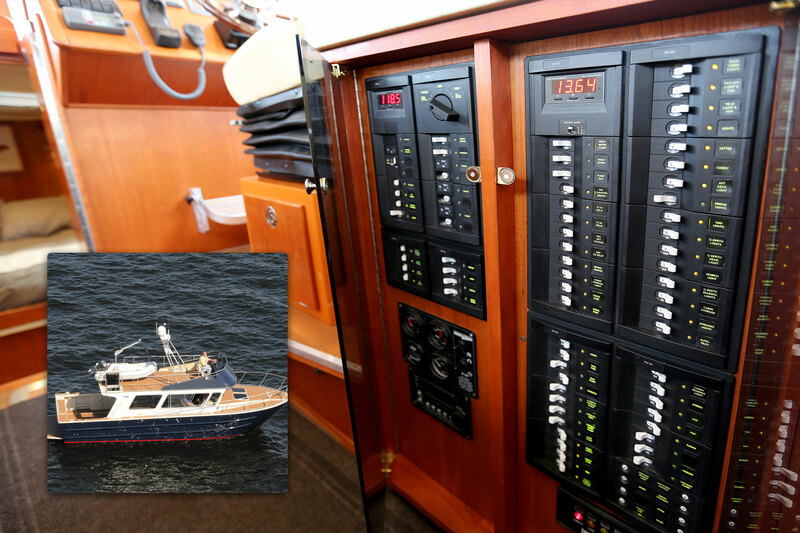 Hinckley Yachts relies on Blue Sea Systems electrical products including the Custom 360 Panel for the T34. 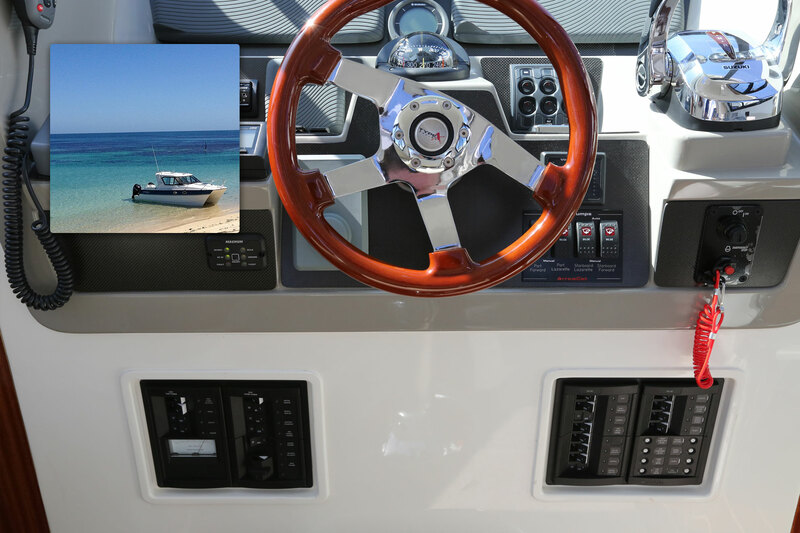 Hunt Yachts specifies the Blue Sea Systems 2104 600A PowerBar aboard the Surfhunter 33. 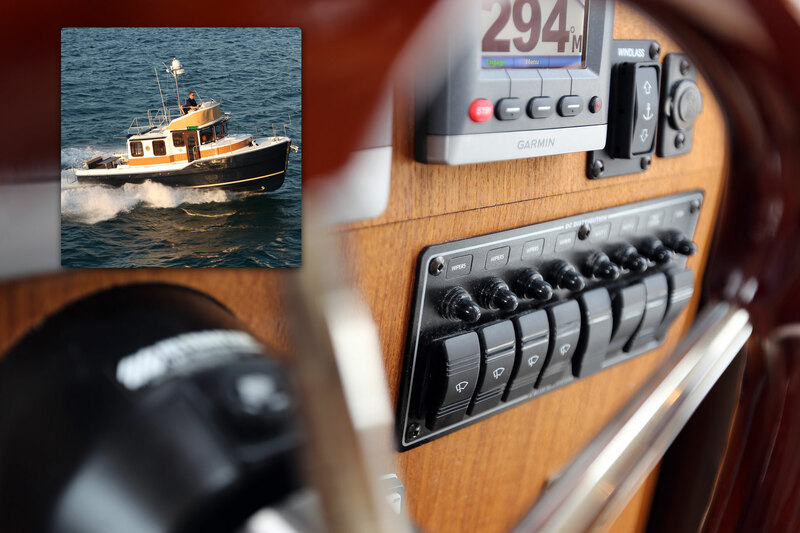 Traditional Metal Panels at the helm aboard the Hunt Yachts Surfhunter 33. 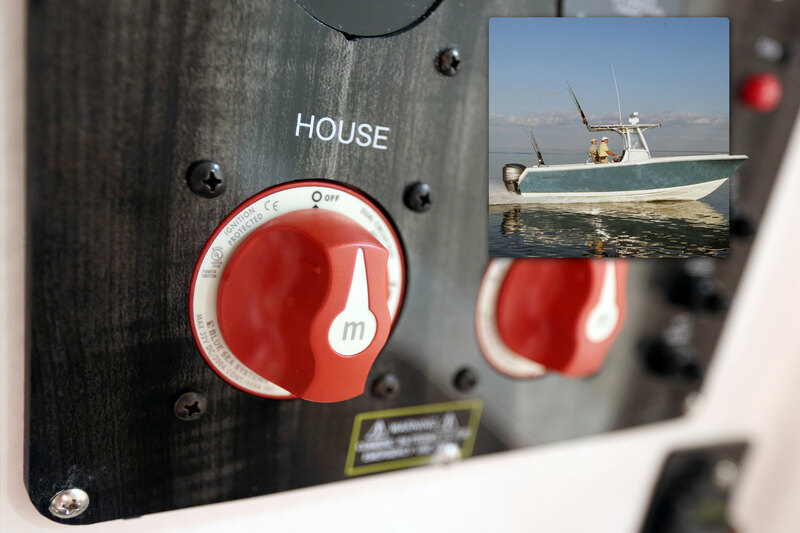 Hunt Yachts installs the waterproof WeatherDeck® Panels on the Surfhunter 25 Center Console. 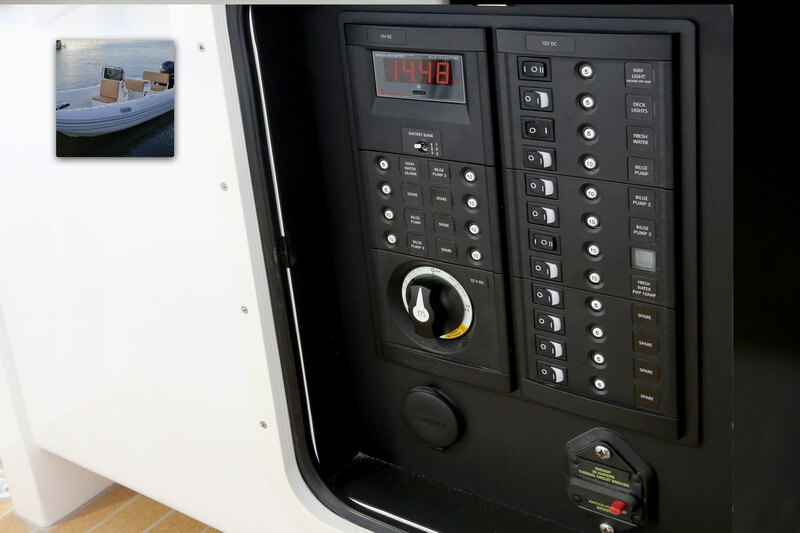 Hunt Yachts makes battery management easier by placing the Blue Sea Systems 1147 Remote Control Contura Switch Panel at the helm of the Surfhunter 33. 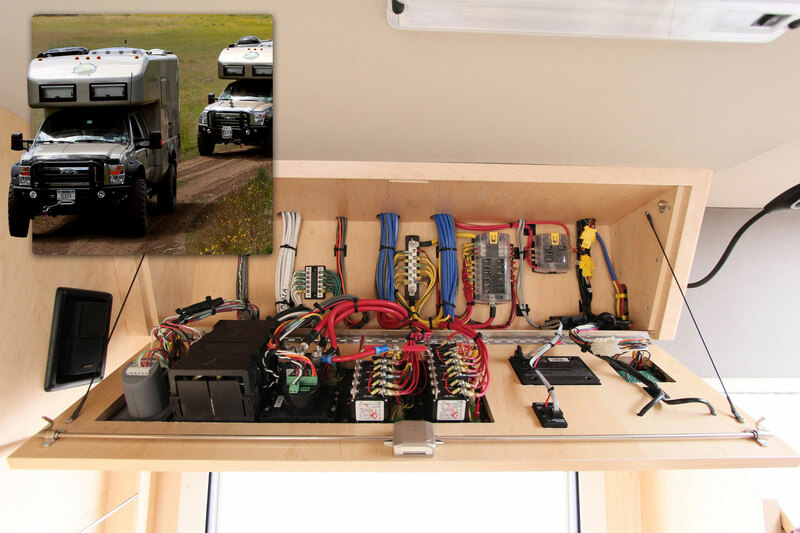 Intercontinental Truck Body specifies Custom 360 Panels, ML-RBS, ML-ACR, busbars, and circuit protection devices aboard Command Trailers used by government and broadcast agencies. 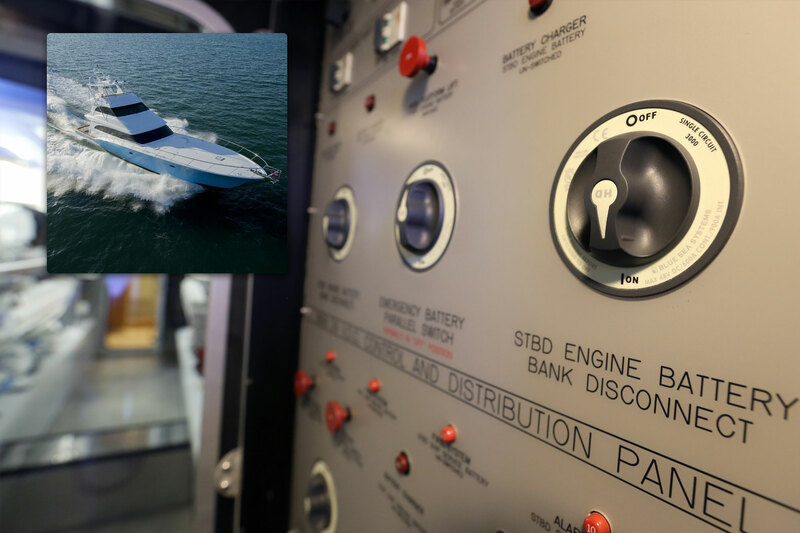 Intrepid Powerboats relies on Blue Sea Systems Custom 360 Panels installed in the cabins of the 400 Cuddy for power distribution and metering critical systems. 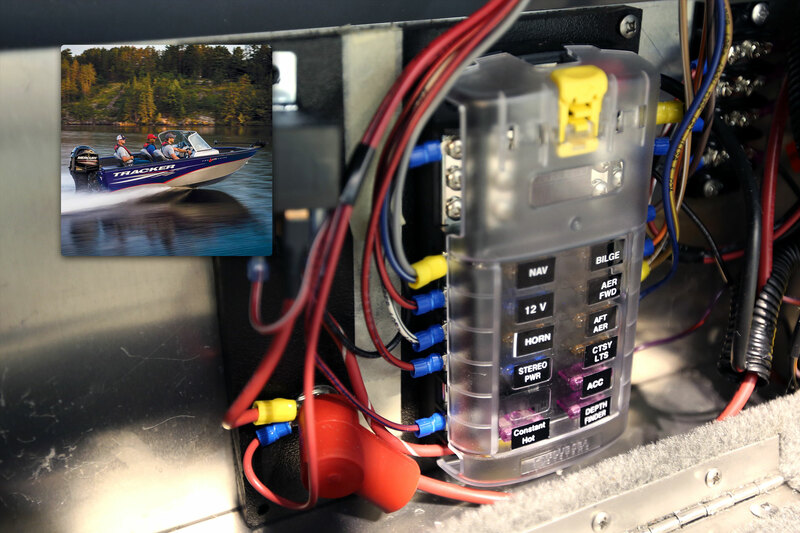 Intrepid Powerboats battery management system is controlled using Blue Sea Systems ML-Series Automatic Charging Relays and Remote Battery Switches aboard the 400 Cuddy. 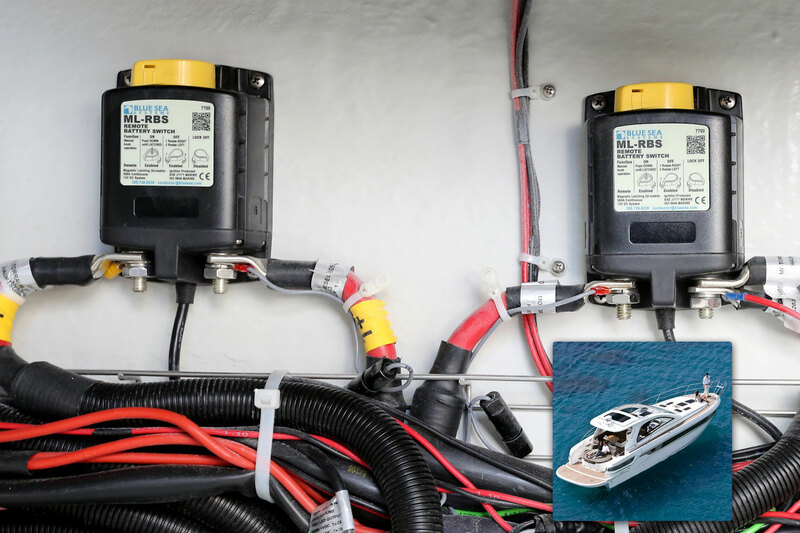 Intrepid Powerboats battery management system is controlled using Blue Sea Systems ML-Series Automatic Charging Relays and Remote Battery Switches aboard the 475 Panacea. 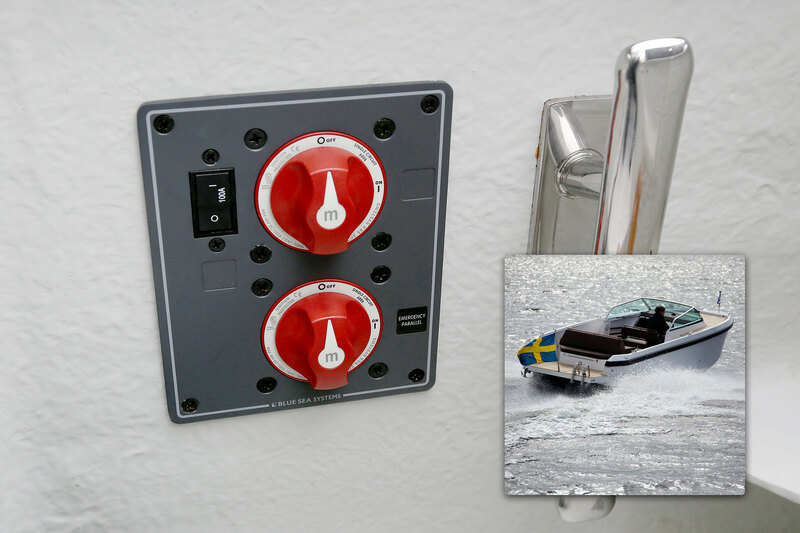 Intrepid Powerboat owners can control the battery management systems using remote control Contura switches mounted near the helm. 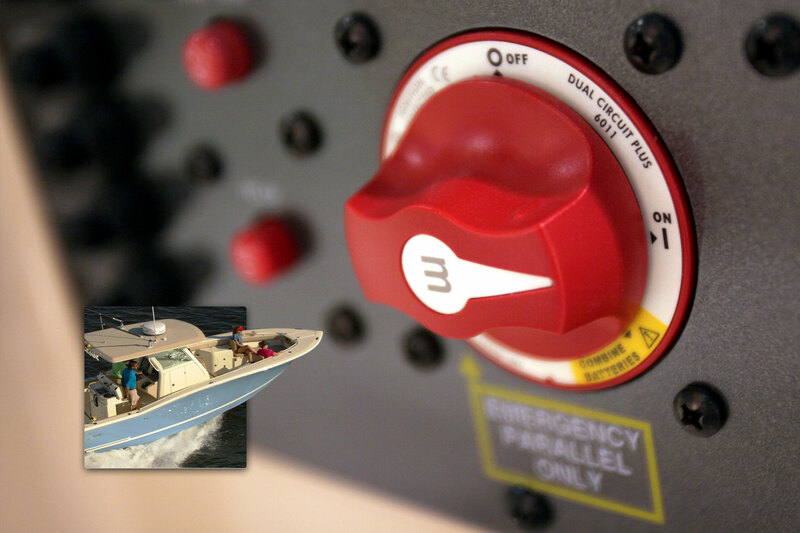 Maverick Boats installs the Blue Sea Systems 6007100 m-Series battery switches aboard the Mirage 17 HPX. 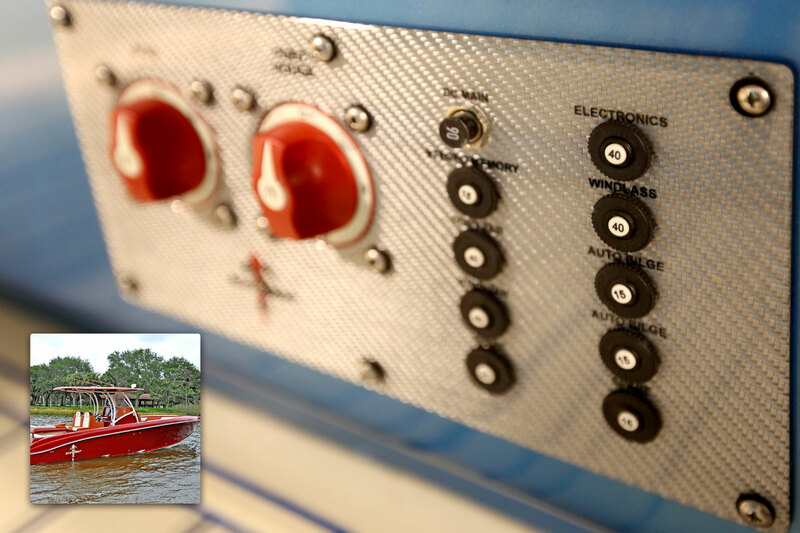 Metal Shark boats builds custom aluminum boats for government agencies. 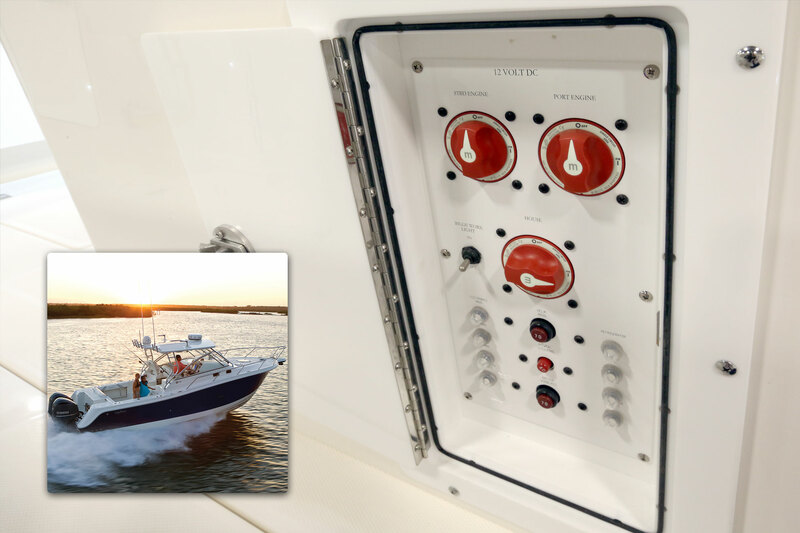 The Custom 360 Panel is housed inside the center console and distributes power to critical loads aboard the Relentless 28. 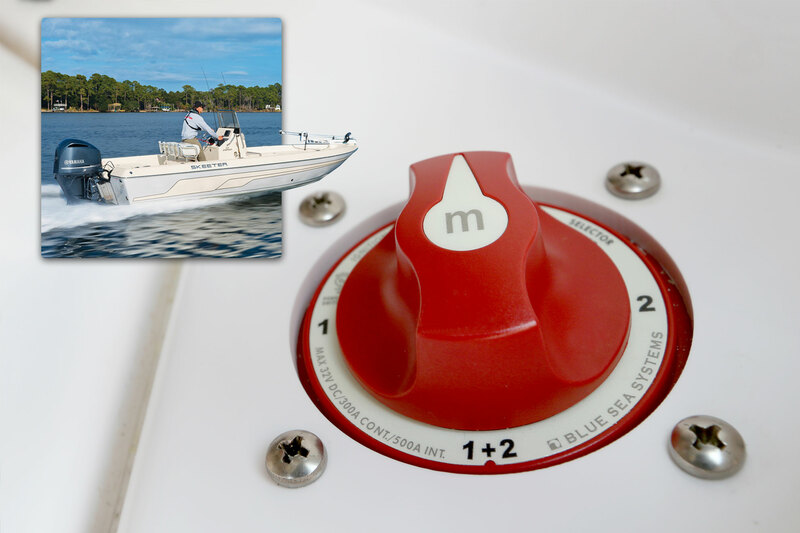 Metal Shark boats builds custom aluminum boats for government agencies and uses the 3116 Surface Mount System (SMS) with ELCI aboard the Relentless 28. 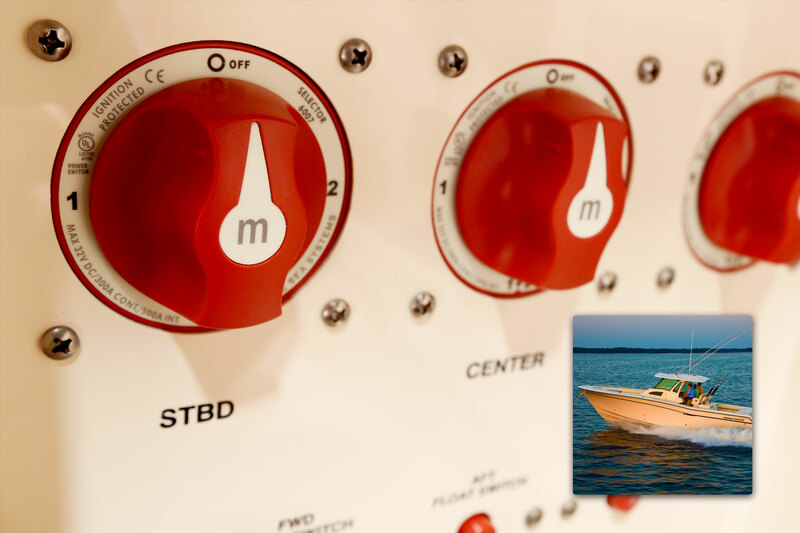 Metal Shark builds custom aluminum boats for government agencies, The 5035 Fuse Block is a critical circuit protection component aboard the Relentless 28. 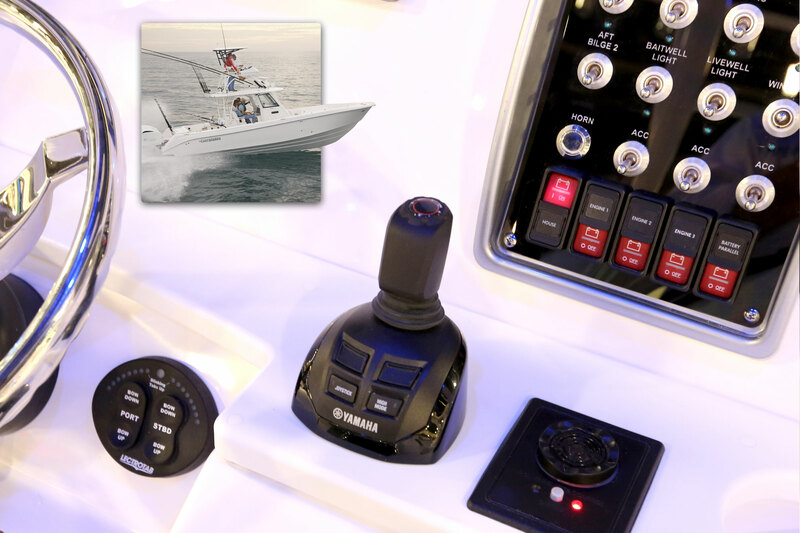 The 7508 DeckHand Dimmer allows operators to dim the dash lights during critical maneuvers aboard the Metal Shark Relentless 28. 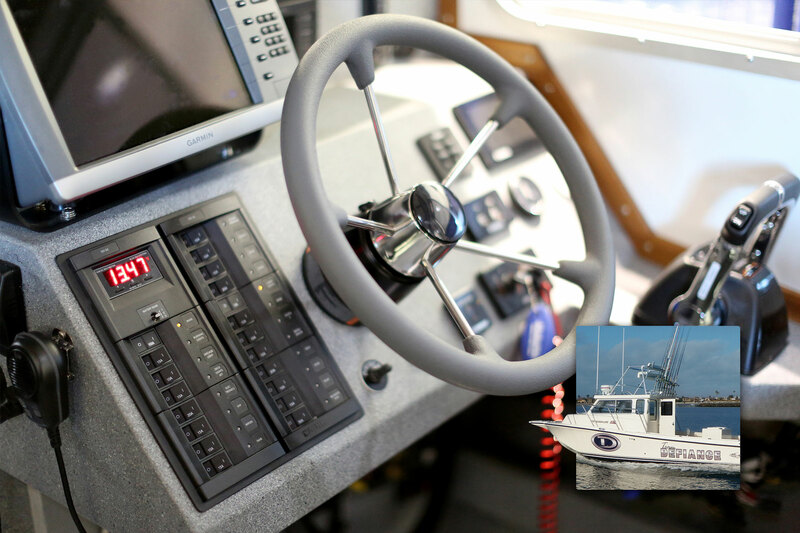 MJM Yachts builds boats in Boston which use Blue Sea Systems products including Custom 360 Panels aboard the 41Z. 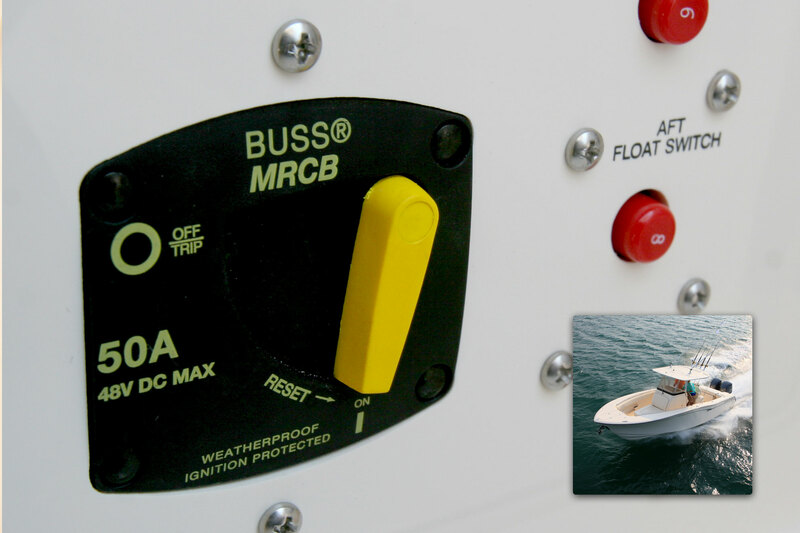 MJM Yachts builds boats in Boston which use Blue Sea Systems products including Custom 360 Panels aboard the 36Z. 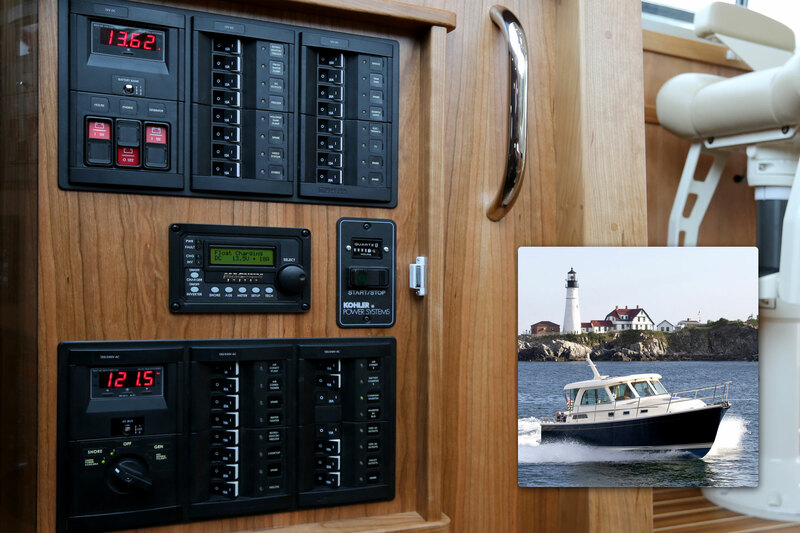 NauticStar Boats uses Blue Sea Systems 6006 m-Series Battery Switches aboard their flagship 2500 XS. 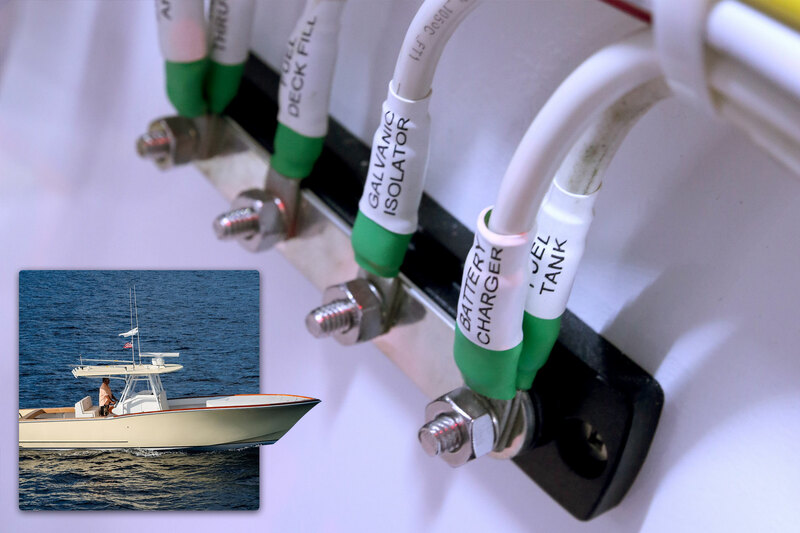 NauticStar Boats uses Blue Sea Systems Terminal Fuse Blocks aboard their flagship 2500 XS. 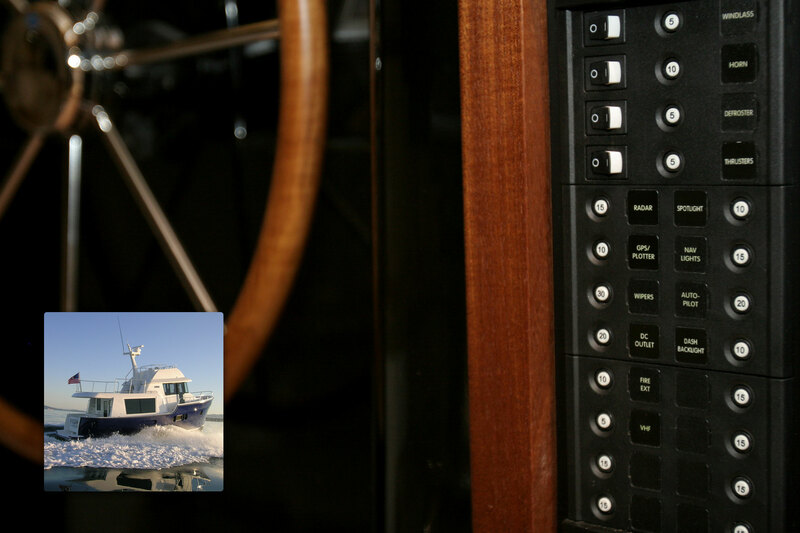 Nordhavn Yachts protect high amp loads with multiple Blue Sea Systems ClassT and ANL fuse blocks on the Nordhavn 60 motor yacht. 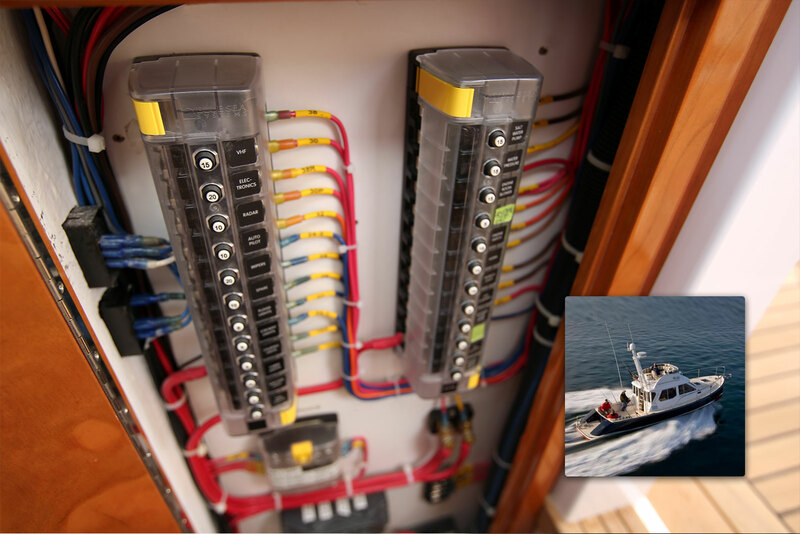 Nordhavn Yachts relies on Blue Sea Systems circuit protection devices including the 5503 ANL Fuse Block aboard the 68 motor yacht. 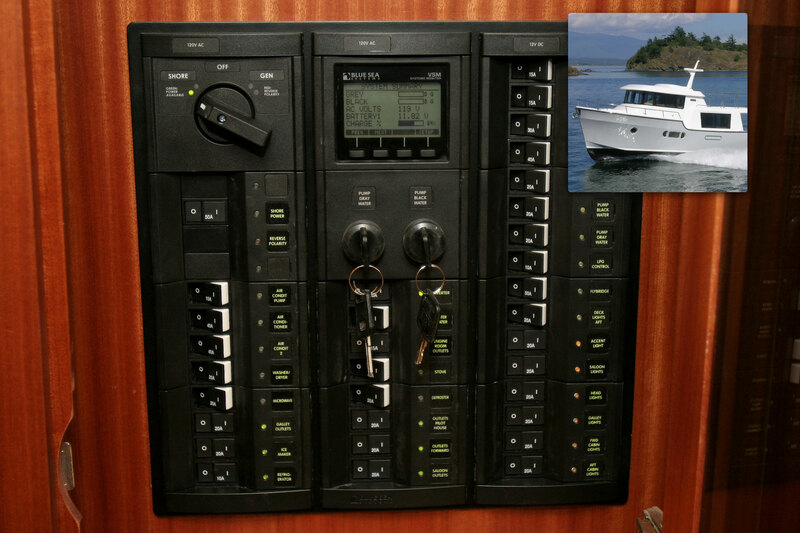 Nordhavn Yachts specifies a bank of Blue Sea Systems 9003e Battery Switches aboard the 68 motor yacht. 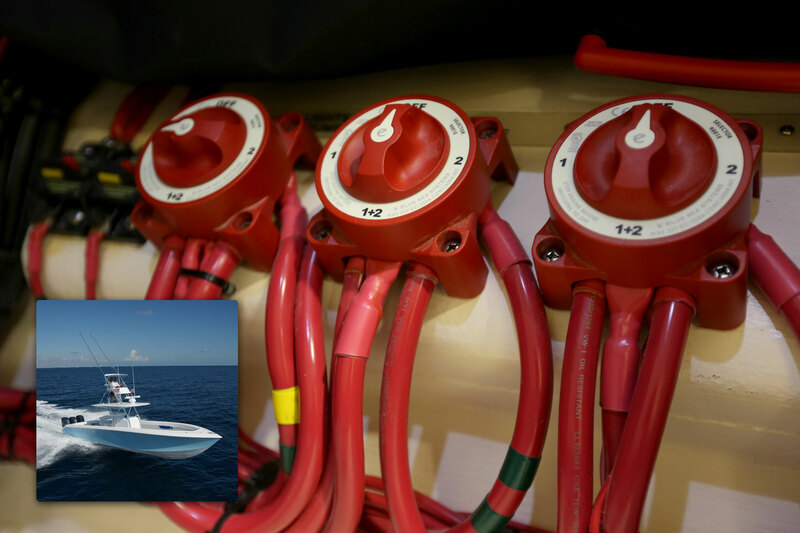 Nordhavn Yachts relies on Blue Sea Systems circuit protection devices including the Class T Fuses and ANL Fuses aboard the 63 motor yacht. 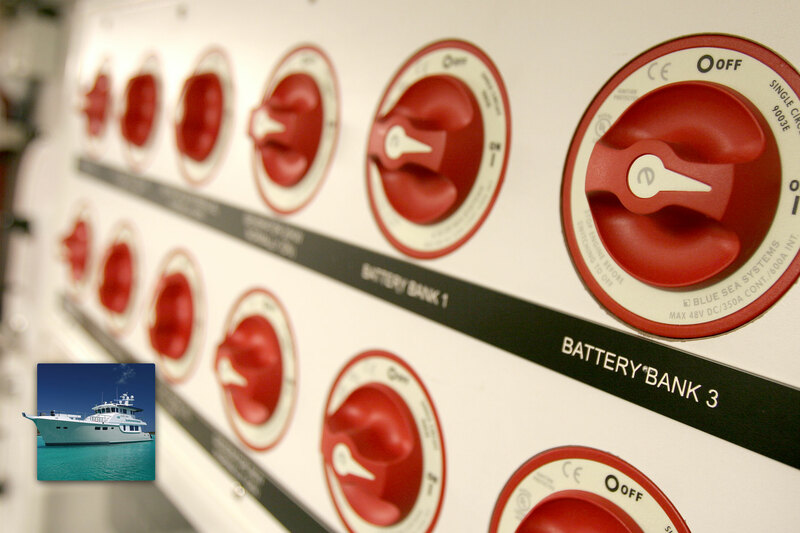 Nordhavn Yachts specifies a bank of Blue Sea Systems 9003e Battery Switches aboard the 63 motor yacht. 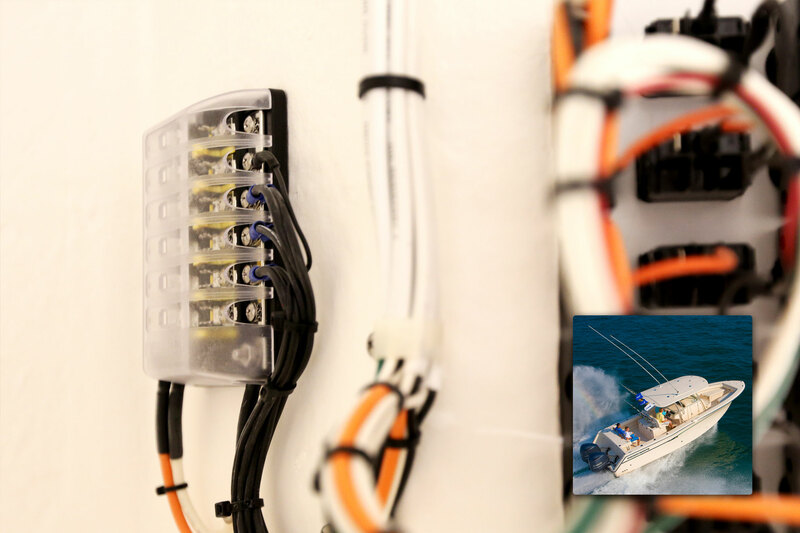 Nordic Tug relies on AC and DC power distribution by specifying Blue Sea Systems Custom 360 Panels aboard the 37. 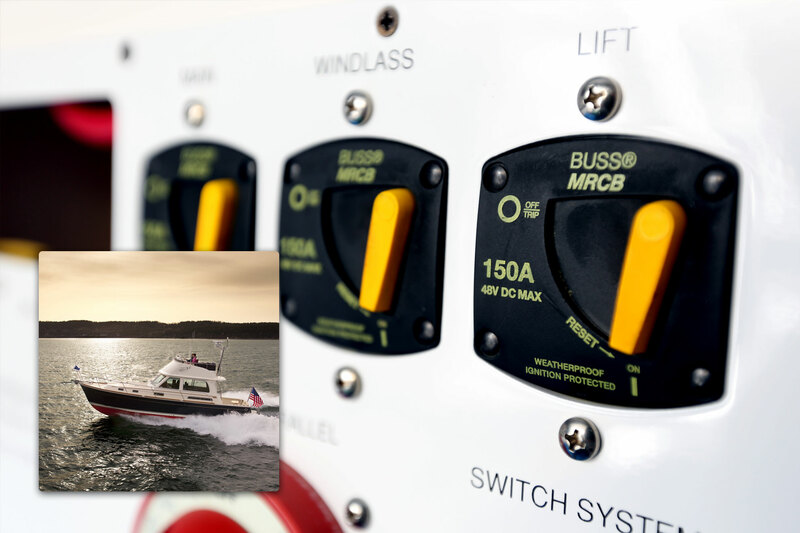 Nordic Tug relies on AC and DC power distribution by specifying Blue Sea Systems Custom 360 Panels aboard the 39. 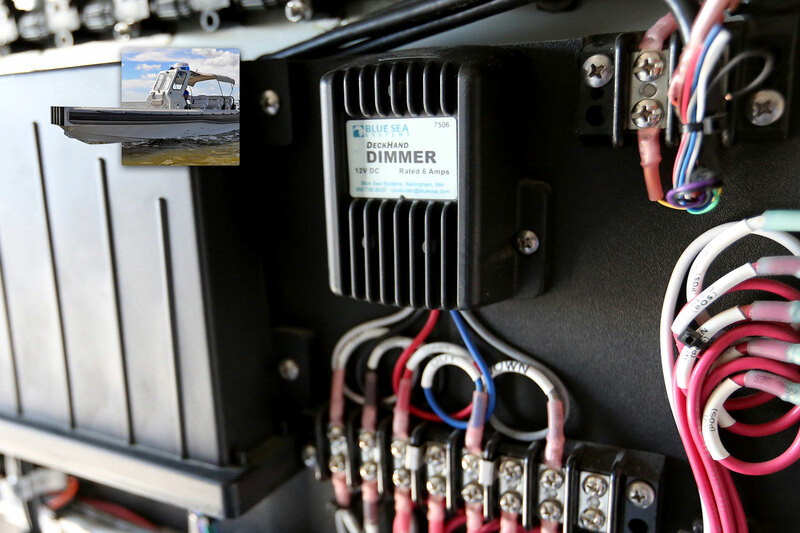 North River Boats, builder of recreational and commercial aluminum boats, uses the Blue Sea Systems 8689 Battery Management Panel aboard the Seahawk Offshore 24 boat. 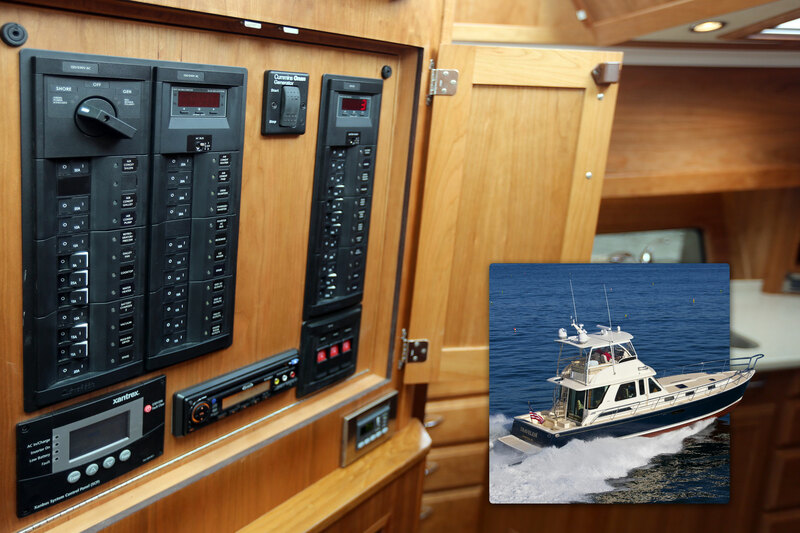 Novurania installs Blue Sea Systems product aboard the Deluxe 550, including the 4378 WeatherDeck® Waterproof CLB Panel. 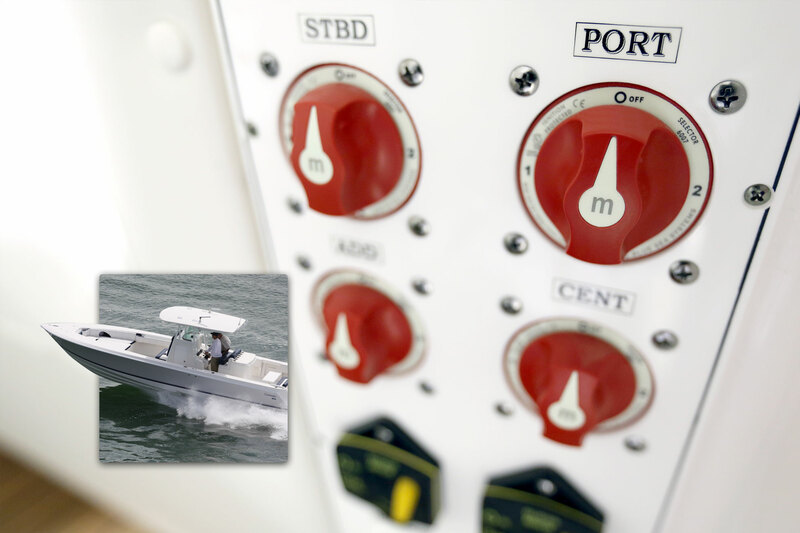 Novurania installs Custom 360 Panels aboard the Chase 30 rigid inflatable boat. 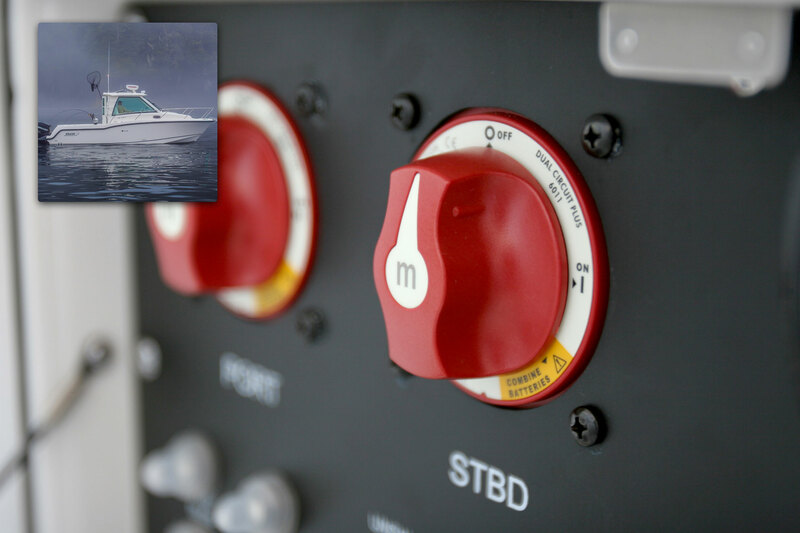 Novurania installs Blue Sea Systems product aboard the Deluxe 400, including the 4374 WeatherDeck® Waterproof CLB Panel. 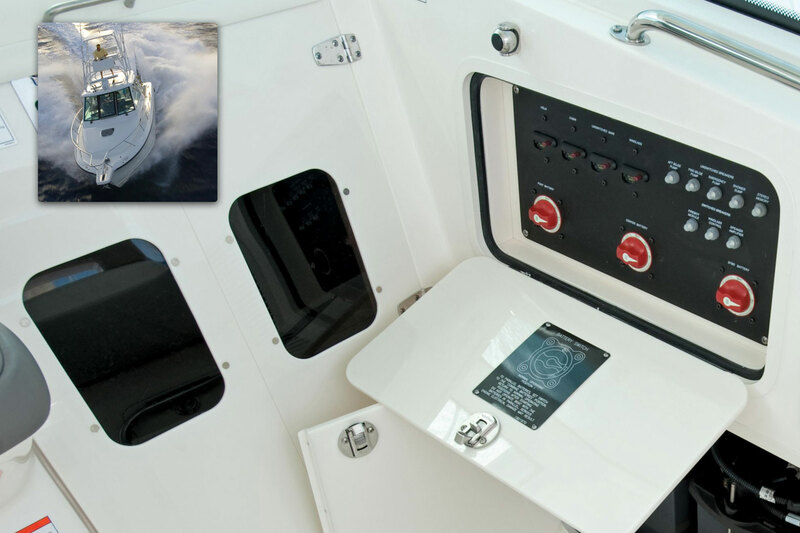 Novurania installs Custom 360 Panels aboard the Catamaran Series 24 rigid inflatable boat. 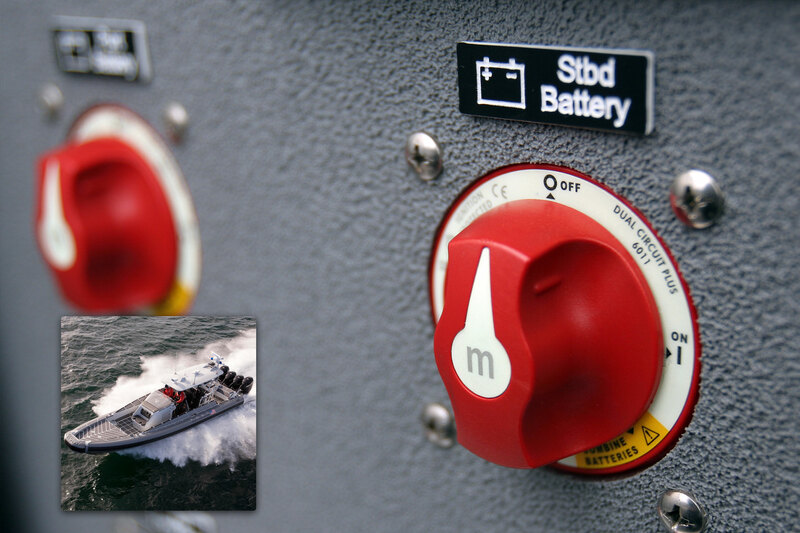 Novurania installs Blue Sea Systems 8689 Battery Management Panels on the Chase 23 rigid inflatable boat. 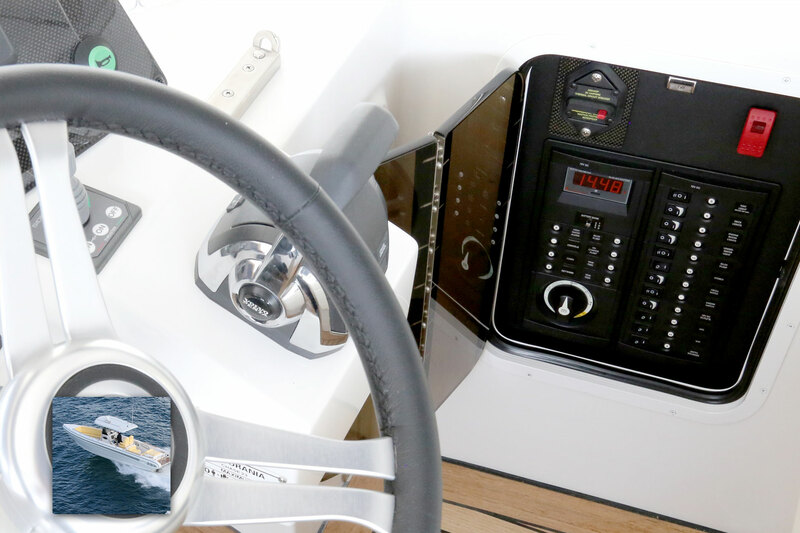 The helm station aboard the Ocean Sport Legacy 26 includes the 1801 Vessel Systems Monitor which is integrated in the Custom 360 Panel. 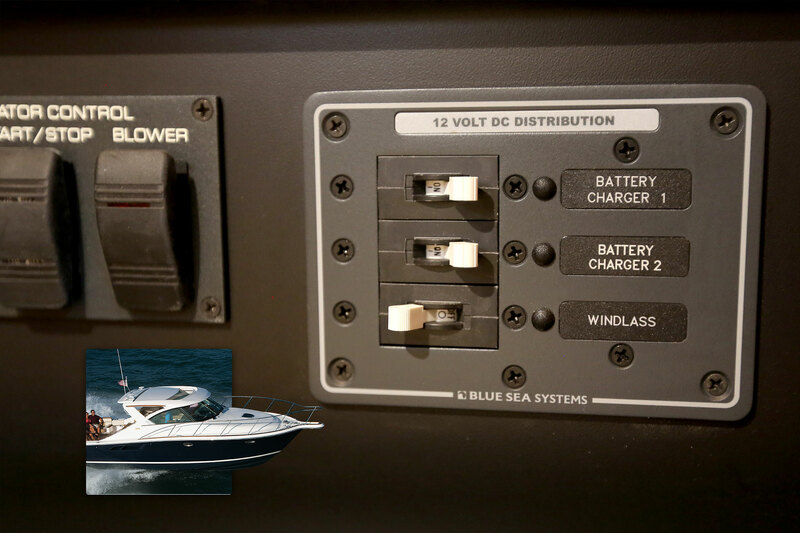 The Ocean Sport Legacy 26 relies on the Blue Sea Systems P12 40A Battery Charger for power conversion. 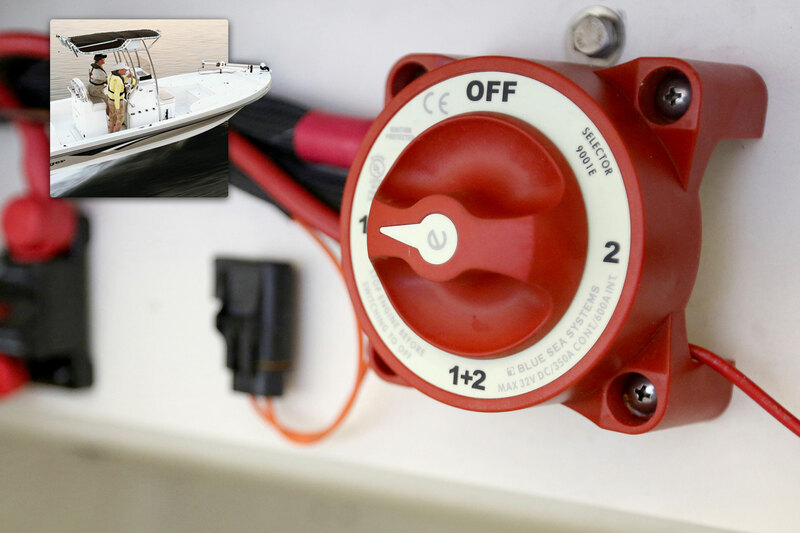 Pathfinder boats uses Blue Sea Systems 6011 m-Series Dual Circuit Plus™ Battery Switches on the 2300. 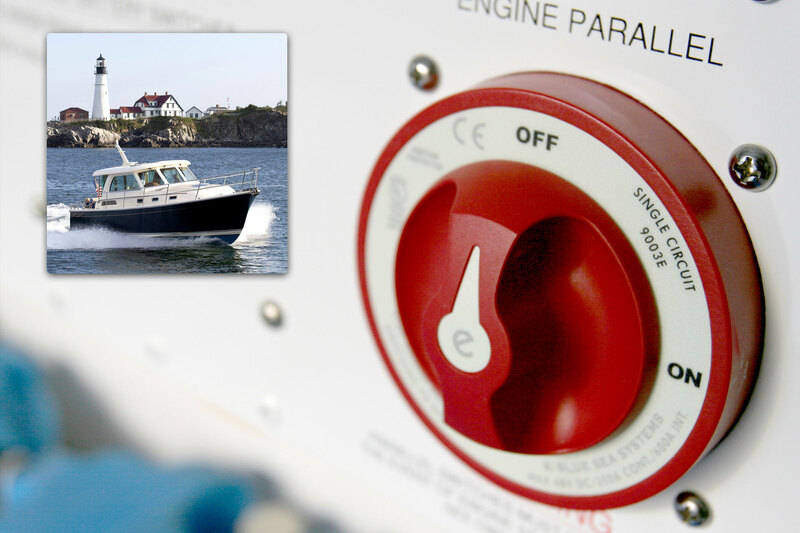 Pathfinder boats uses Blue Sea Systems 6011 m-Series Dual Circuit Plus™ Battery Switches on the 2400. 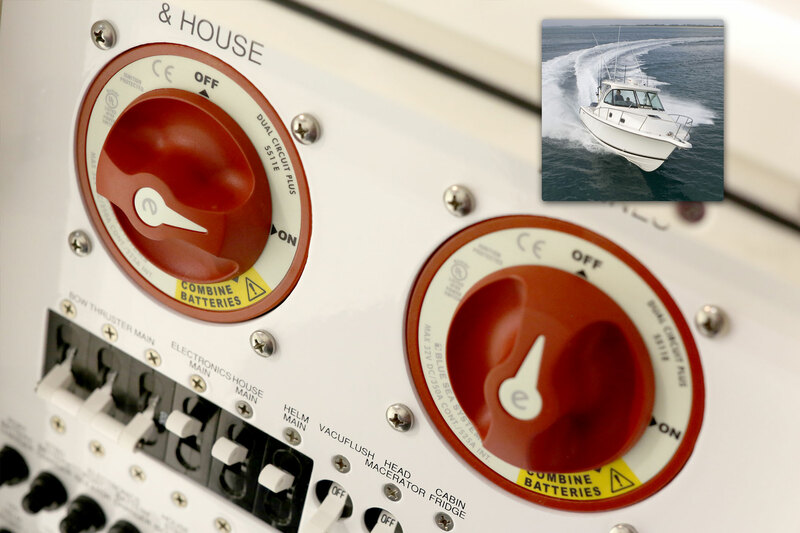 Pathfinder boats uses Blue Sea Systems 6011 m-Series Dual Circuit Plus™ Battery Switches on the 2200. 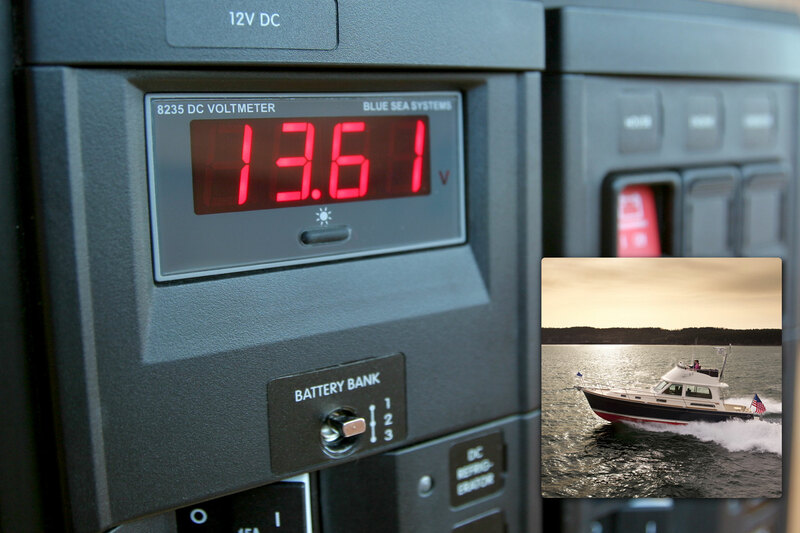 Pursuit Boats specifies the Blue Sea Systems 5511e Dual Circuit Plus battery switches aboard the OS 315. 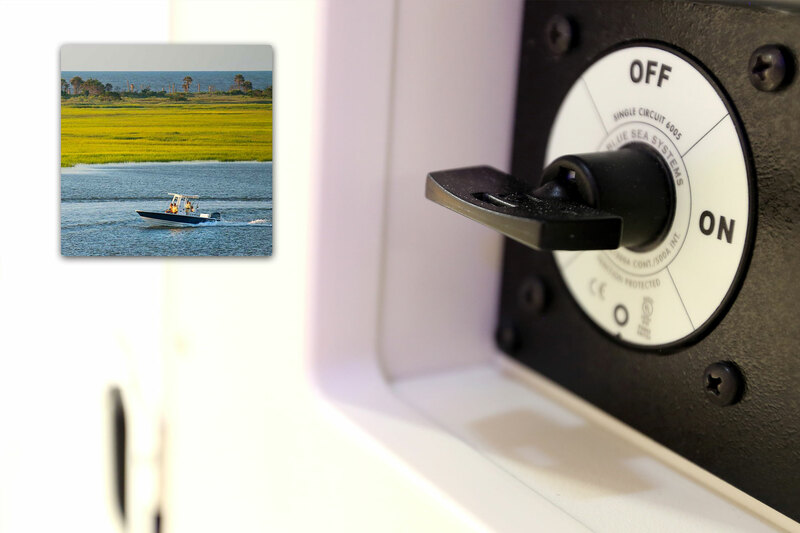 Pursuit Boats specifies the Blue Sea Systems 5511e Dual Circuit Plus™ Battery Switches aboard the OS 385. 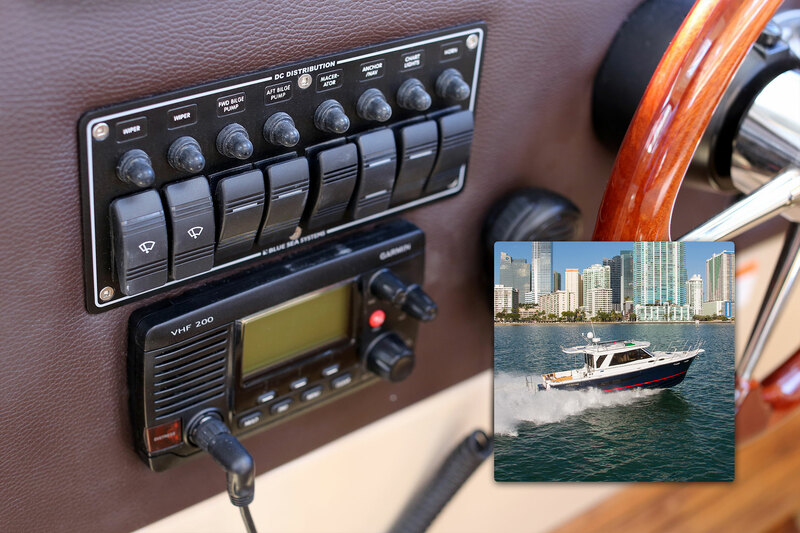 Pursuit Boats specifies the Blue Sea Systems 5511e Dual Circuit Plus™ Battery Switches aboard the ST 280. 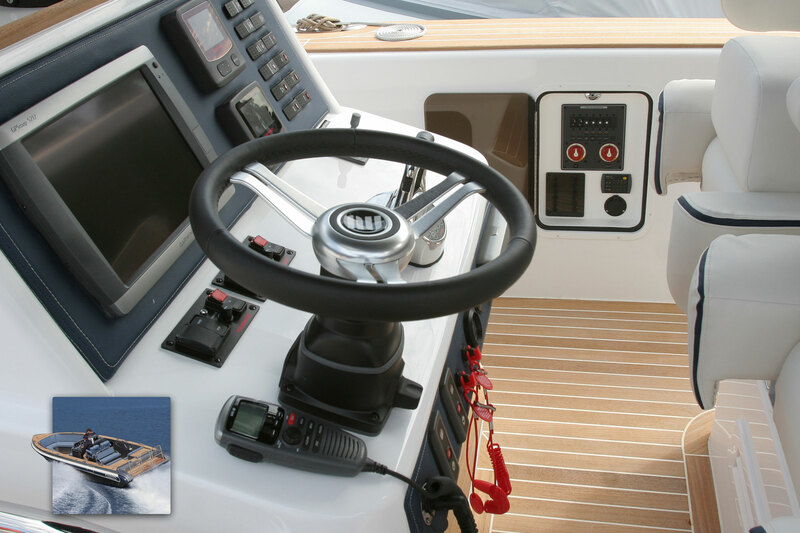 Pursuit Boats specifies the Blue Sea Systems 5511e Dual Circuit Plus™ Battery Switches aboard the ST 310. 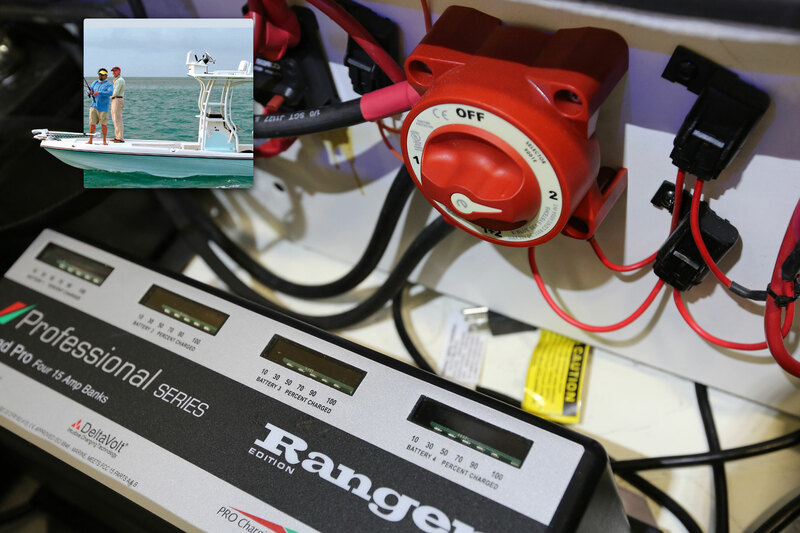 Ranger Boats uses Blue Sea Systems 9001e Battery Switches in the electrical system aboard the 2310 Bay Ranger. 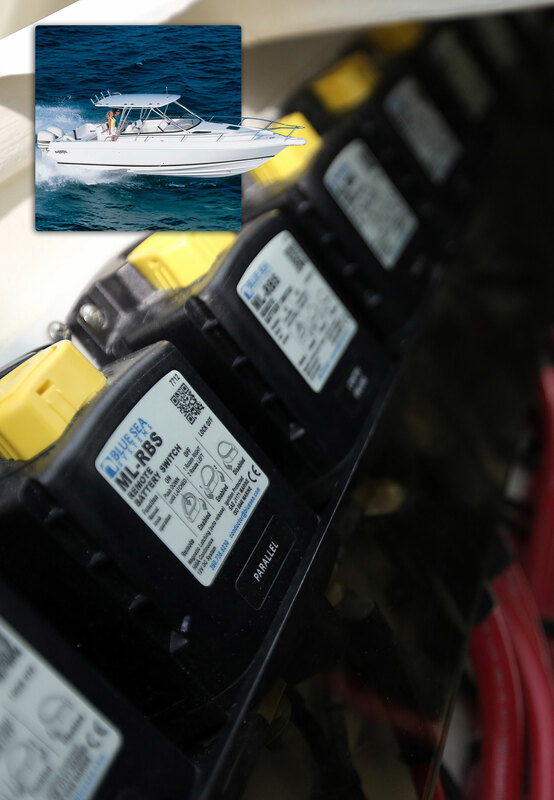 Ranger Boats uses Blue Sea Systems 9001e Battery Switches in the electrical system aboard the 2410 Bay Ranger. 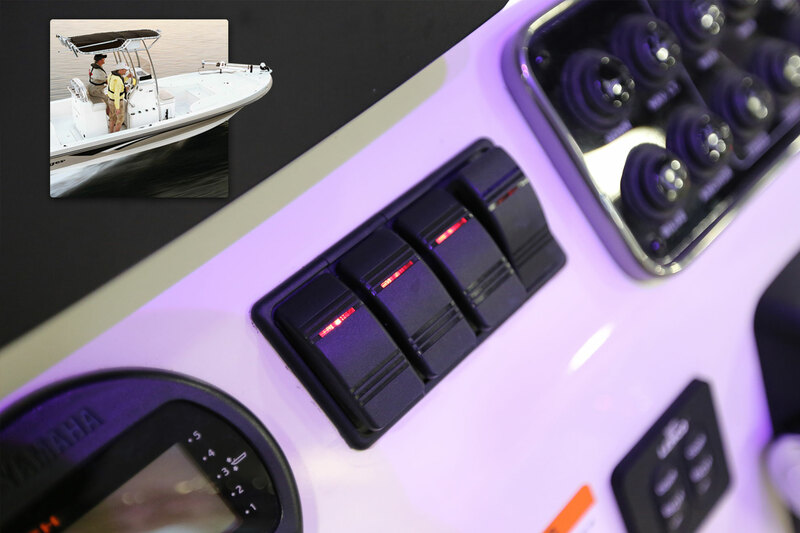 Ranger boats installs Blue Sea Systems waterproof Contura III switches on the dash of the 2310 Bay Ranger to control bilge, wipers, horn, and lights. 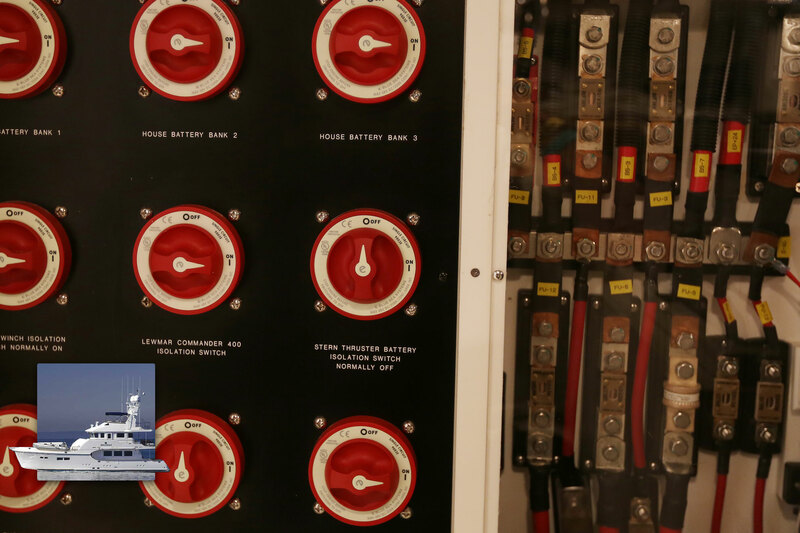 Ranger Tugs installs the Blue Sea Systems 8371 Contura Switch Panel at the helm of the R-27. 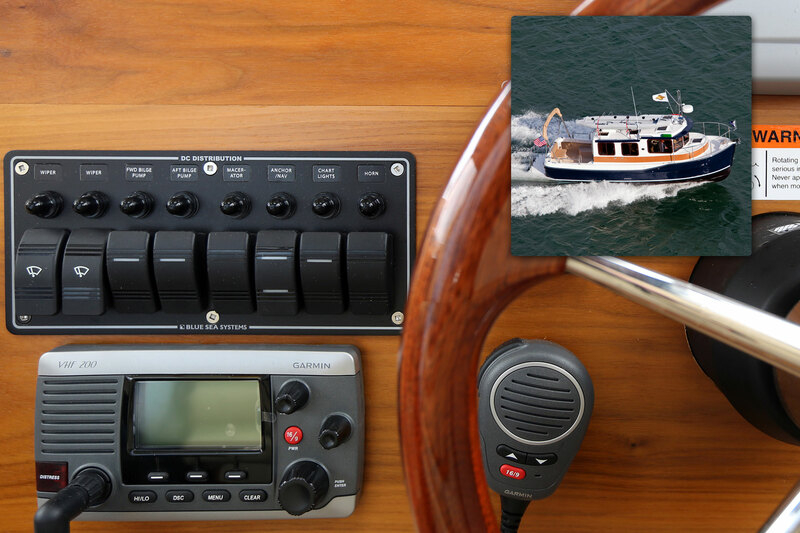 Custom 360 Panels are original equipment aboard the Ranger Tugs R-31. 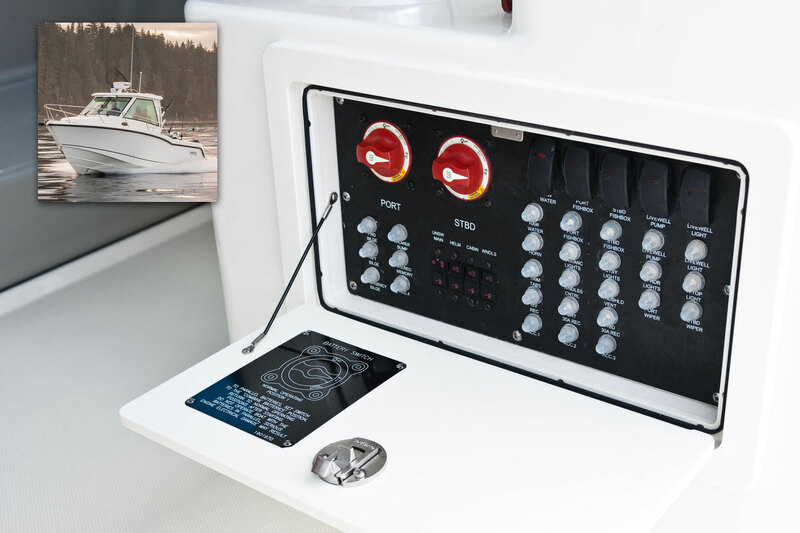 Ranger Tugs installs the Blue Sea Systems 8371 Contura Switch Panel at the helm of the R-31. 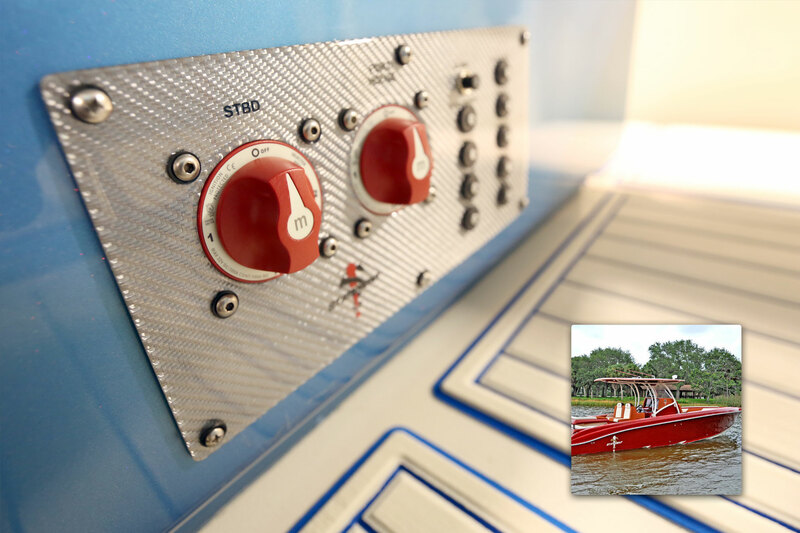 Ranger Tugs relies on the Custom 360 Panel system to manage the AC and DC power distribution aboard their boats, including the R-29. 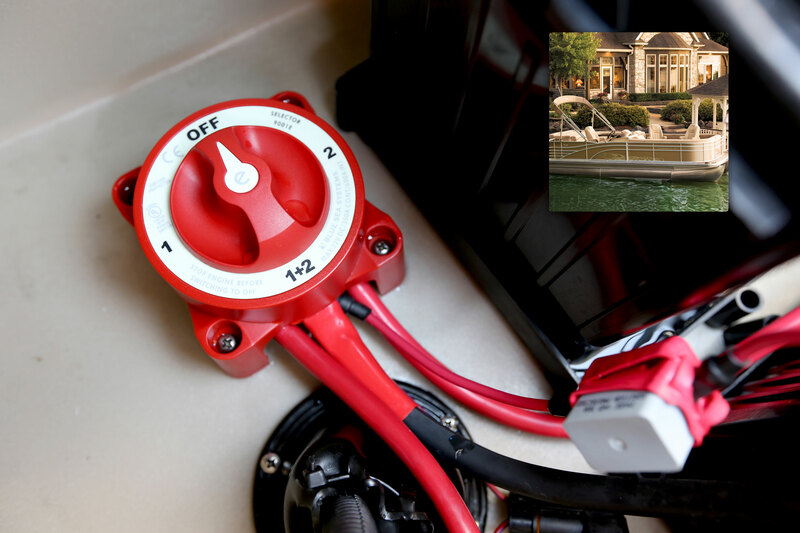 Regal Boats uses the 7712 ML-RBS Remote Battery Switch aboard the 53 Sport Coupe. 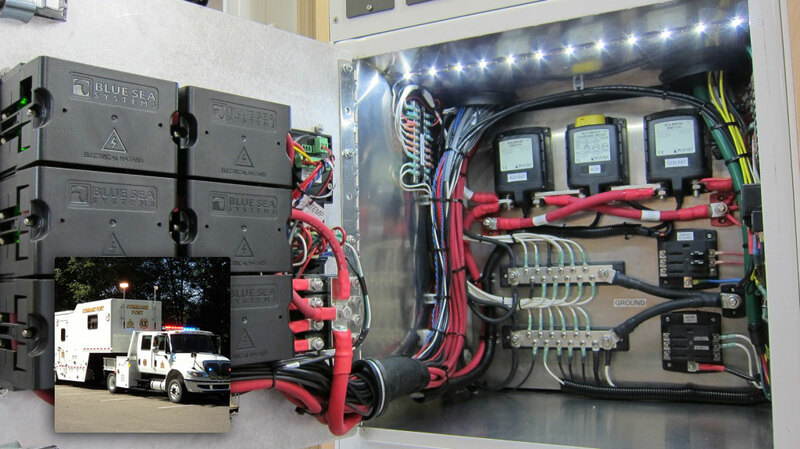 Regulator installs a panel with Blue Sea Systems 5511e Dual Circuit Plus™ and 6006 Battery Switch aboard the 34SS. 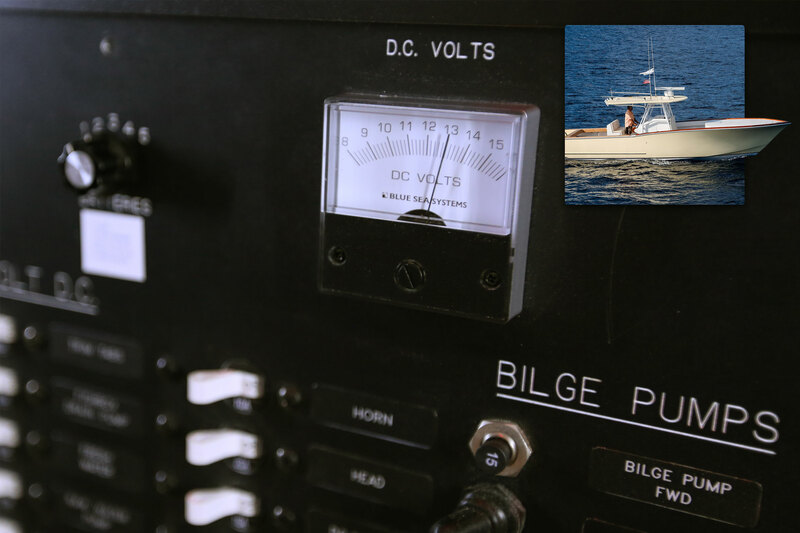 Regulator installs Blue Sea Systems 8235 and 8247 Digital Meters aboard the 34SS. 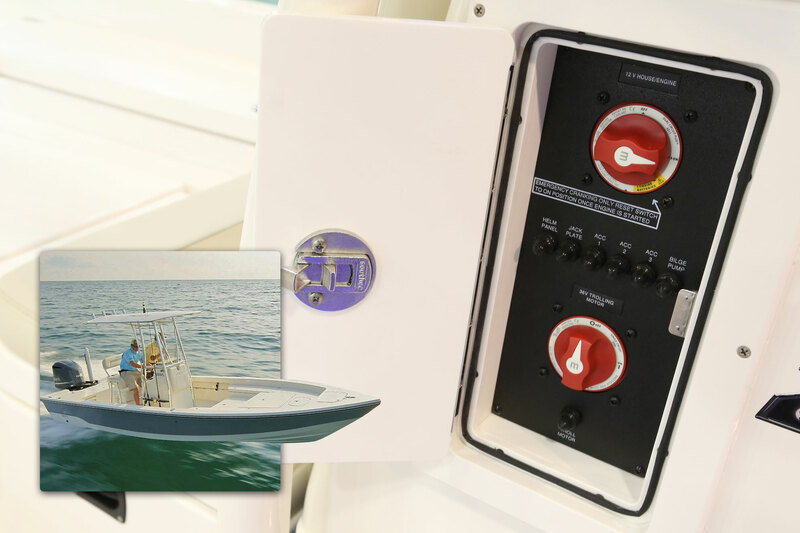 Robalo Boats uses the Blue Sea Systems 6007 Battery Selector Switch aboard the Cayman 226. 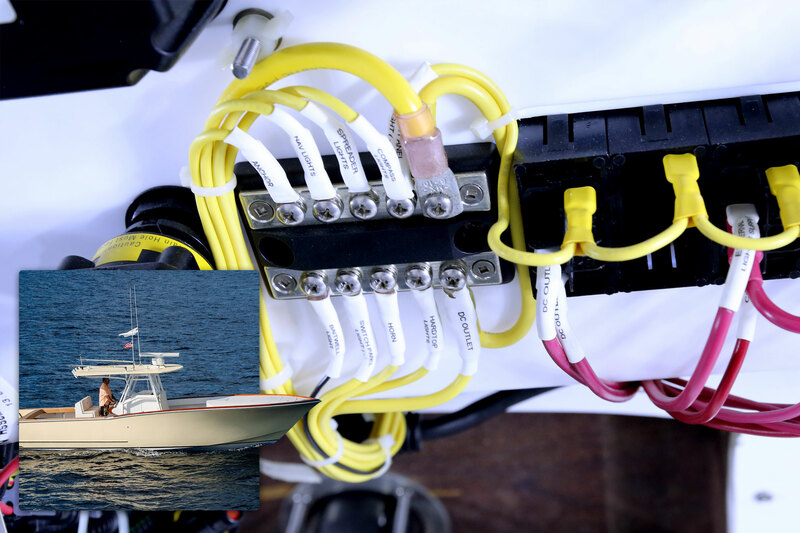 Robertson and Caine use Blue Sea Systems Custom 360 Panels as original equipment aboard their catamarans, including the Leopard 48. 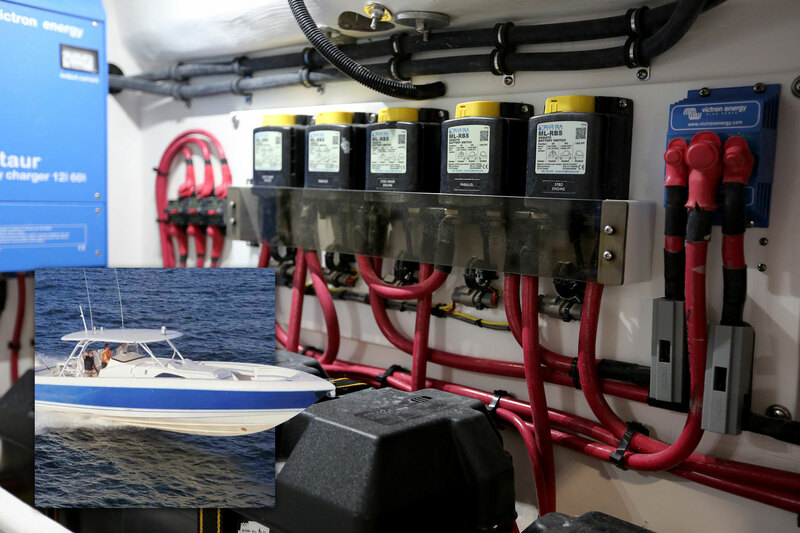 Sabre Yachts installs a bank of Blue Sea Systems battery switches, including the 5511e Dual Circuit Plus™ Battery Switch, in the engine room of the 54 Flybridge Sedan . 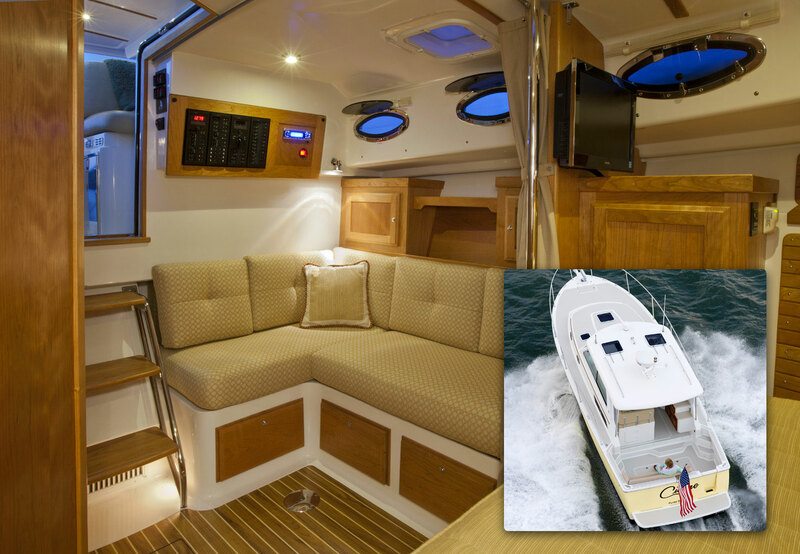 Sabre Yachts installs the Custom 360 Panel in the main salon of a the 54 Salon Express. 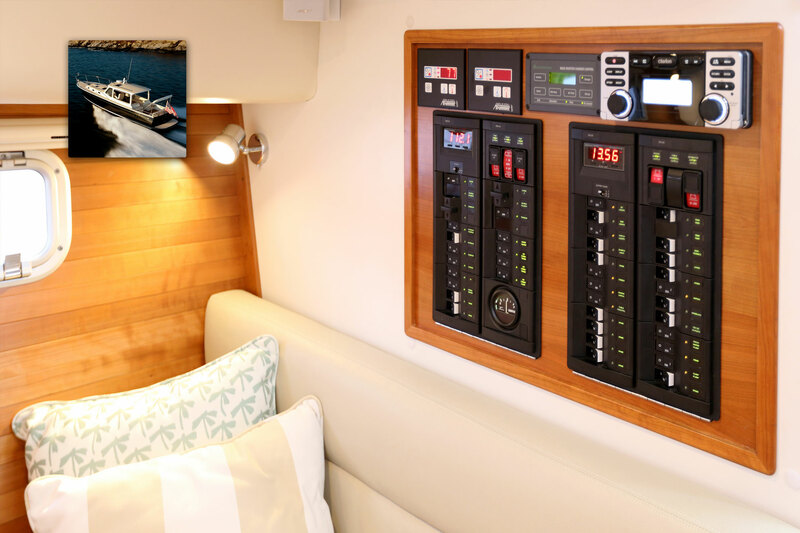 Sabre Yachts installs the Custom 360 Panel in the main salon aboard the 54 Flybridge Sedan. Sabre Yachts specifies the 2302 in the main salon of the 42 Salon Express. 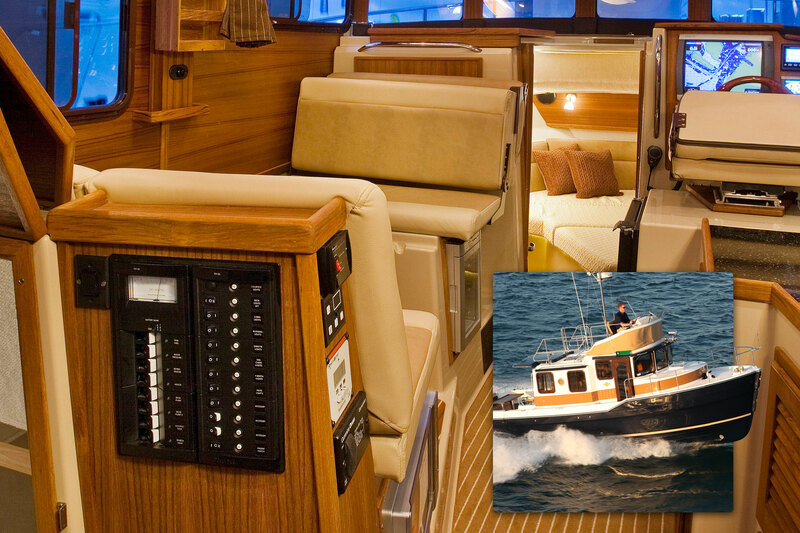 Sabre Yachts of Maine uses the Blue Sea Systems Custom 360 Panels aboard its boats, including the 38 Salon Express. 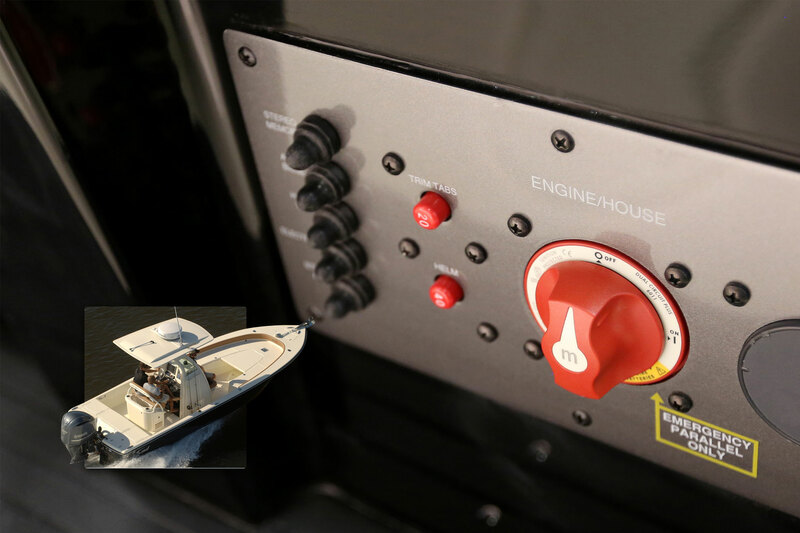 Sabre Yachts uses the Blue Sea Systems e-Series Battery Switch for battery management in the engine room of the 38 Salon Express. 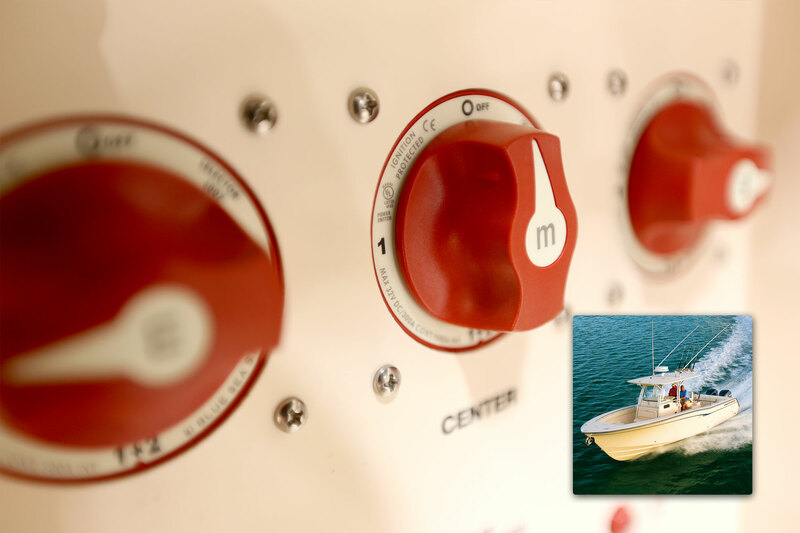 Sabre Yachts installs a bank of 7058 187-Series Thermal Circuit Breakers in the engine room of the 42 Flybridge Sedan. 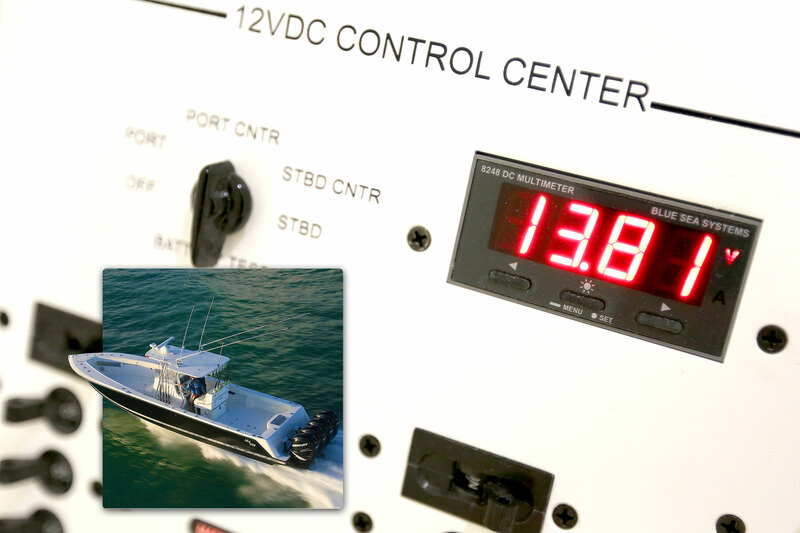 Sabre Yachts specifies the 8235 DC Digital Voltmeter in the Custom 360 Panel at the helm of the 42 Flybridge Sedan. 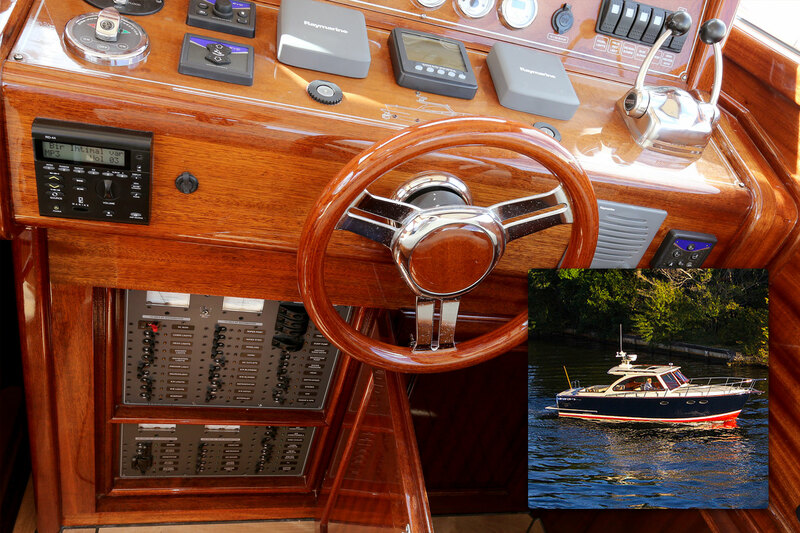 Sabre Yachts installs the Custom 360 Panel at the helm aboard the 42 Flybridge Sedan. 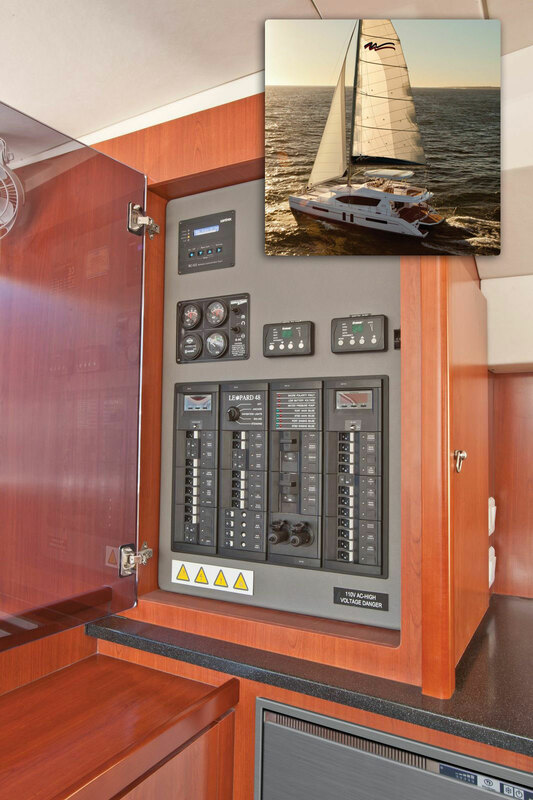 Sabre Yachts uses the 8247 AC Digital Multimeter in the Custom 360 Panel in the main salon of the 42 Salon Express. 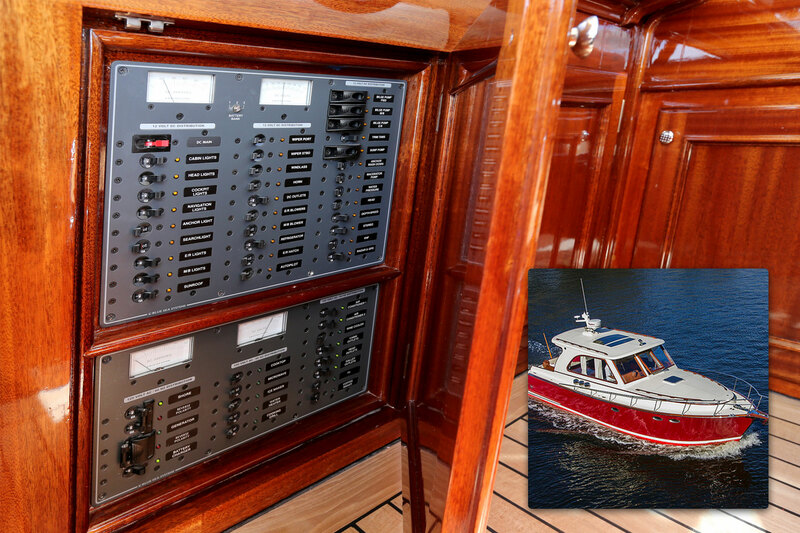 Sabre Yachts installs the Custom 360 Panel in the main salon aboard the 42 Salon Express. 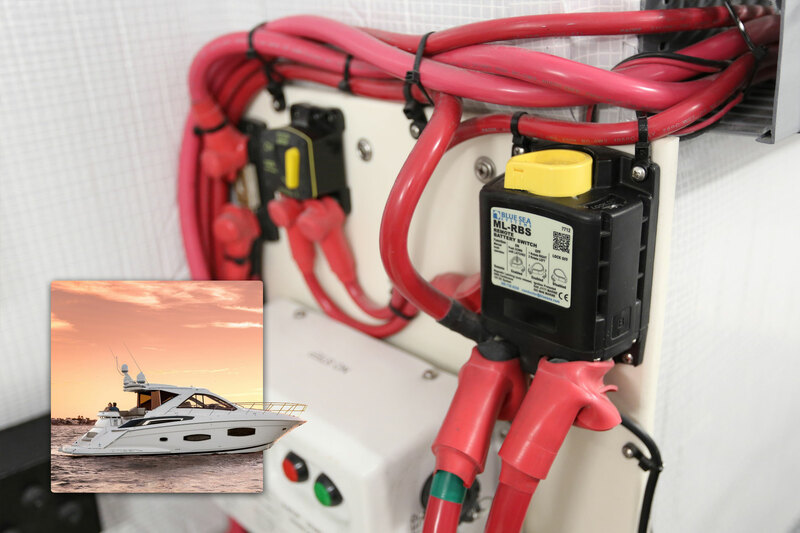 Sabre Yachts uses the 2104 600A PowerBar as a part of the electrical system in the engine room of the 54 Salon Express. 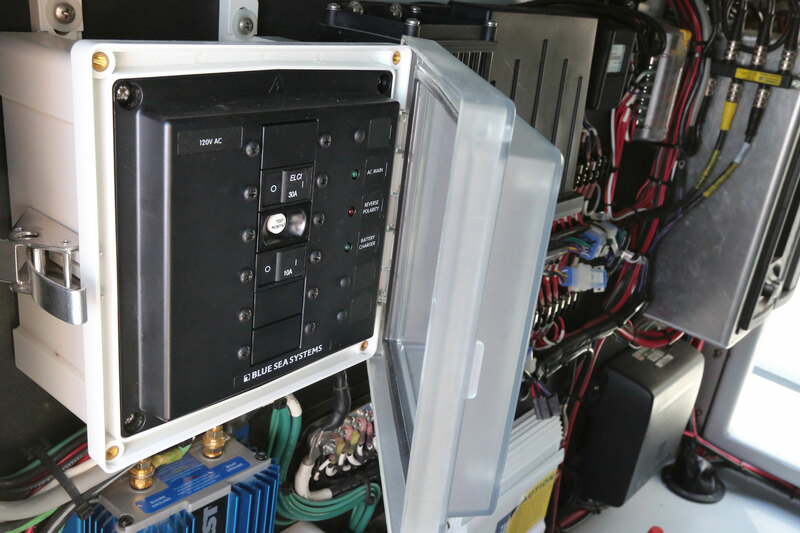 Sabre Yachts relies on the Blue Sea Systems 1190 ELCI Circuit Breaker 360 Panel modules for whole boat AC leakage protection aboard the 54 Salon Express. 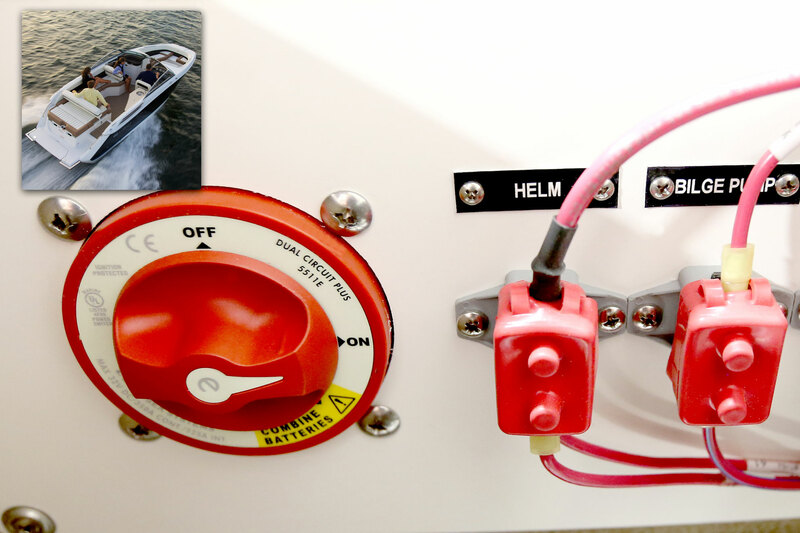 Custom 360 Panels are original equipment aboard government and commercial vessels including the SAFE Boats Defender 380x. 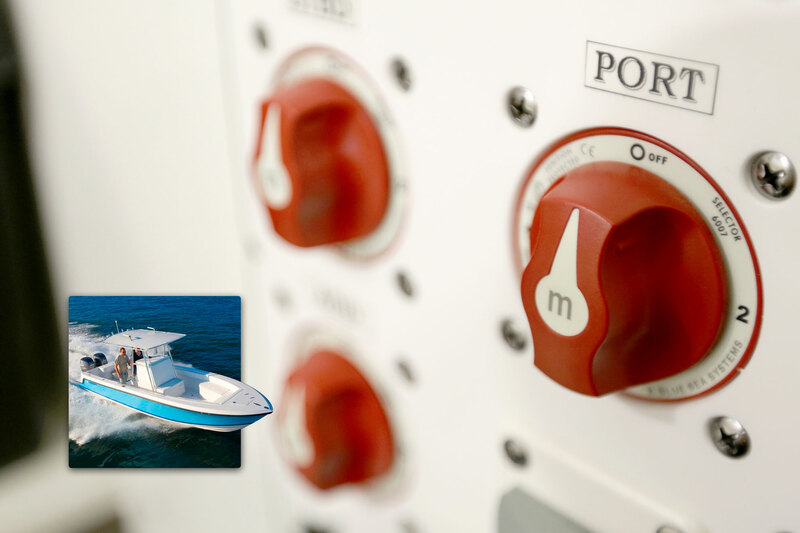 SAFE Boats specifies Blue Sea Systems busbars aboard their boats, including in the control room of the Apostle 38 Center Console. 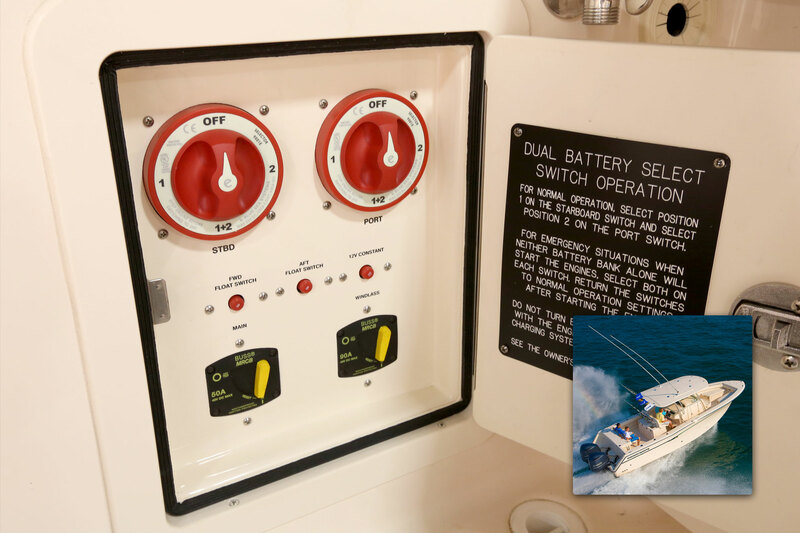 SAFE Boats specifies the 6011 m-Series Dual Circuit Plus™ Battery Switch aboard their boats, including the Archangel 38 Center Console. 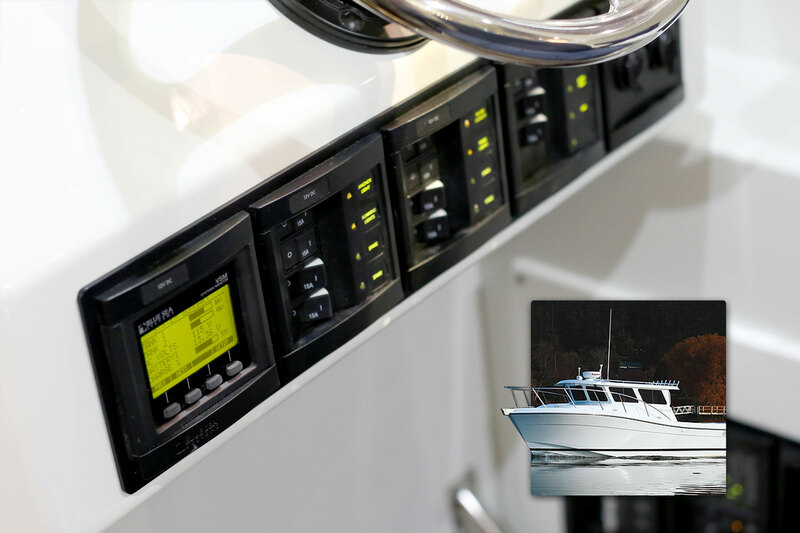 Sailfish boats use Blue Sea Systems 6011 m-Series Dual Circuit Plus™ Battery Switches aboard their boats, including the 290CC. 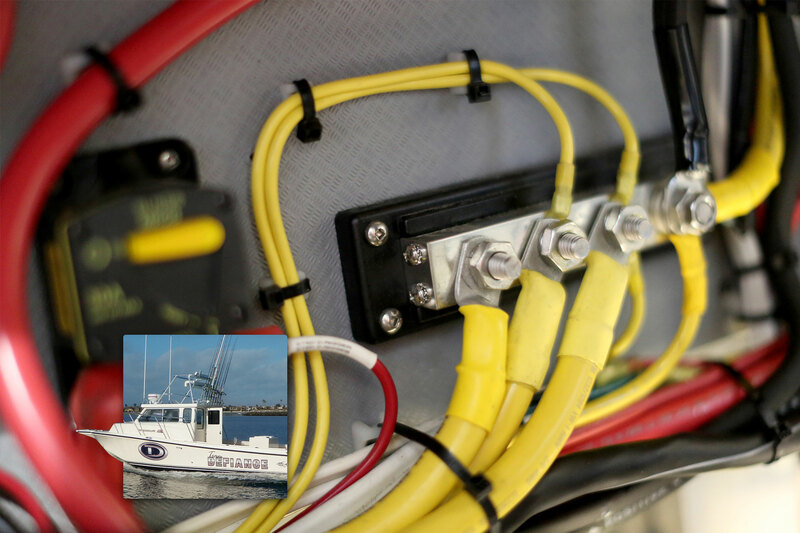 Scout Boats installs the Blue Sea Systems 6006 m-Series Battery Switch at the center console of the 177 Sportfish. 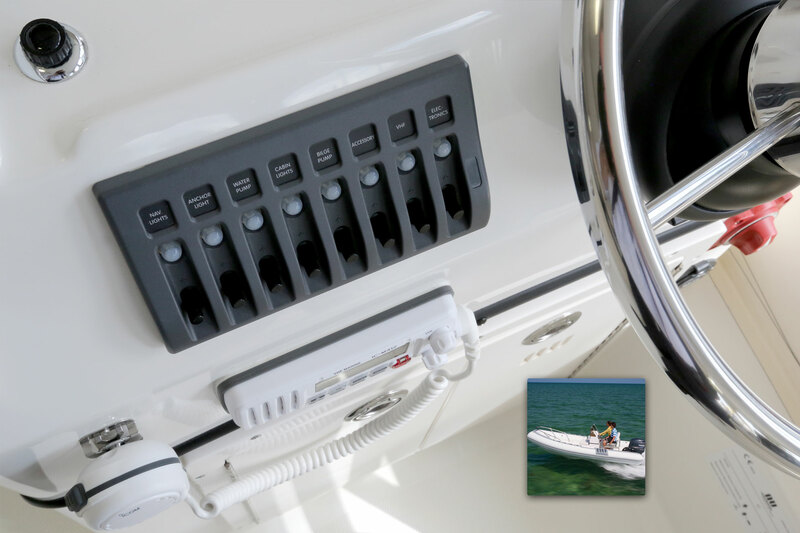 Scout Boats installs the Blue Sea Systems 6011 m-Series Dual Circuit Plus™ Battery Switch™ at the center console of the 32LXF Bay Boat. 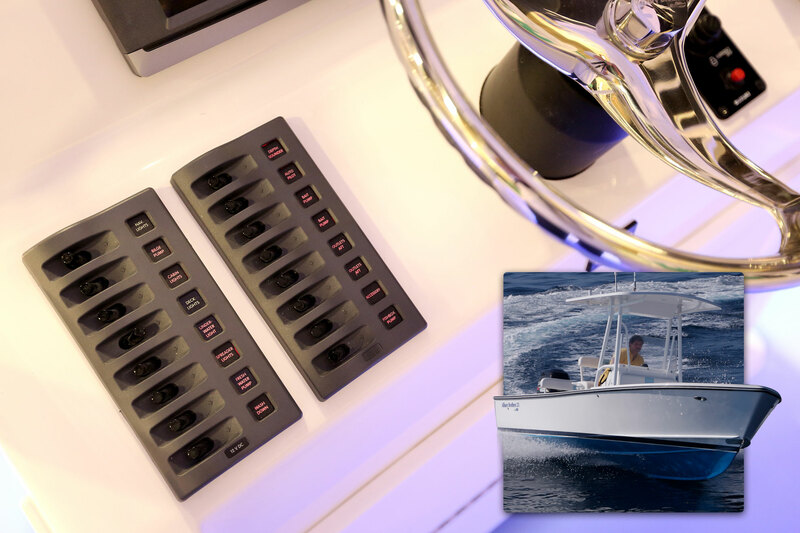 SeaForce IX builds custom sportfishing and cruising yachts which rely on Blue Sea Systems HD Heavy Duty Battery Switches for battery management in the engine room. 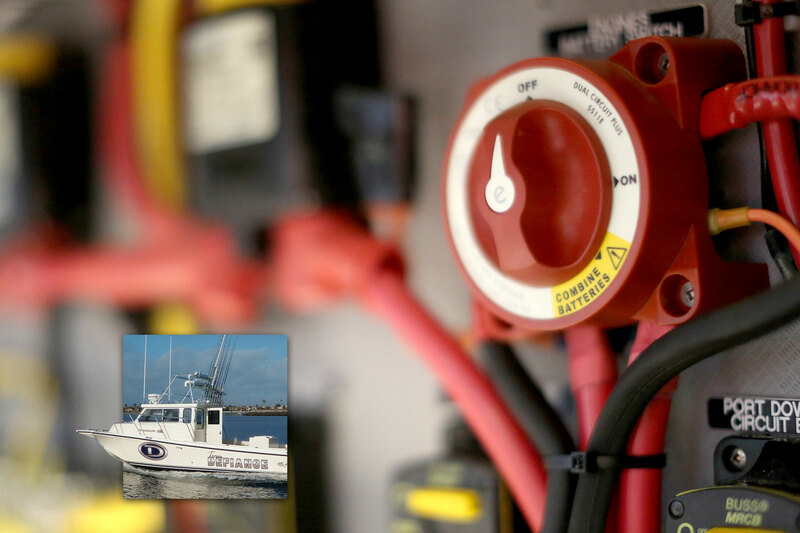 Sea Fox Boats installs the Blue Sea Systems 5511e e-Series Dual Circuit Plus™ Battery Switch at the helm of the 286 Commander. 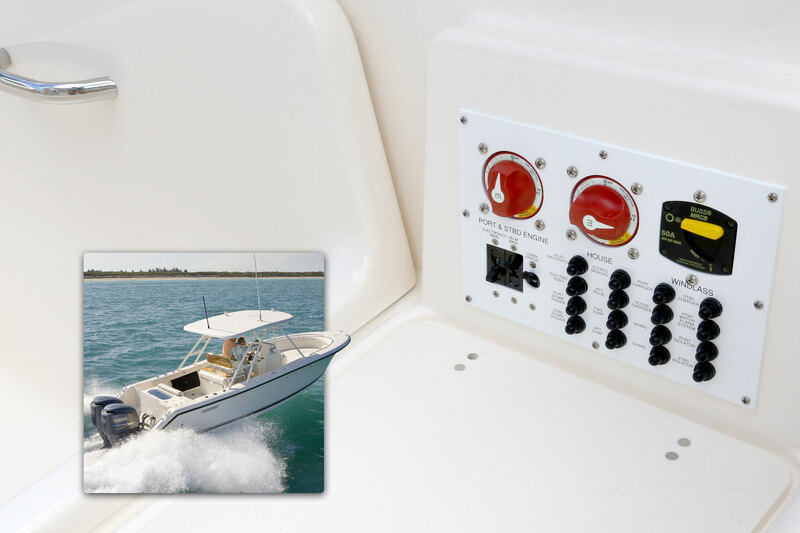 Sea Fox Boats installs the Blue Sea Systems 6007 m-Series Battery Switch on the center console aboard the 220 Viper. 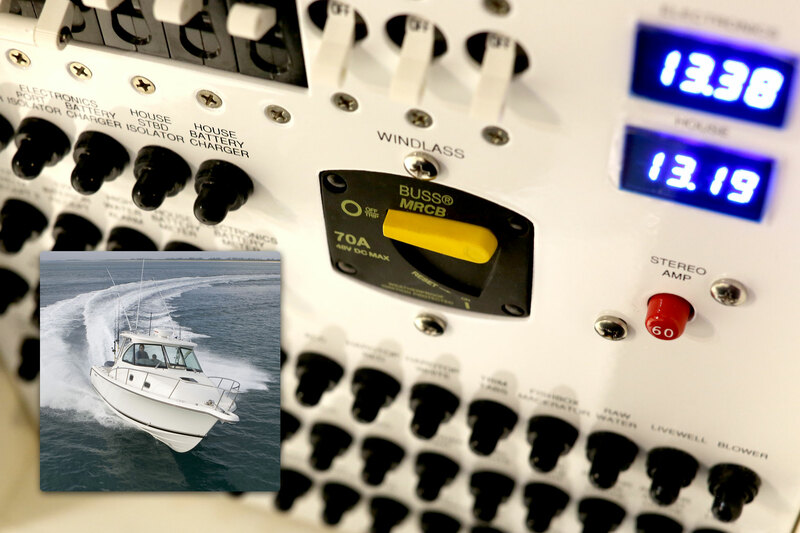 Sea Fox Boats installs the Blue Sea Systems 6007 m-Series Battery Switch on the center console aboard the 240 Viper. 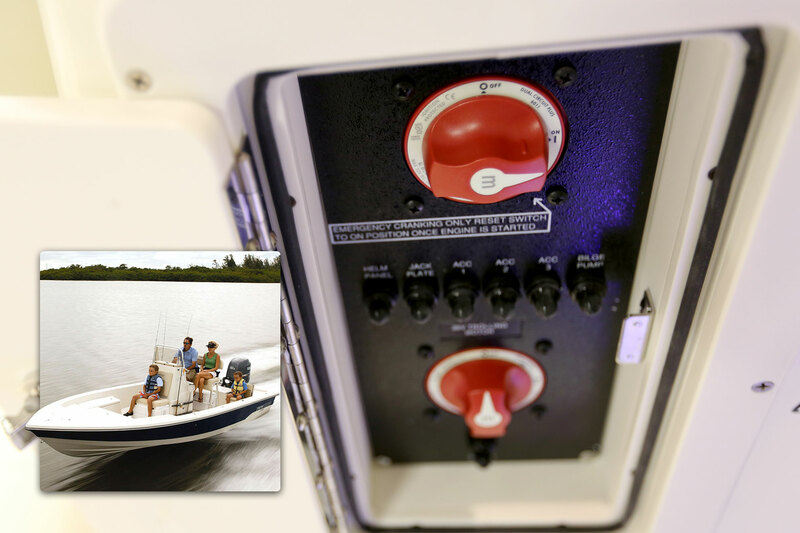 Sea Fox Boats installs the Blue Sea Systems 6007 m-Series Battery Switch on the center console aboard the 200 Viper. 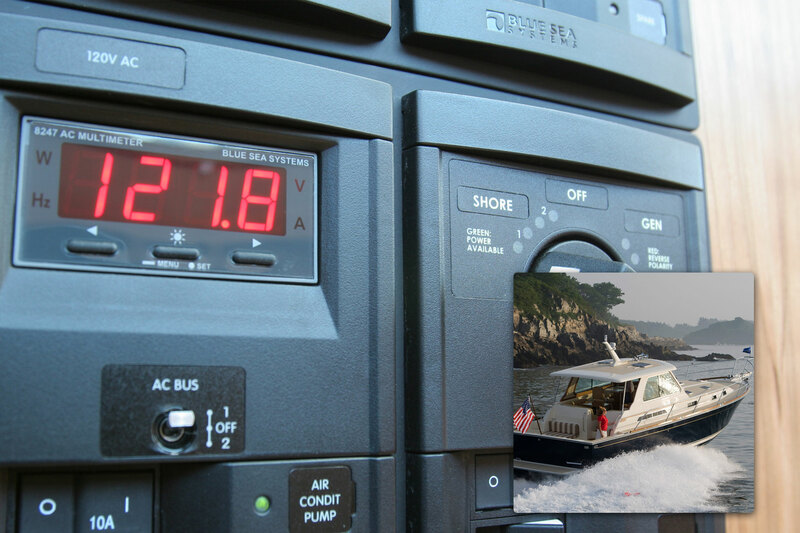 SeaVee Boats installs the Blue Sea Systems 8248 DC Digital Multimeter in the panel aboard the 390 Outboard. 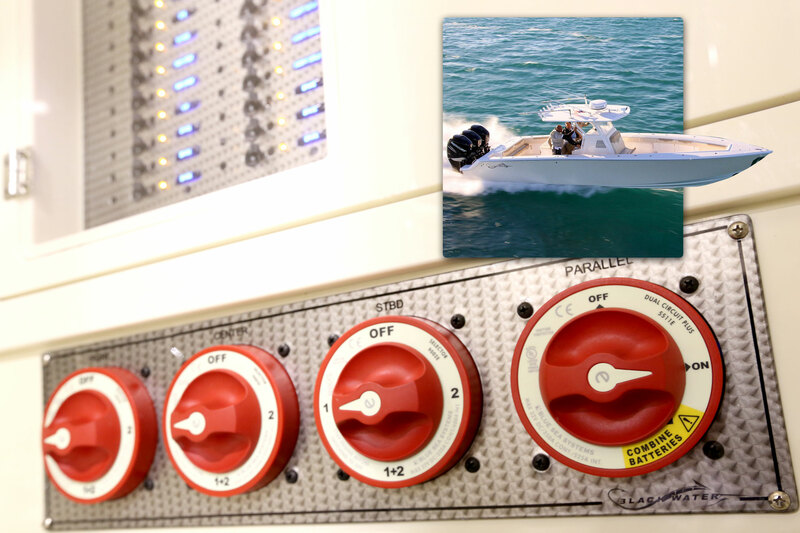 Skeeter relies on the Blue Sea Systems 6007 m-Series Selector Battery Switch for battery management aboard the SX2250. 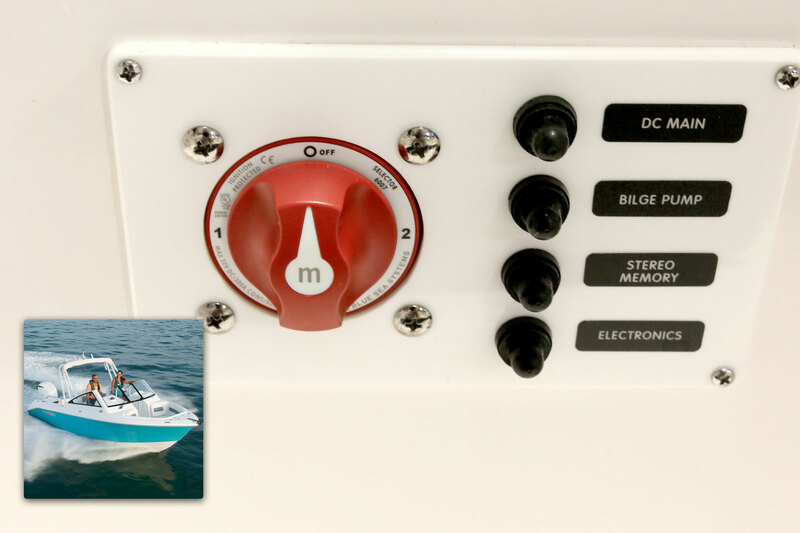 Sportsman Boats installs the Blue Sea Systems 6005200 m-series Battery Switch aboard the Masters 247 Bay Boat. 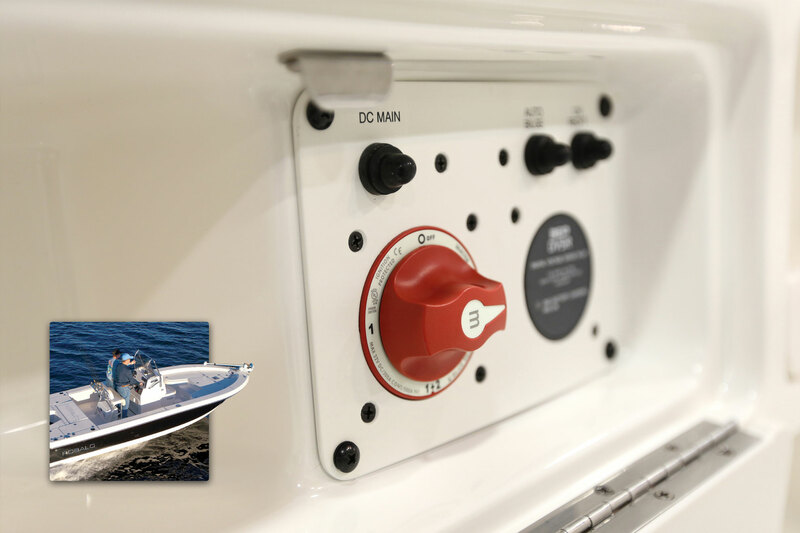 Sportsman Boats installs the Blue Sea Systems 6007 m-series Battery Switch aboard the Masters 207 Bay Boat. 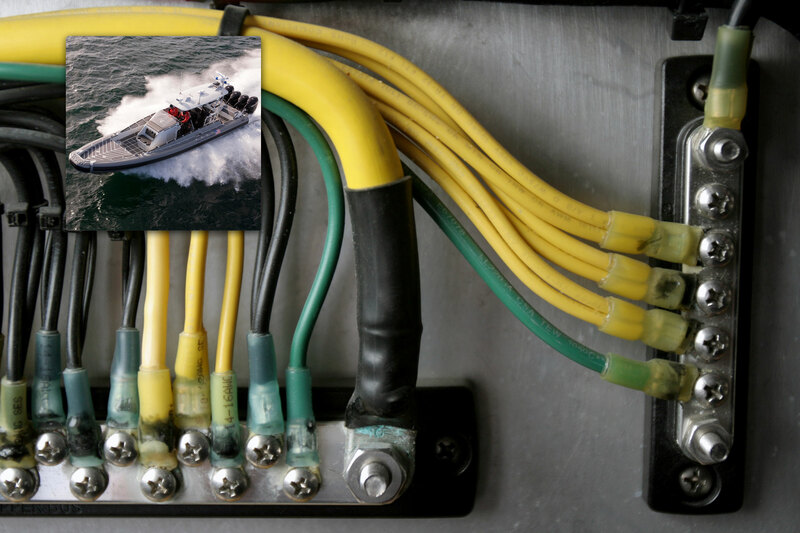 Statement Boats uses several Blue Sea Systems fuse blocks including the 5005 ANL Fuse Block for high amp loads aboard the 38 SUV Outboard. 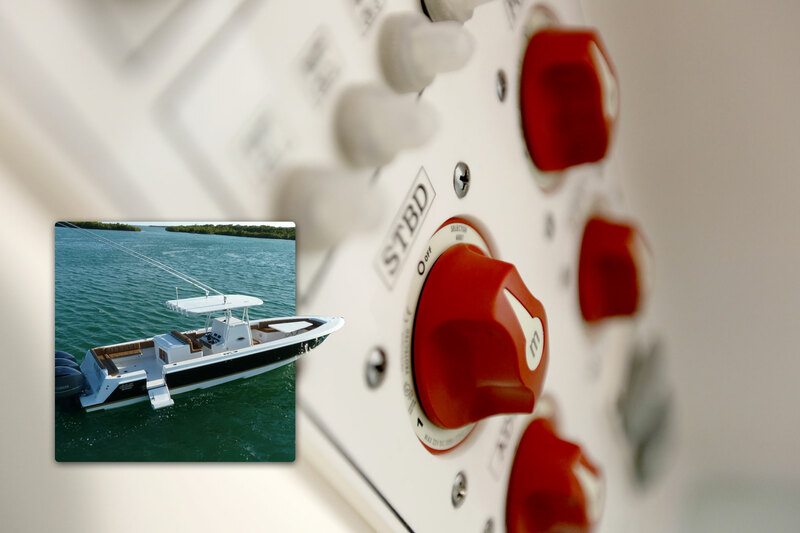 Statement Boats builds luxurious boats and relies on a bank of Blue Sea Systems 6007 Mini Selector Switches for battery management aboard the 38 SUV Outboard. 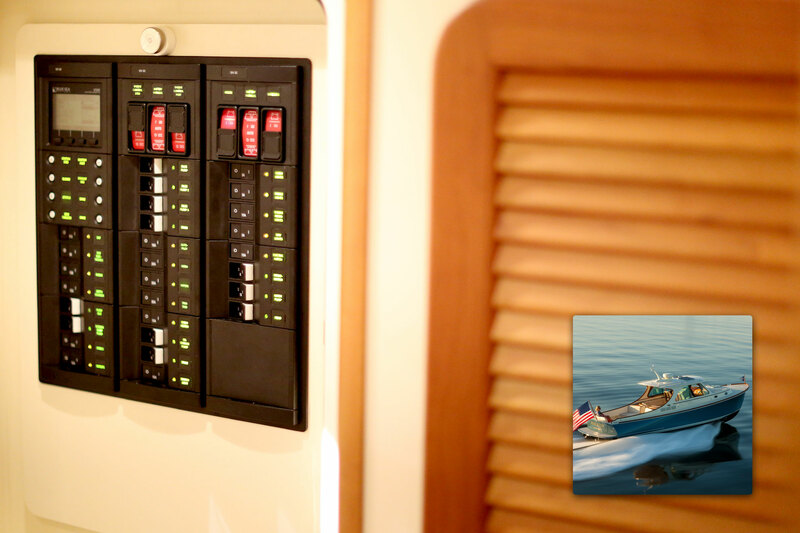 Statement Boats uses Blue Sea Systems CLB circuit breakers for resettable circuit protection aboard the 38 SUV Outboard. 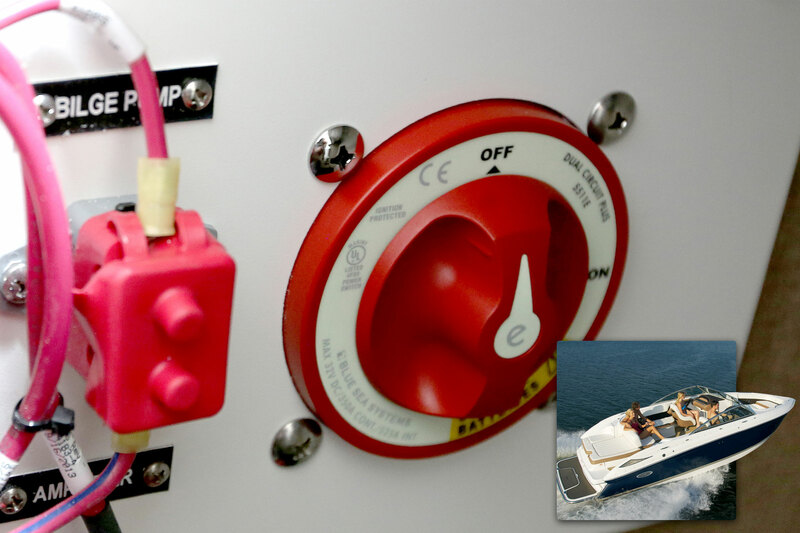 Tahoe Boats relies on Blue Sea Systems circuit protection devices including the 5026 ST Blade Fuse Block on their boats, including the Q41 Ski/Fishing boat. 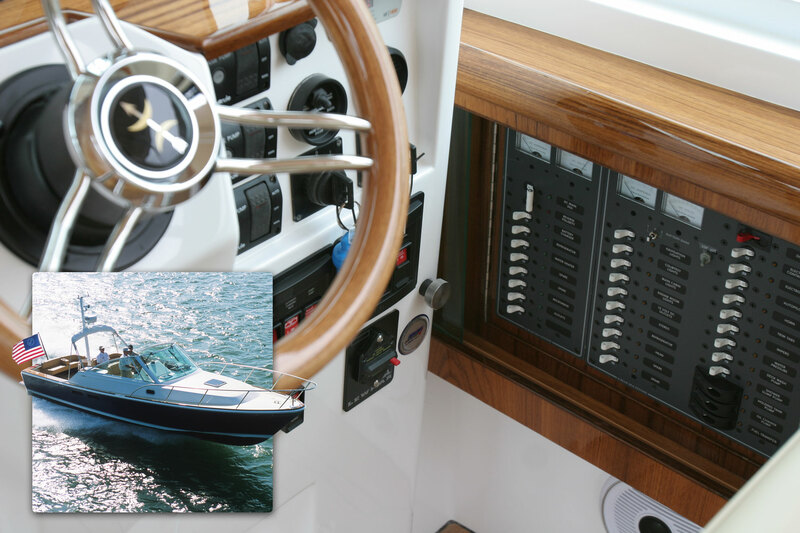 Tartan Yachts specifies flat rocker breakers into the Blue Sea Systems Custom 360 Panels in the nav station aboard the 4000. 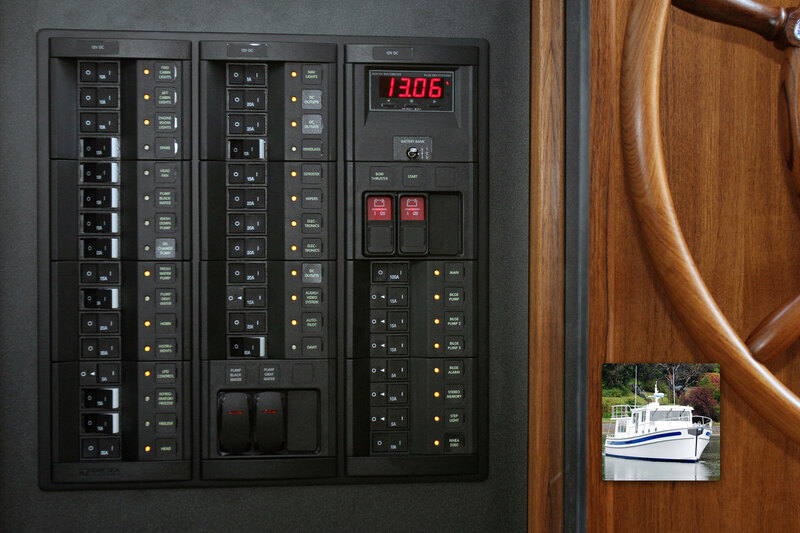 Tartan Yachts designs Blue Sea Systems Custom 360 Panels into the nav station of the Tartan 4000 for power distribution. 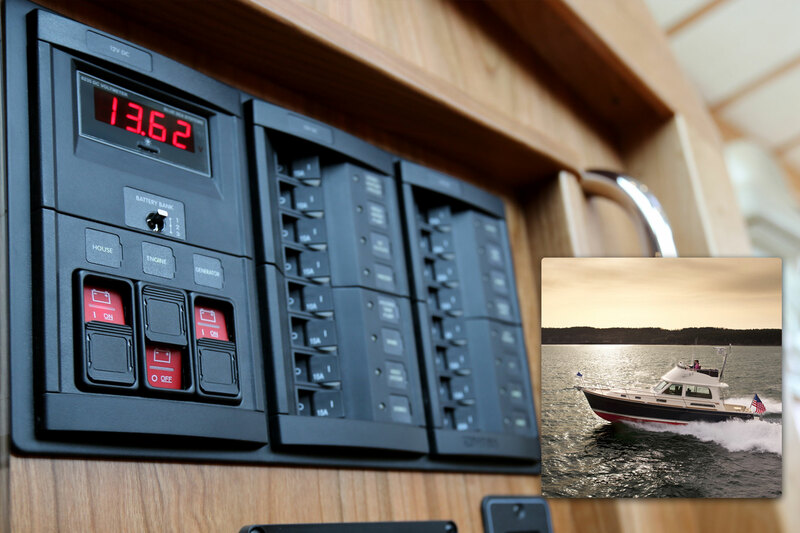 Tartan Yachts uses a bank of 6011200 m-Series Dual Circuit Plus™ Battery Switches aboard the Tartan 4000 for battery management. 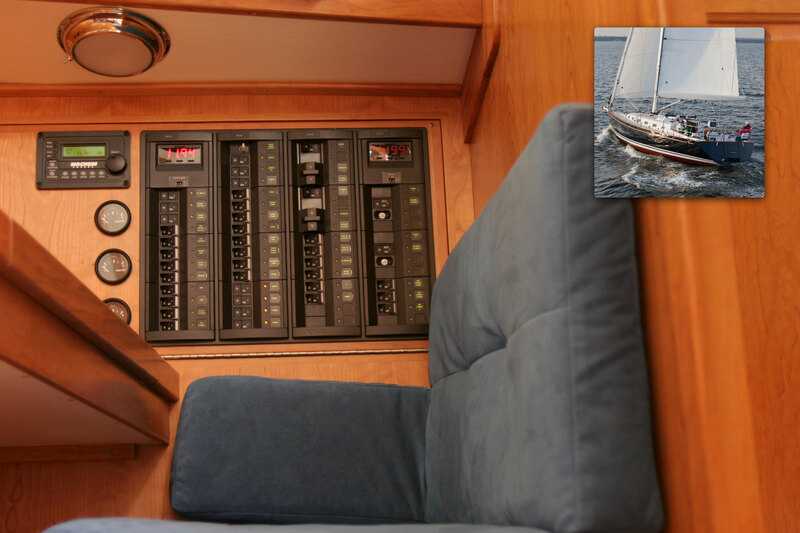 Tiara Yachts uses Blue Sea Systems products aboard the 3600 Coronet including the 8025 DC Traditional Metal Subpanel. 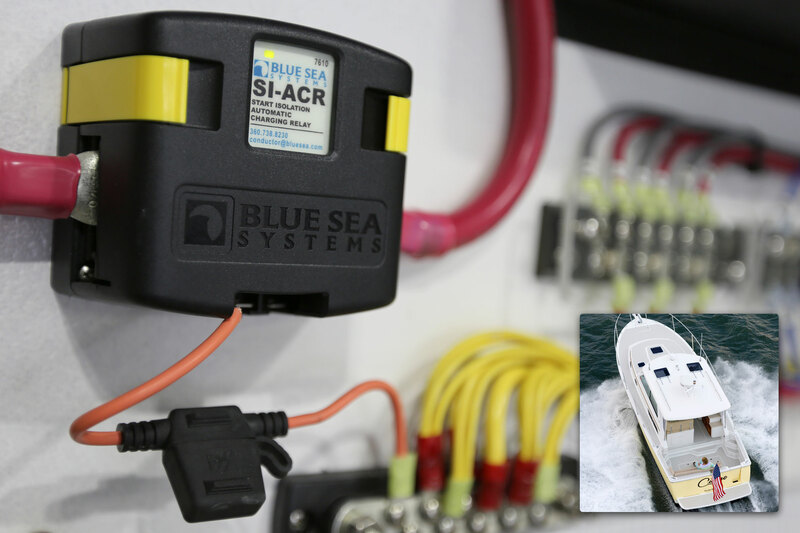 Tracker Boats relies on the Blue Sea Systems 5026 ST Blade Fuse Block aboard their high performance Pro Team 175. 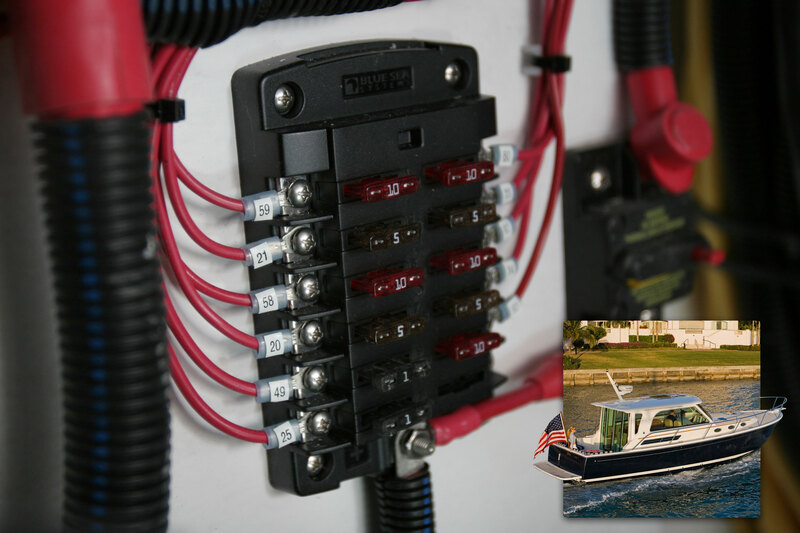 Tracker Boats specifies the 5026 ST Blade 12-circuit fuse block aboard all their Pro Guide models, including the V-175 WT. 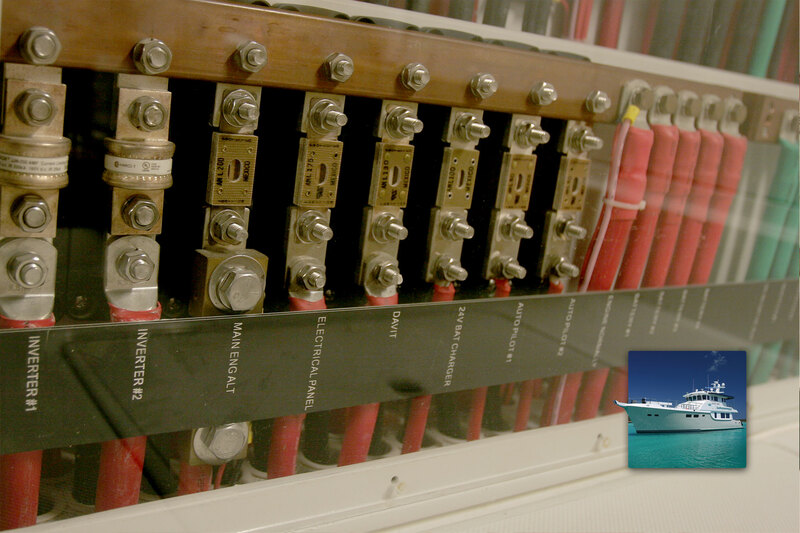 The ST CLB Circuit Breaker Block is standard equipment aboard the True North 38. 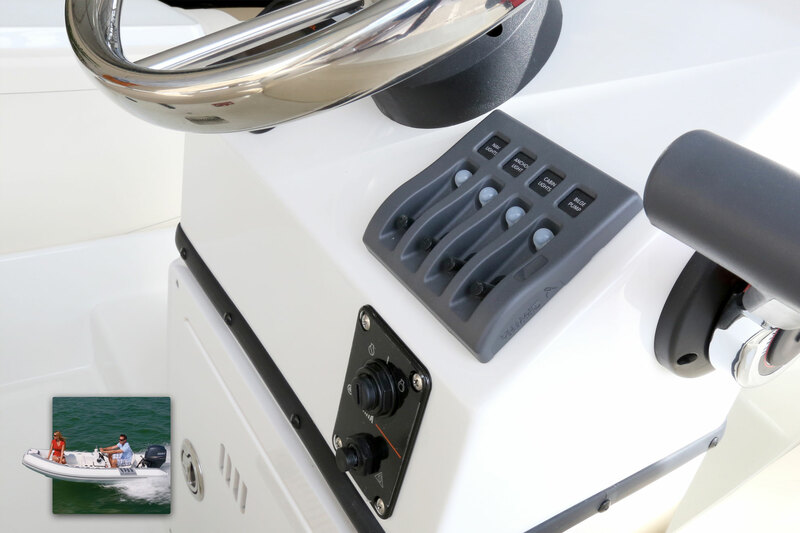 Vicem Yachts builds the Windsor Craft 40 Hardtop and uses Blue Sea Systems products, including the 8381 and 8086 Traditional Metal Panels, at the helm to control all power distribution. 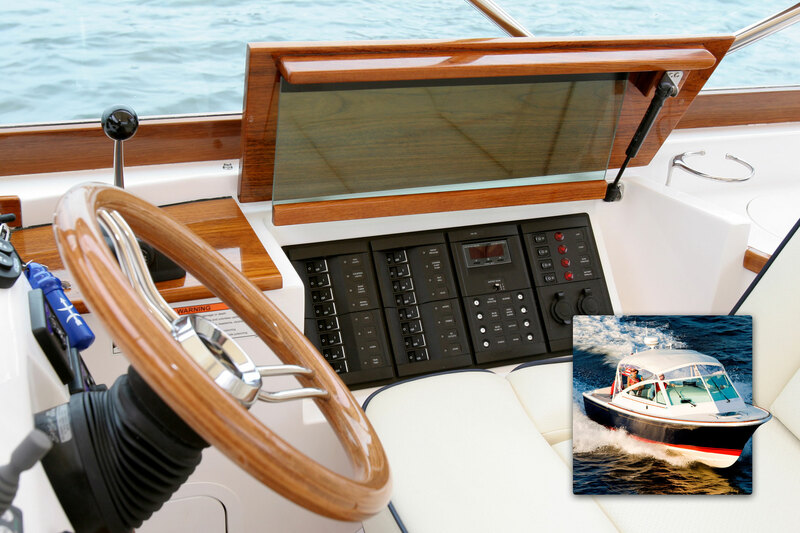 Vicem Yachts builds the Windsor Craft 36 Hardtop and uses Blue Sea Systems products, including the 8381 and 8086 Traditional Metal Panels, at the helm to control all power distribution. 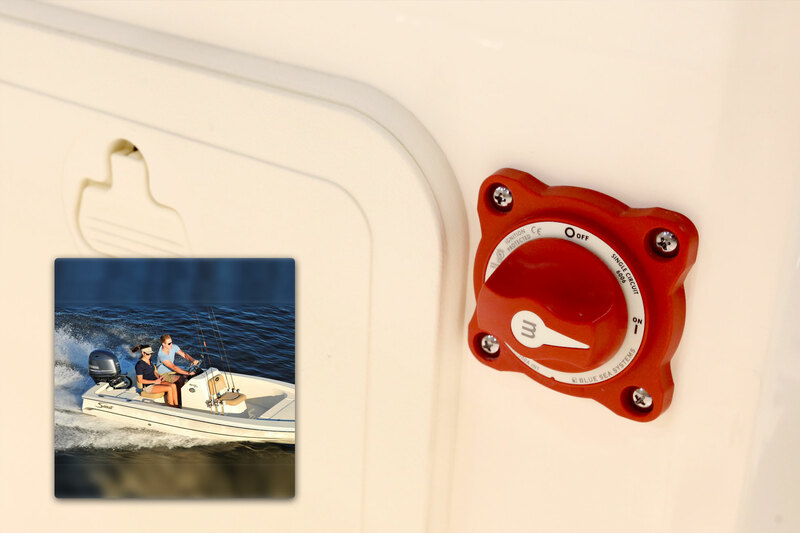 Wellcraft Boats mounts the waterproof 6007 m-Series Selector Battery Switch at the helm of the 232 Fisherman. 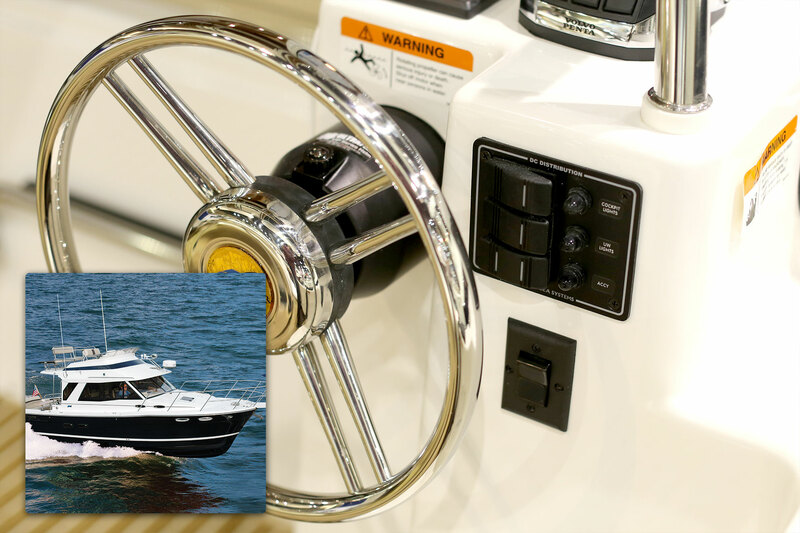 Yamaha Boats of Japan specifies Blue Sea Systems ML-series remote battery switches controlled by 2155 Remote Control switches aboard the SR310.